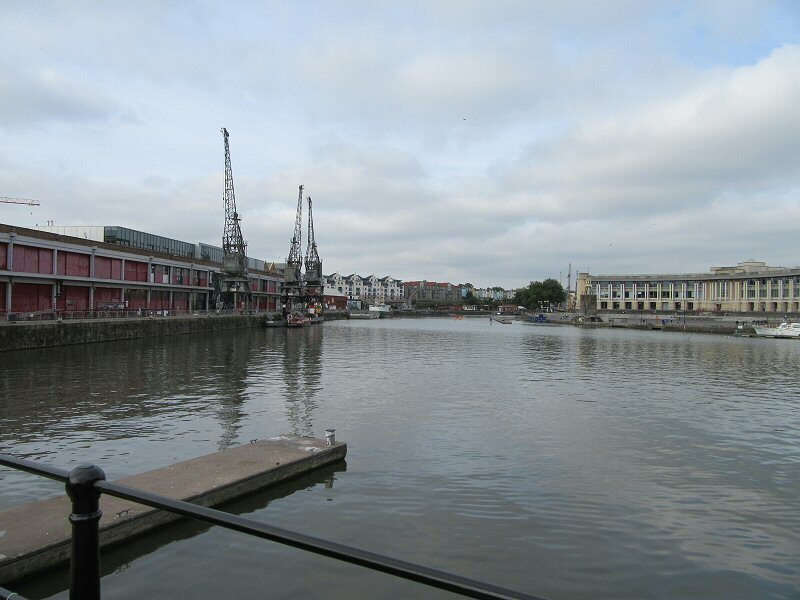 For quite some time I have been mulling over a return trip to Bristol, I wanted to go already in 2017 but the weather was just not amiable to a day trip so I kept on putting it off. 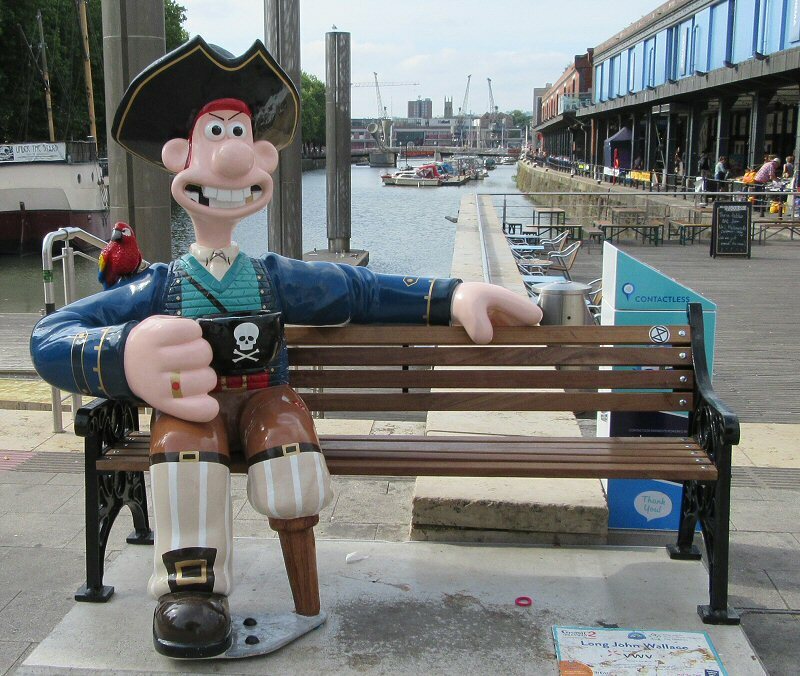 However, by the time I was planning Liverpool I was already looking at Bristol once again. 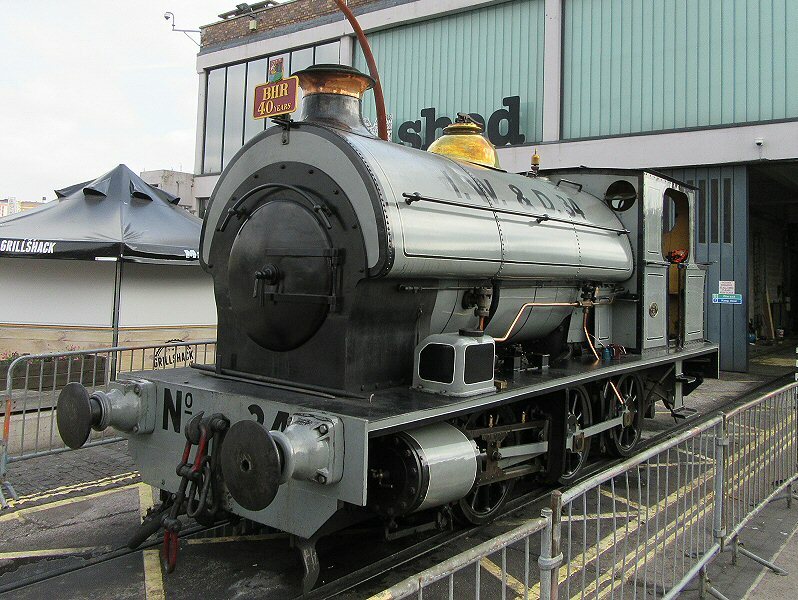 In 2015 I had been fortunate enough to be there for the Heritage Festival, so ideally I wanted to do the same once again. The closest window being the weekend of 21 and 22 of July 2018. 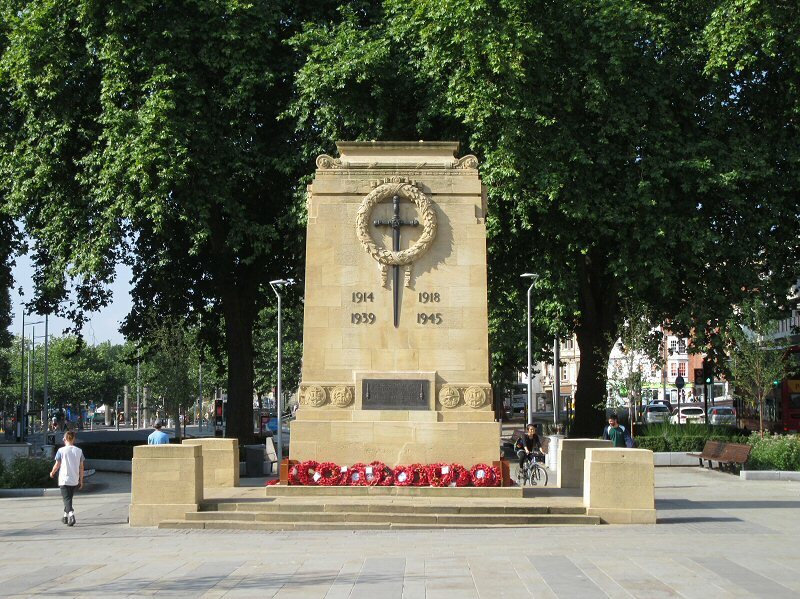 And, just for once I was not going via Arnos Vale Cemetery but was going to strike out North West to find the Cenotaph. 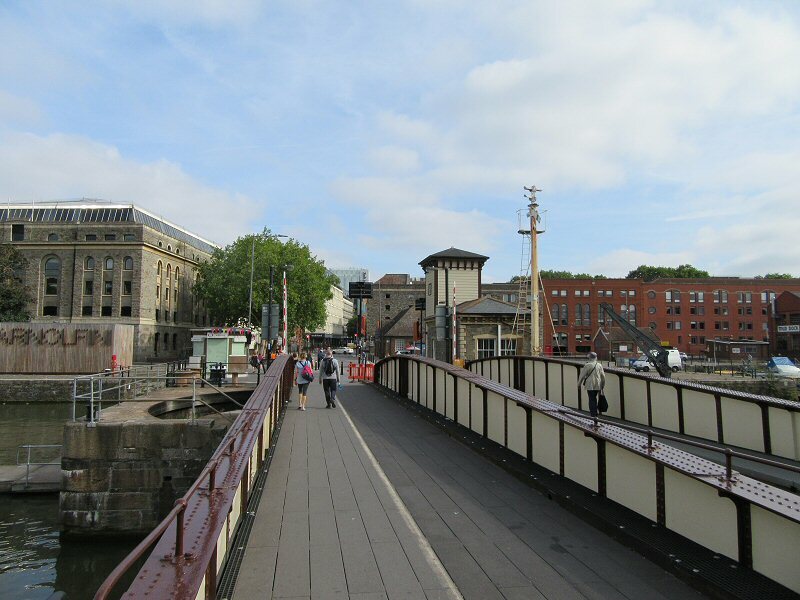 I had never really ventured into Bristol so had no real idea of what was out there, but it is an old city so you can bet there were some wonderful old buildings to see. 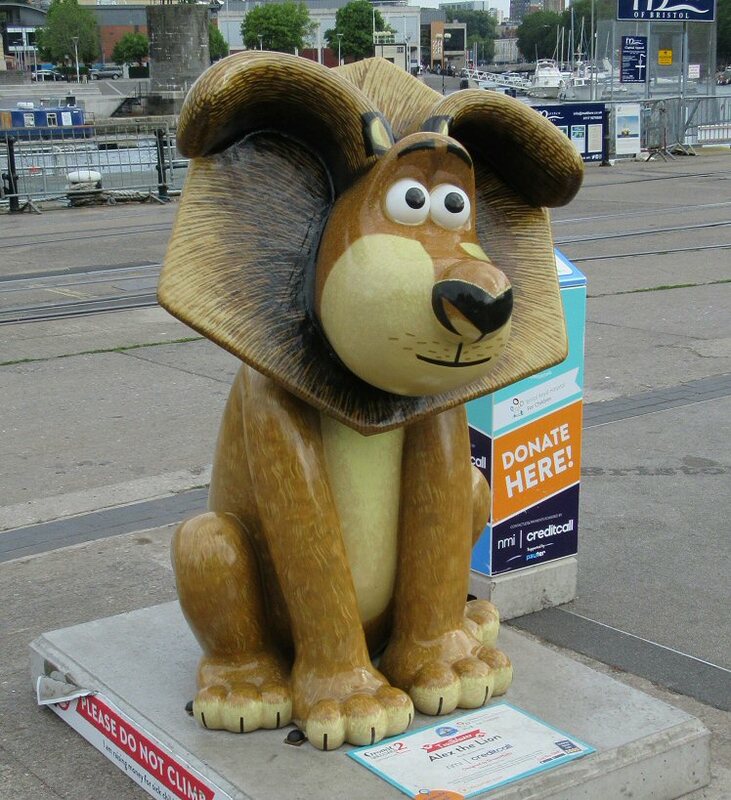 I arrived at Bristol Temple Meads station bright and early. 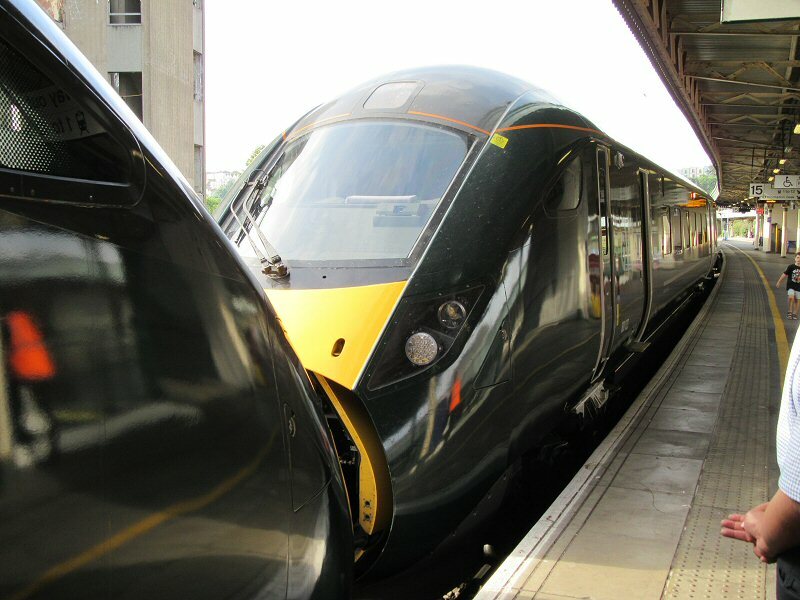 It had been touch and go though because the weather forecast had been for clouds and possible rain and I was not feeling very energetic when I woke up at some ungodly hour to get to Ashchurch for Tewkesbury Station. 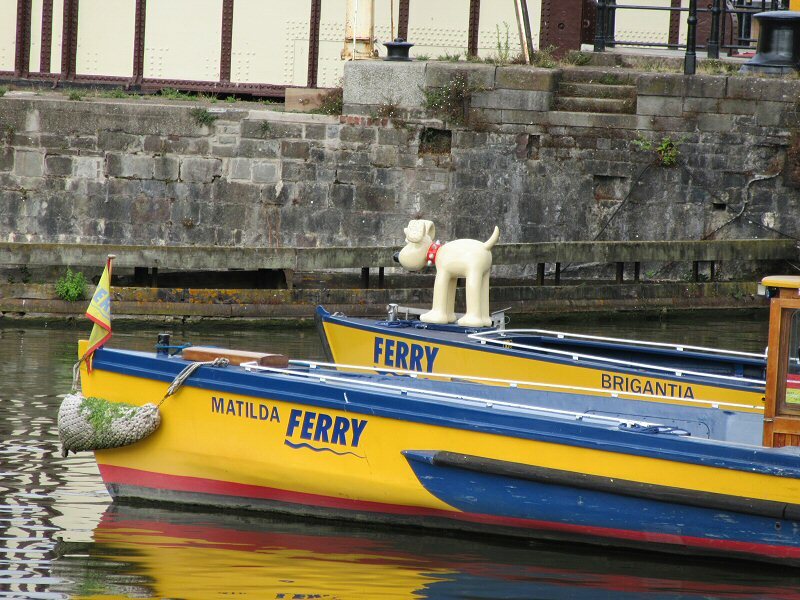 I will skip all that malarky and continue from where I am in Bristol. There is one of those horrible traffic circles that I needed to navigate across, hoping to find the one branch that is Victoria Street. Unfortunately they were building a road in the middle of the street which threw my navigation off. A similar thing had happened to me when I visited Birmingham in 2015 and I suspect they are still digging and excavating there. The correct road selected and I was off… and then had to stop and go have a look at a church. Now I am a sucker for churches and old buildings, and I do love a good set of ruins. This one fitted all the criteria in one space. 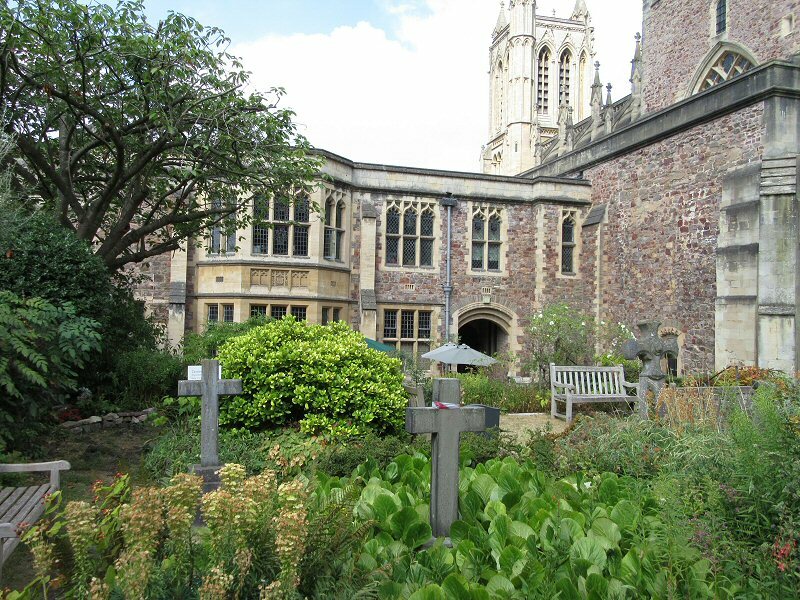 The space is called Temple Church and Gardens, and the church is really just a shell, and like the church I saw in Liverpool it too was damaged by bombing during the Second World War. 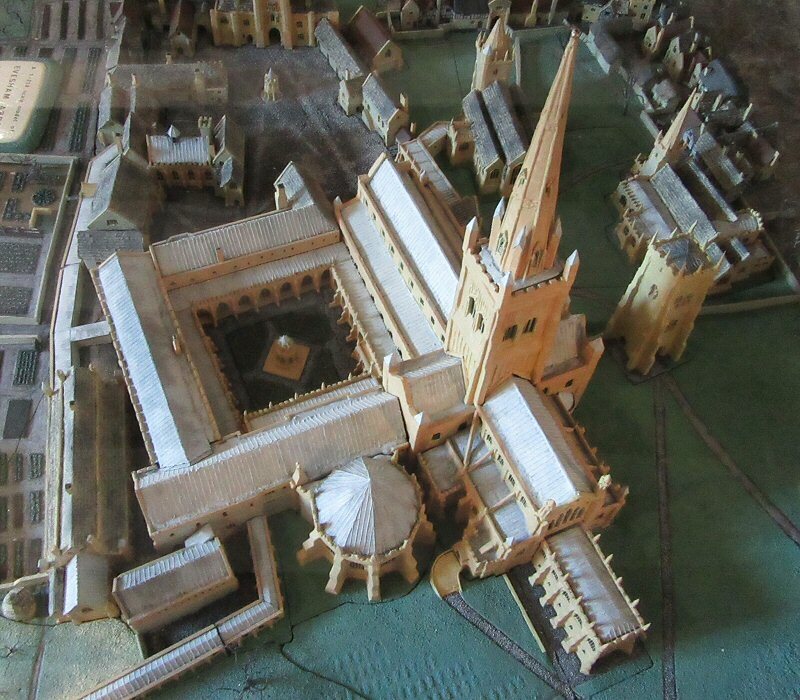 After the war they excavated the shell of the building and discovered that the church was originally round. 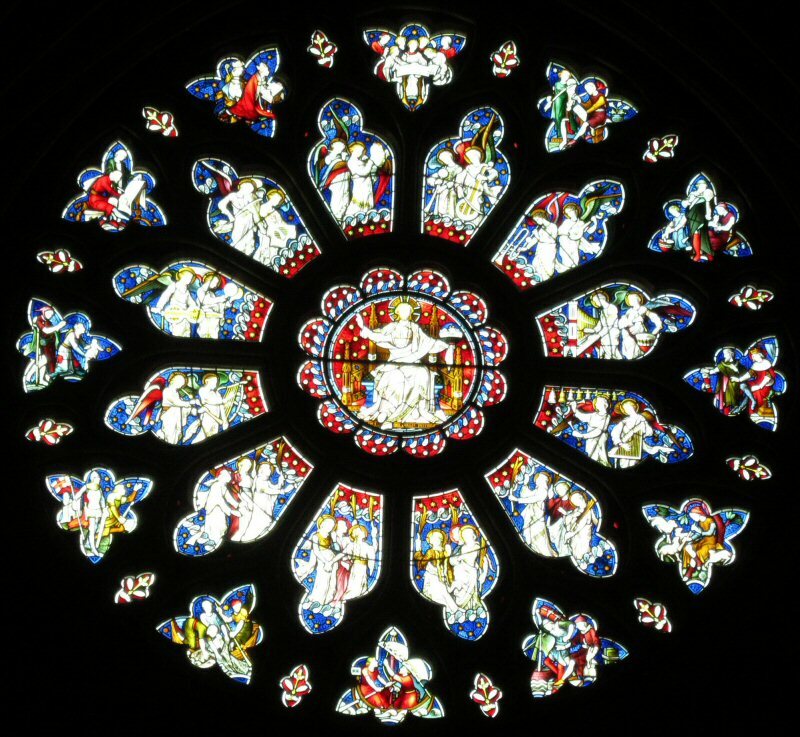 The round church was originally called Holy Cross and it was part of a monastery built here in the 1100’s by the Order of the Knights Templar. 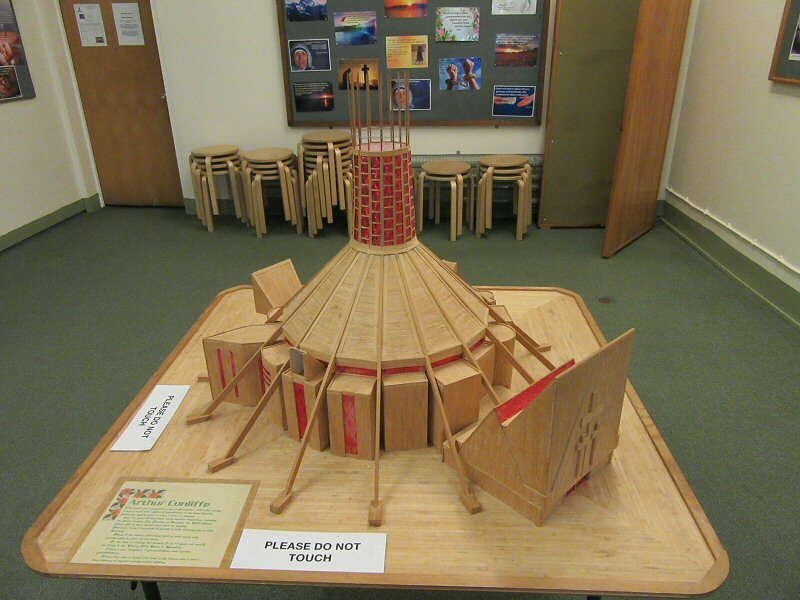 Their church was designed to look like the Church of the Holy Sepulchre in Jerusalem. 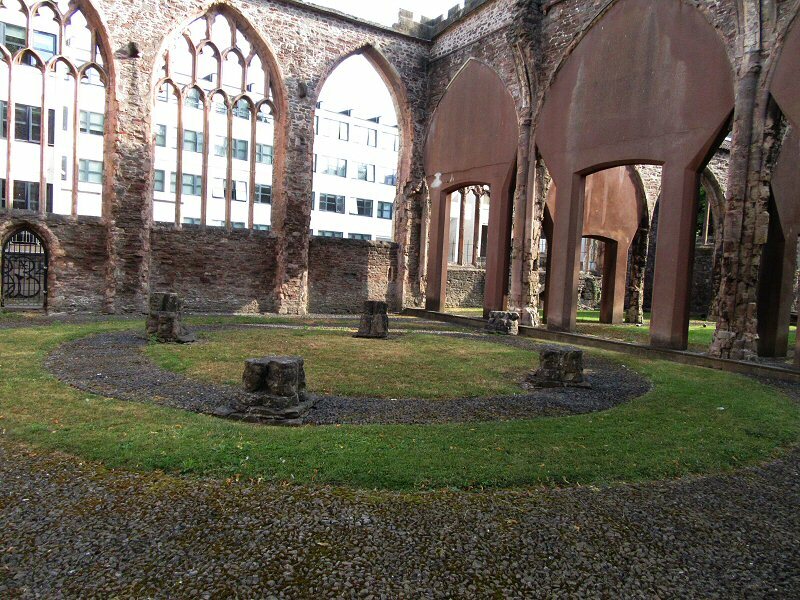 It was enlarged between 1300 and 1450 and lost its original round shape, and became the church that is there today, or should I say the ruins of the church? The other peculiarity about the building is that the tower leans by roughly 1,6 metres from the vertical, and the top was built so as to correct the lean, but it ended up looking somewhat odd as the lean increased. Unfortunately I never knew about this and the image I took of the tower does show the lean, but it is somewhat corrected by the camera lens. 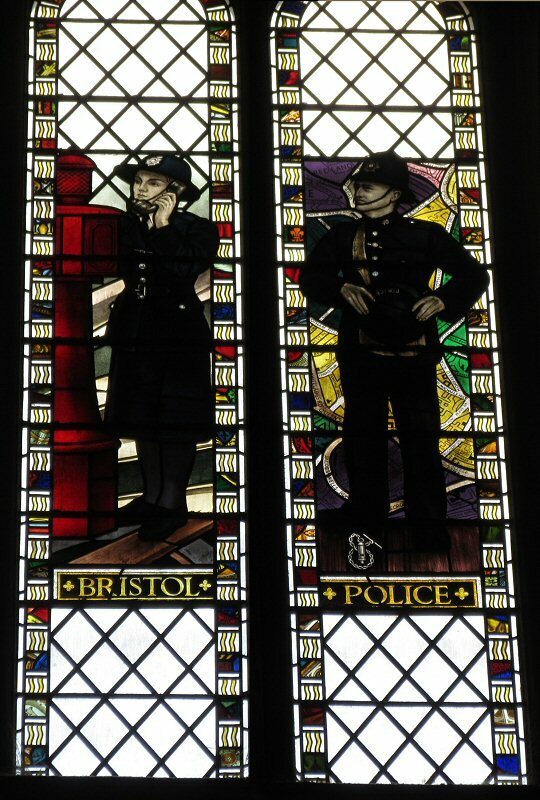 The church and a large portion of medieval Bristol was destroyed by a raid that occurred on 24 September 1940. 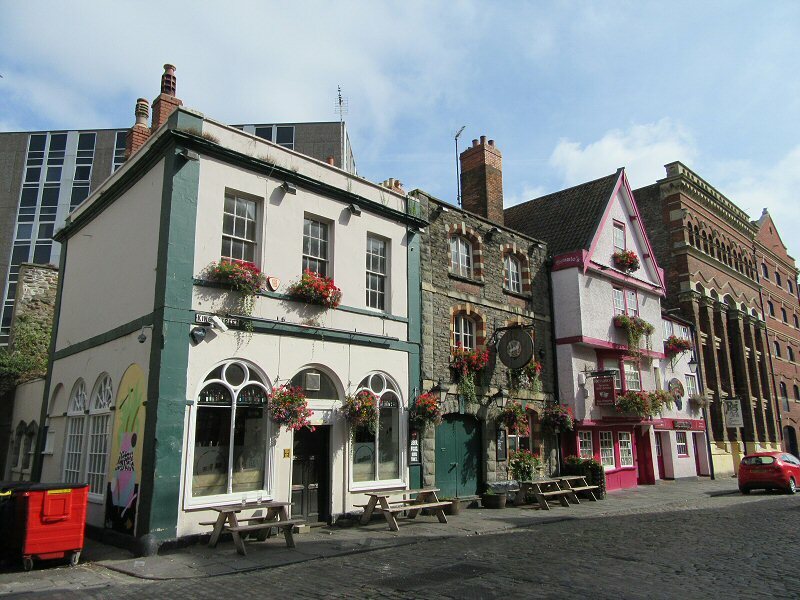 This area was known as “Temple” and in the medieval period it was where cloth workers lived and worked. 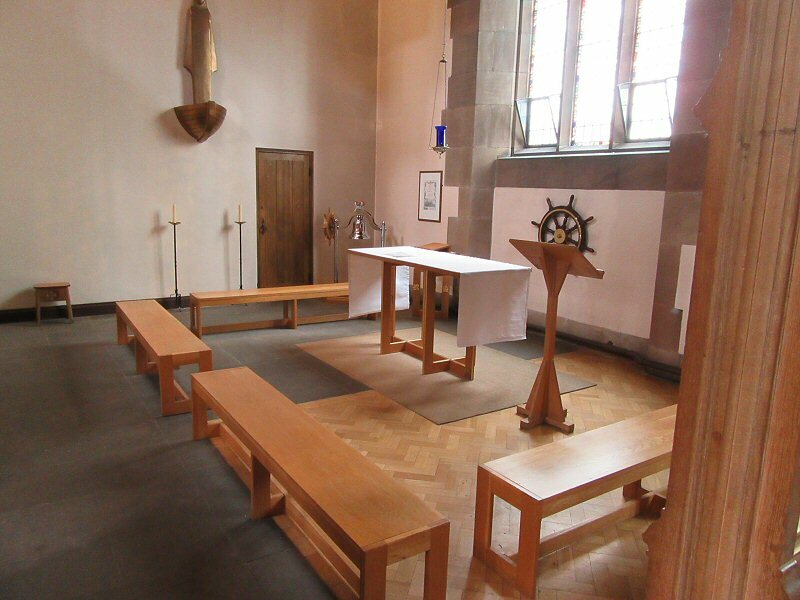 The Guild of Weavers even had their own chapel at the church. 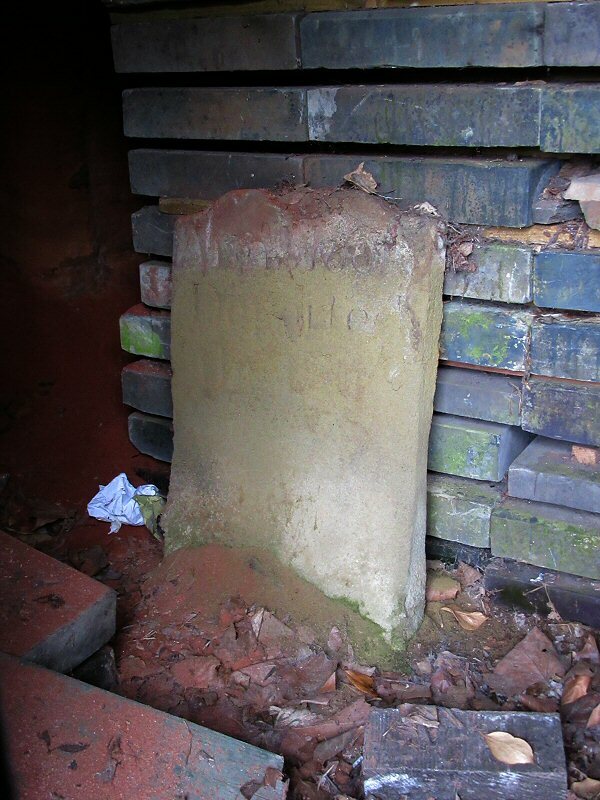 The churchyard around the church still has graves in it, although their legibility is very poor. 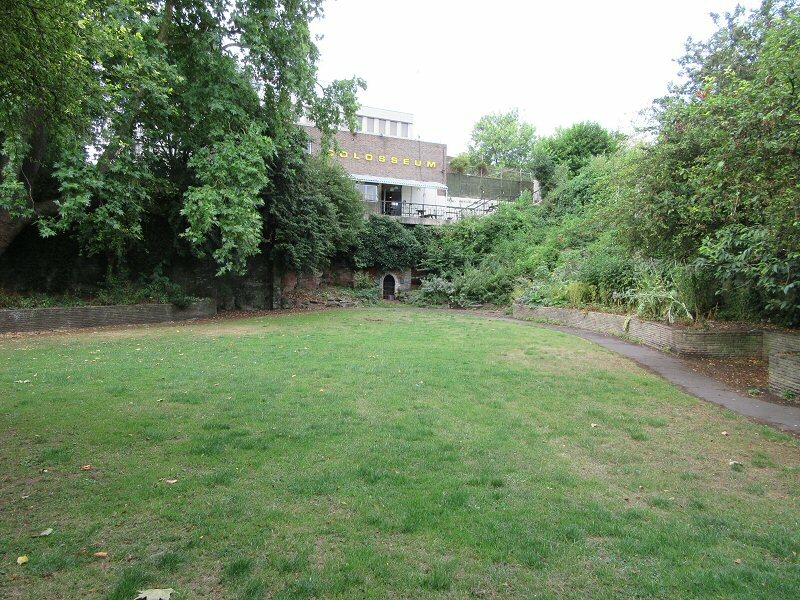 The area is now a well placed leisure space and I doubt whether anybody really knows that they may be strolling through a former churchyard. 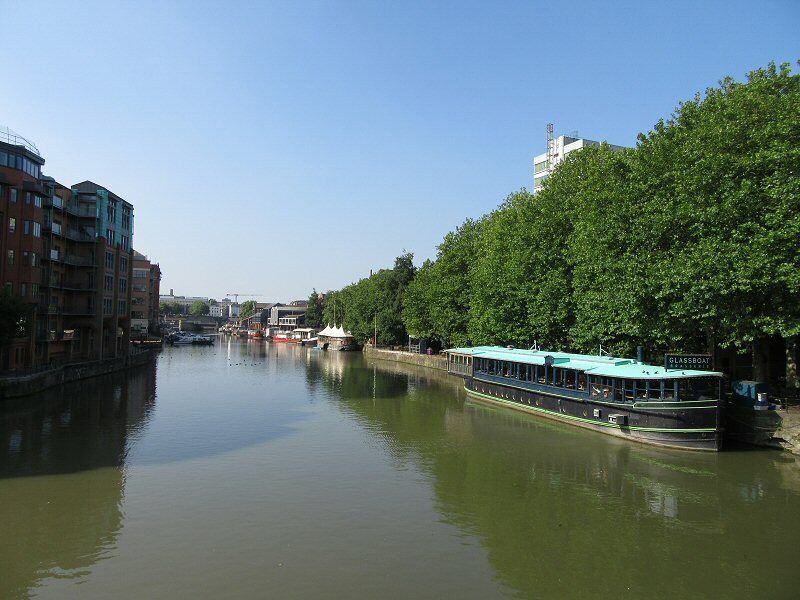 Following this discovery it was time to continue on my way, still in Victoria Street and heading towards The Bristol Bridge across the Avon. There was another ruined church on the east side of the bridge but I decided to give it a miss on this occasion. If I stopped and detoured all the time I would never get to where I was going. 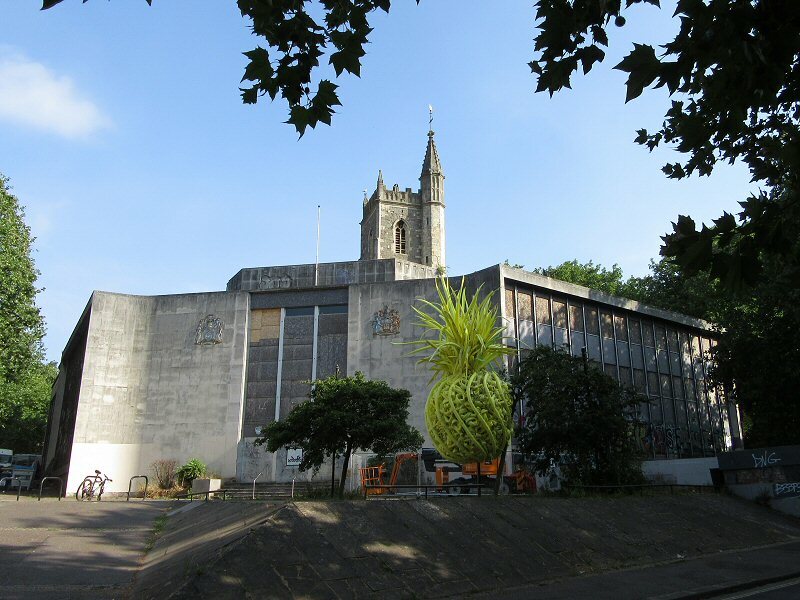 The green area just after the bridge is called Castle Park, and the next landmark is… a giant pineapple? 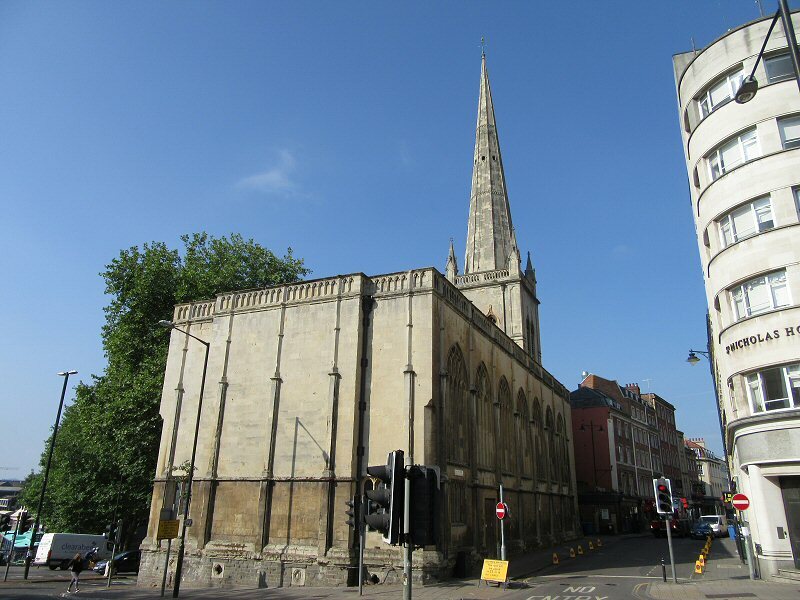 Actually the tower sticking out behind the building is the remains of St Mary-le-Port Church which was also destroyed during the bombing of 24 November 1940. 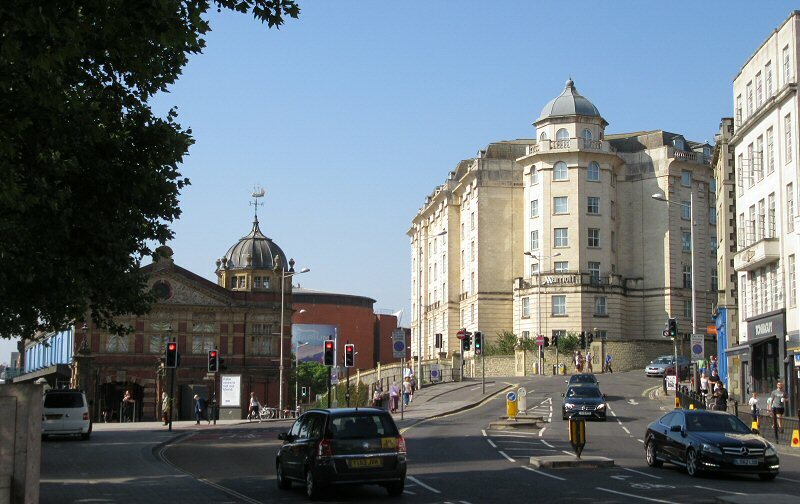 The buildings around it were built for Norwich Union (facing the camera) and the Bank of England. 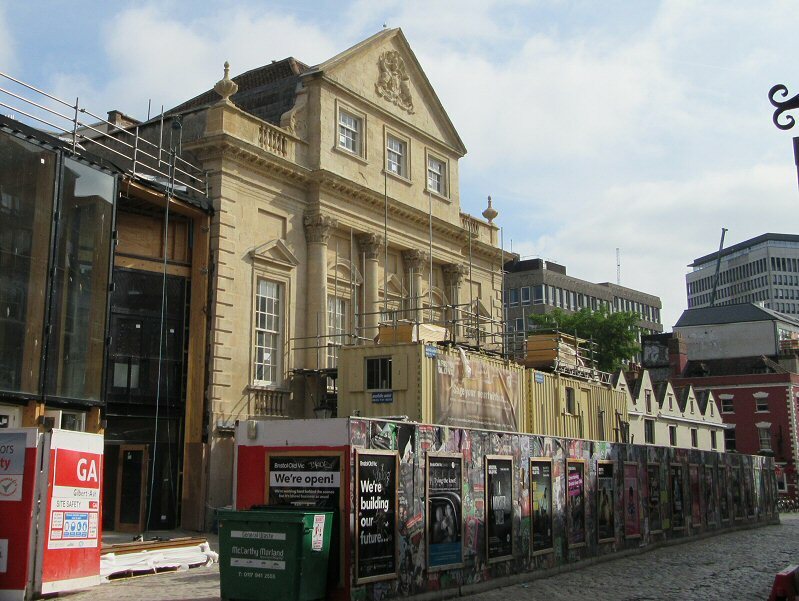 Both buildings are apparently empty and have been the subject of a number of contested plans for redevelopment. I cannot however comment on the pineapple, but it appears to be the work of Duncan McKellar. On the left side of the street is St Nicholas Church, and I had to get the shot very quickly because a large mobile crane was coming down the road and it was guaranteed to ruin any further images of the church. Maybe it was going to collect the pineapple? 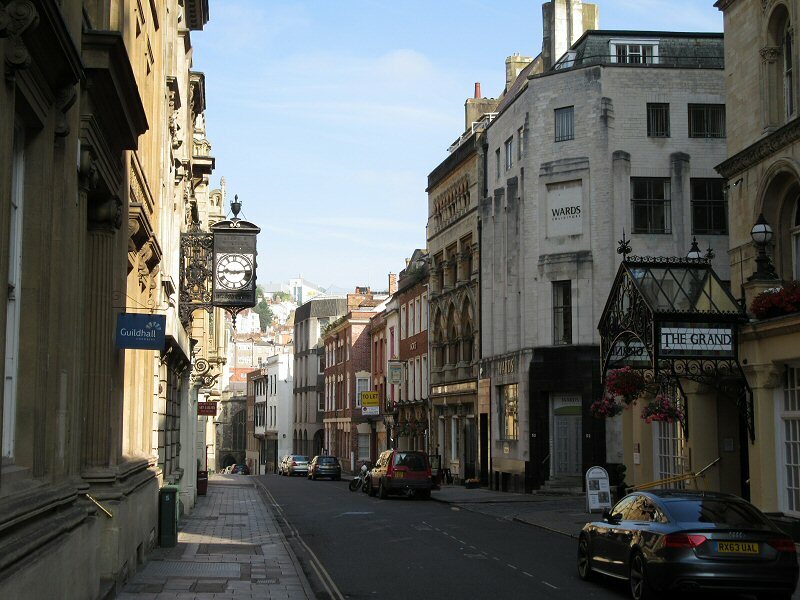 I was now in High Street heading into Broad Street, and there were a number of places that caught my eye. 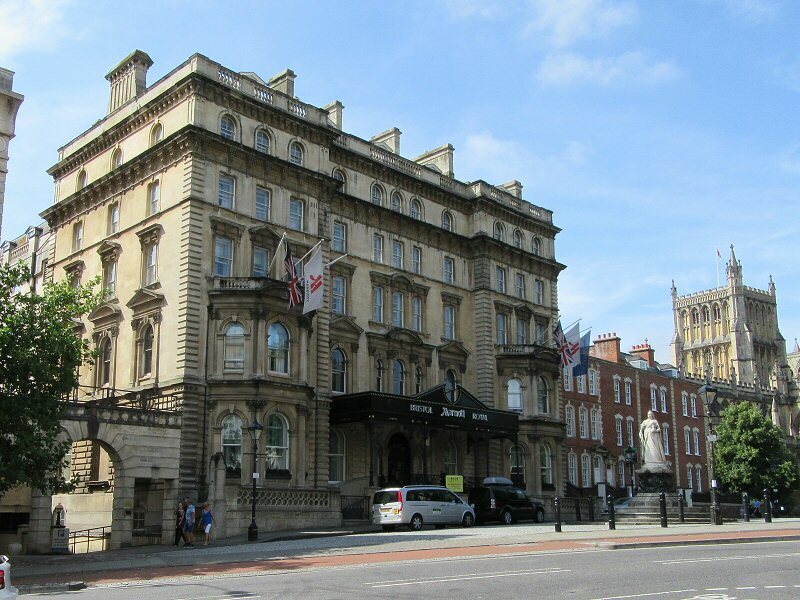 Broad Street was surprisingly narrow, and the Grand Hotel was really too big to even get a halfway decent pic of. As I descended further I felt almost hemmed in but at the end of the street was an archway that seemingly marked the end of this area. Actually, looking at it from Google Earth (centred around 51.454577°, -2.594112°) there is a lot to see, and I suspect this is quite an old area too. Definitely worth a return trip one of these days. Exiting out of the gate I had to turn left into Nelson Street and after a short walk could see the Cenotaph in the distance. This area had an incomplete feel about it and from what I gather had been redone not too long ago. The Cenotaph may be found at 51.454987°, -2.596391°. Sadly mankind has not learnt how to live in peace. 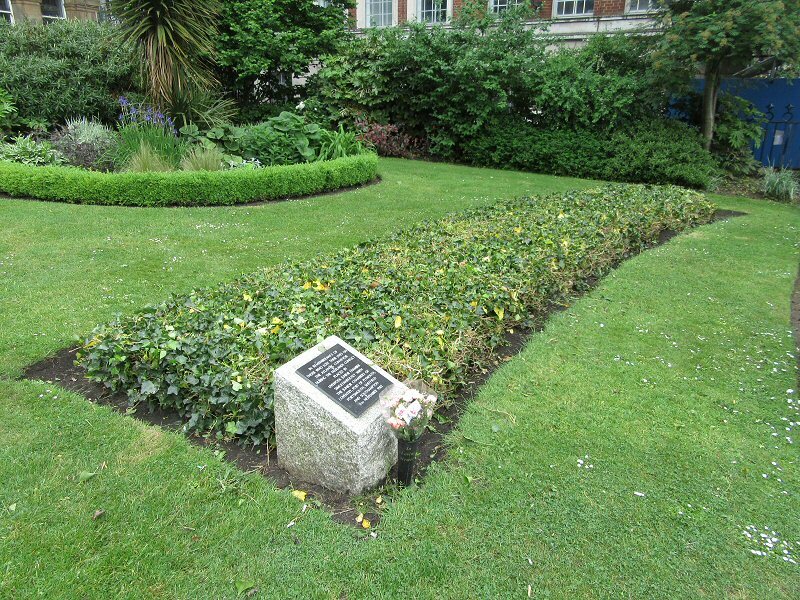 I have covered the Cenotaph in more detail on allatsea. 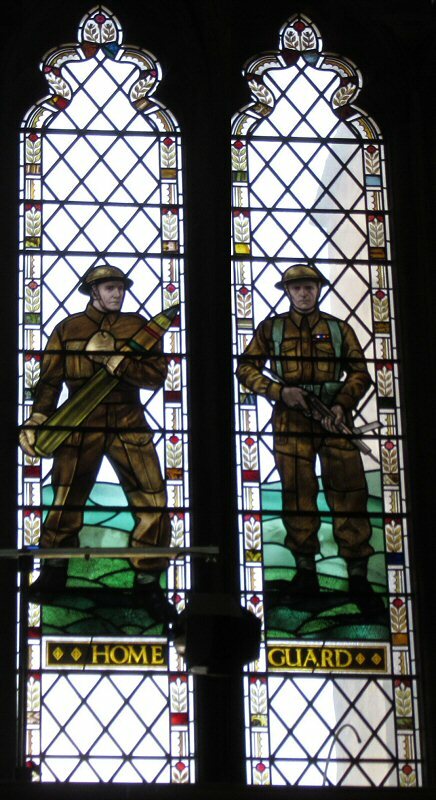 The Fourteenth Army 1942-1945. 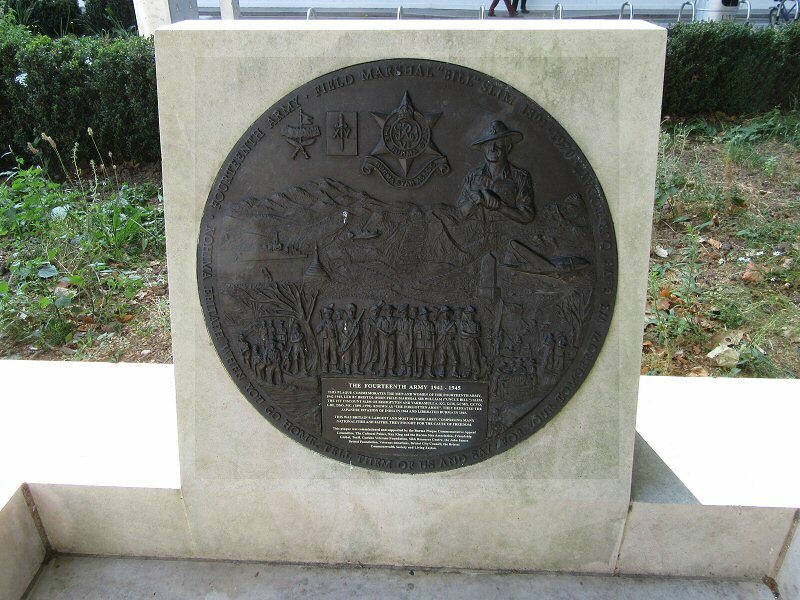 Known as “The Forgotten Army”, they defeated the Japanese Invasion of India in 1944 and liberated Burma in 1945. I was now moving South West through this paved area, it was very pretty but the fountains were not working which made it look bad. Even Neptune was looking kind of parched. The day had turned out nice and sunny and it got hotter all the time. I was now heading South towards a junction on the A38 which was more or less where I needed to be to find my next destination. 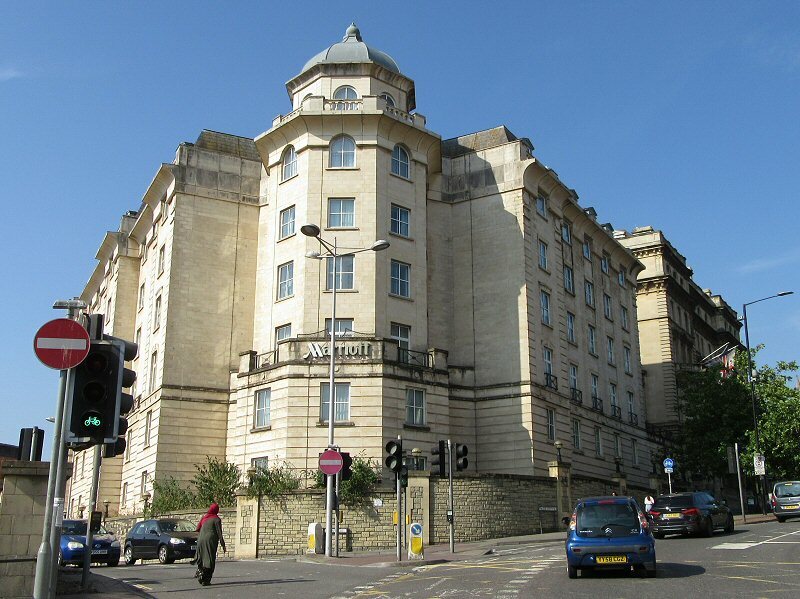 In the middle of this junction stood the Marriott Hotel, and it was quite an impressive building. 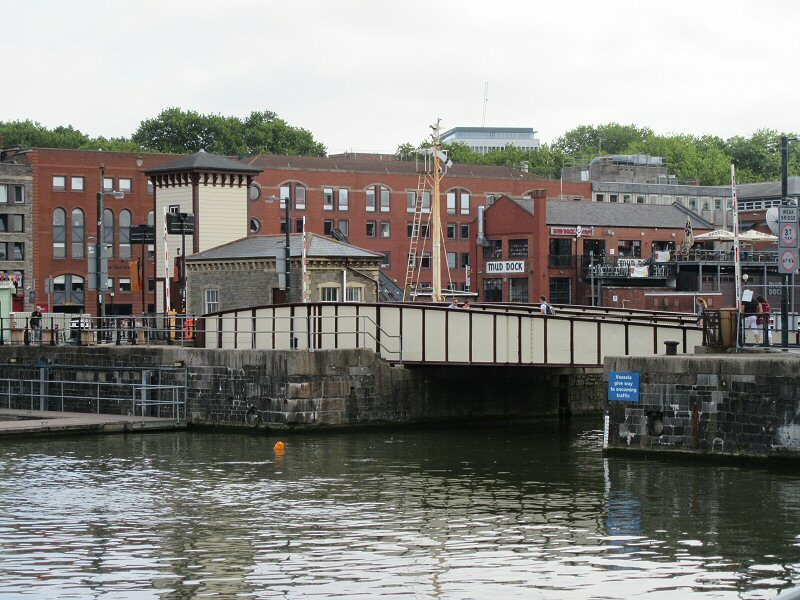 The building on the left was really part of the harbour structure. 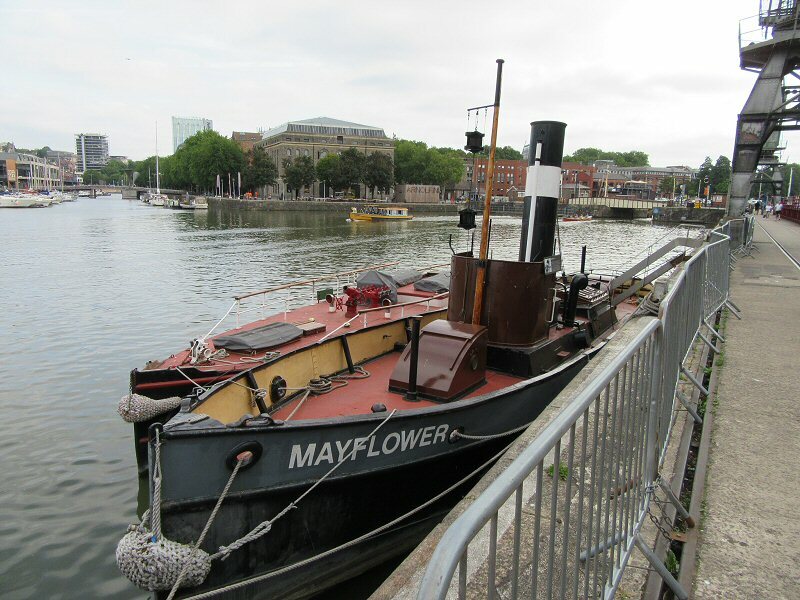 I could have entered the harbour at that point but my destination was really to the right of the Marriott, so I turned to starboard. 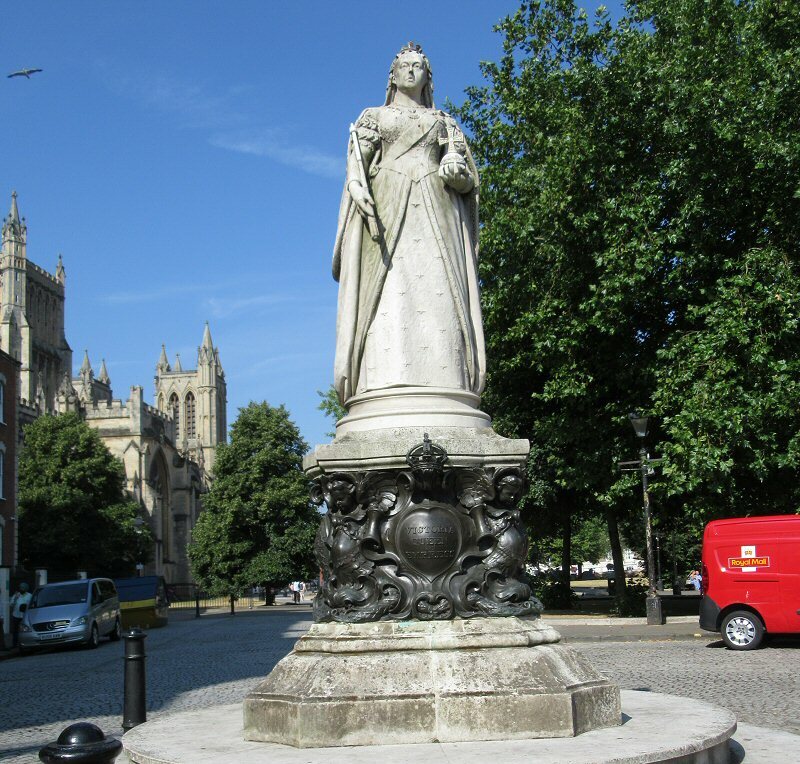 Queen Victoria was not amused because I needed to go to the right of her into Park Street. 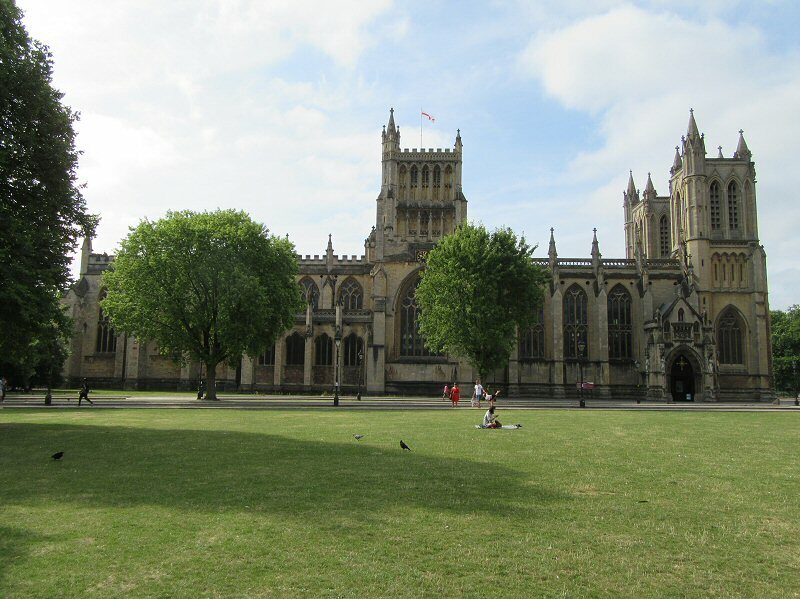 Behind her was the triangular shaped “College Green”, with Bristol Cathedral on the left and the City Hall to the right. I covered the Cathedral in a different post, but will mention that it was almost impossible to get the whole building in a pic because of the trees and length of the building and the sun position. 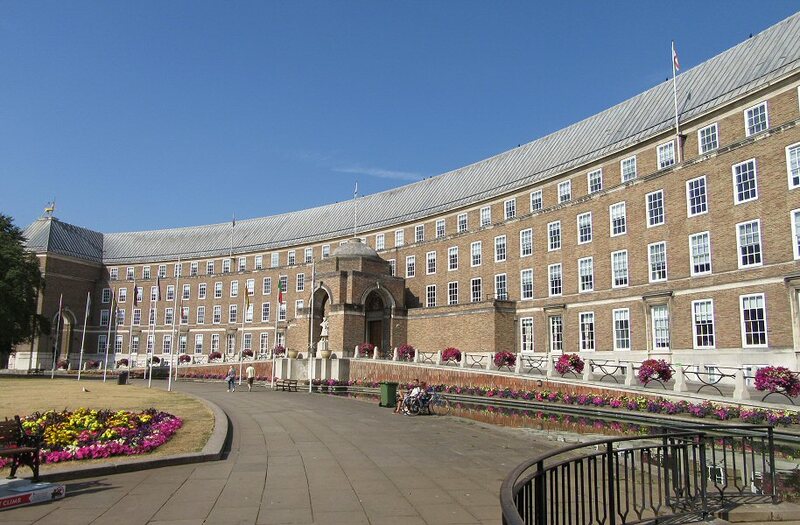 The City Hall is quite an impressive structure though and it reminded me of the Royal Crescent in Bath. It too was way too big to get into a single image. 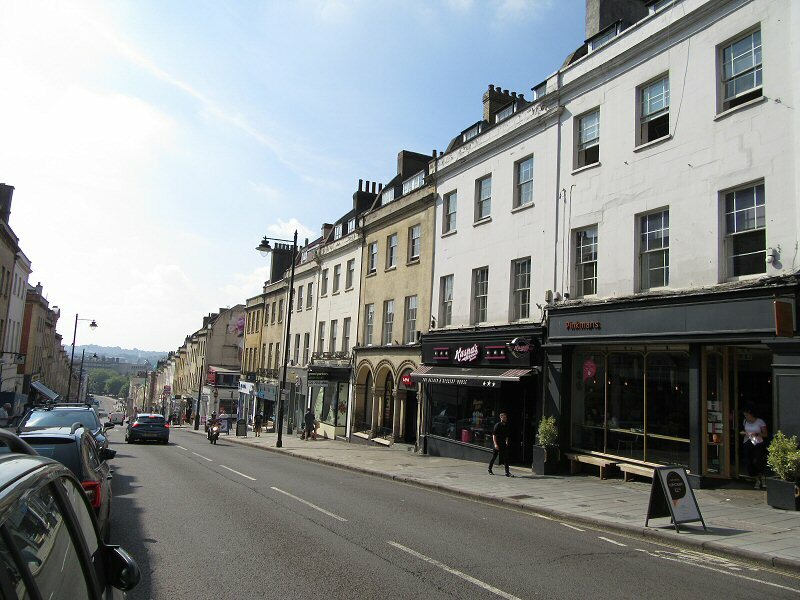 I had to pass to the right of the building into Park Street and when I emerged I almost died when I saw what a steep hill I was facing. 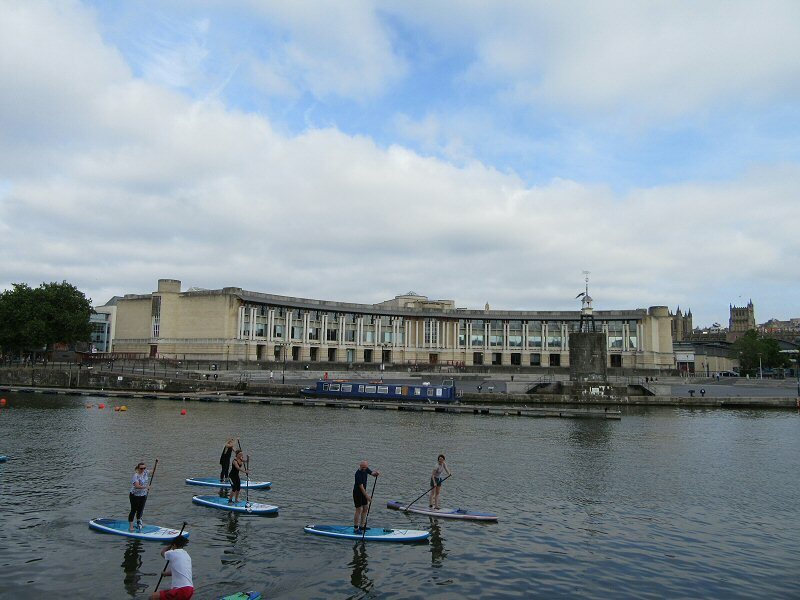 What is it about Bristol and all these hills anyway? 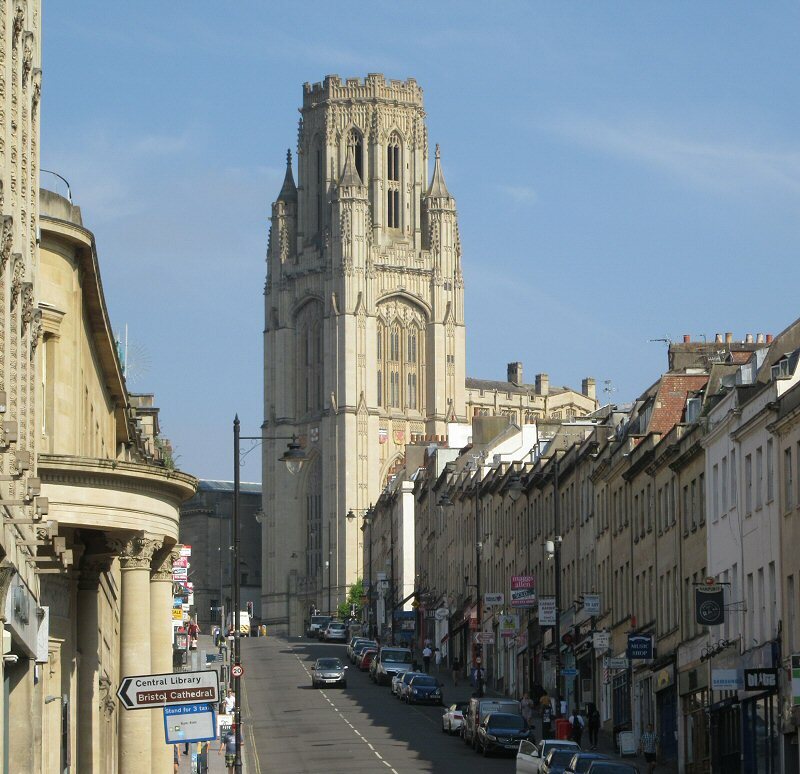 The tower in the distance is the University of Bristol Wills Memorial Building and construction was started on it in 1915 and it was completed in 1925. 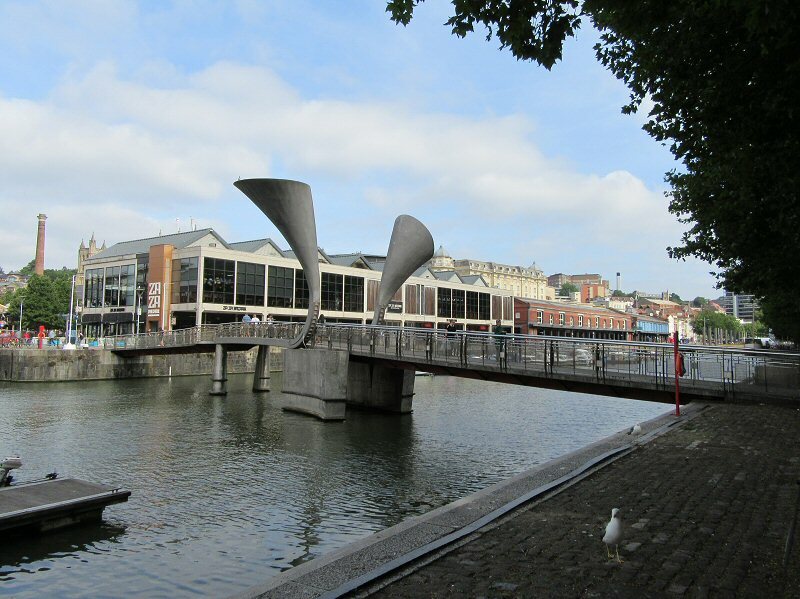 The tower is 65,5 metres high, and it is a really beautiful structure and is the 3rd tallest building in Bristol. 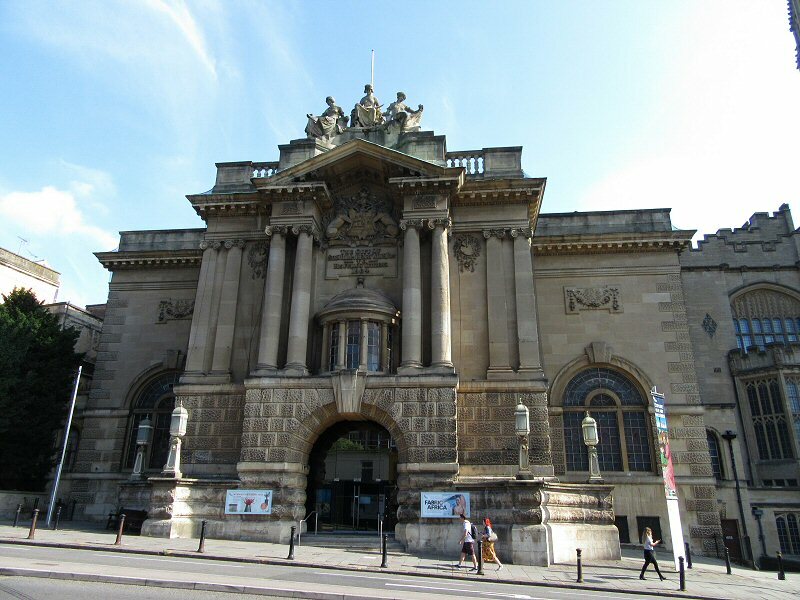 Next to the building is the Bristol Museum and Art Gallery. Having arrived at this point I started to look around in dismay, my memorial was nowhere in sight! I consulted my main map and found that I had made a mistake on the small map I was using, and my memorial was still 3 blocks away! 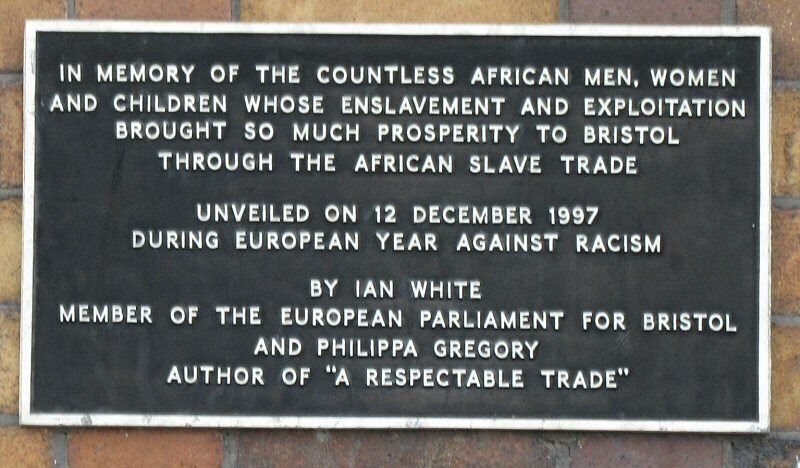 Behind the memorial was another ornate building with a statue of King Edward VII and it was known as “CHOMBEC”, or, Centre for the History of Music in Britain, the Empire and the Commonwealth. I made one detour on my way down, and that was to a building I had seen on the way up. 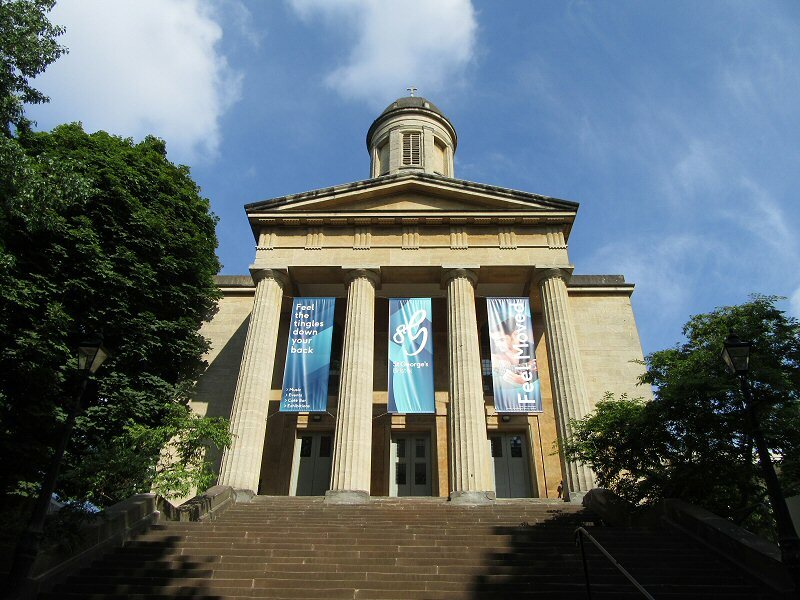 I could not investigate it too closely but it is St George’s Bristol, it was once a church but is now a concert hall. 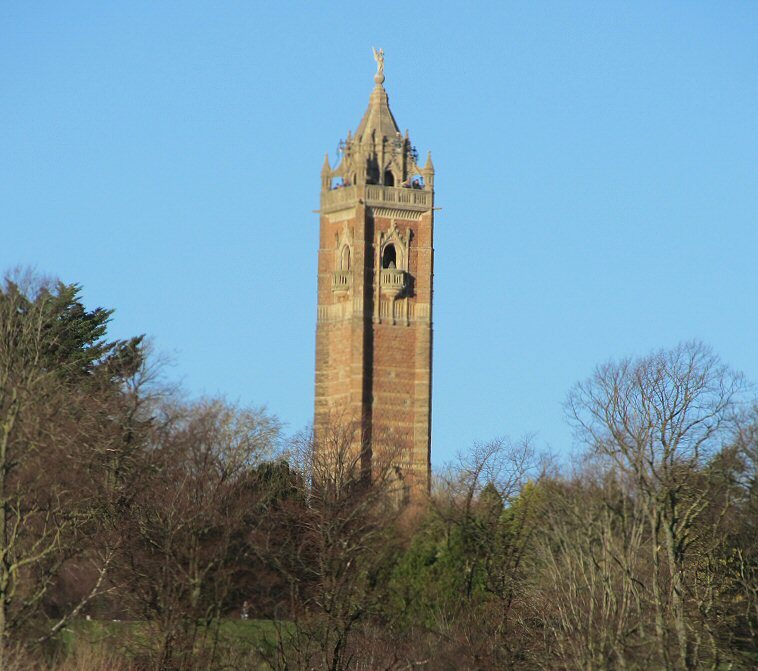 Had I continued with the road I was on I would have come to the park on Brandon Hill where the Cabot Tower is. 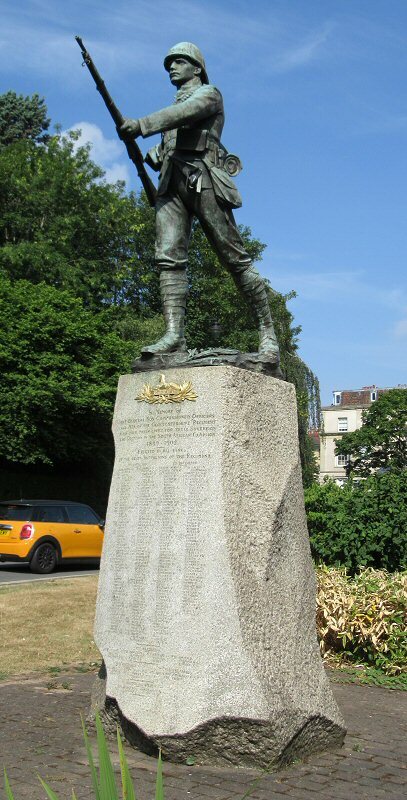 I will add that to my bucket list for a return trip as their is one more Anglo Boer War Memorial I need to research. I photographed the tower at a distance in 2014, although I cannot work out where I took the photograph from. With my luck the tower would be closed on the day I visit. 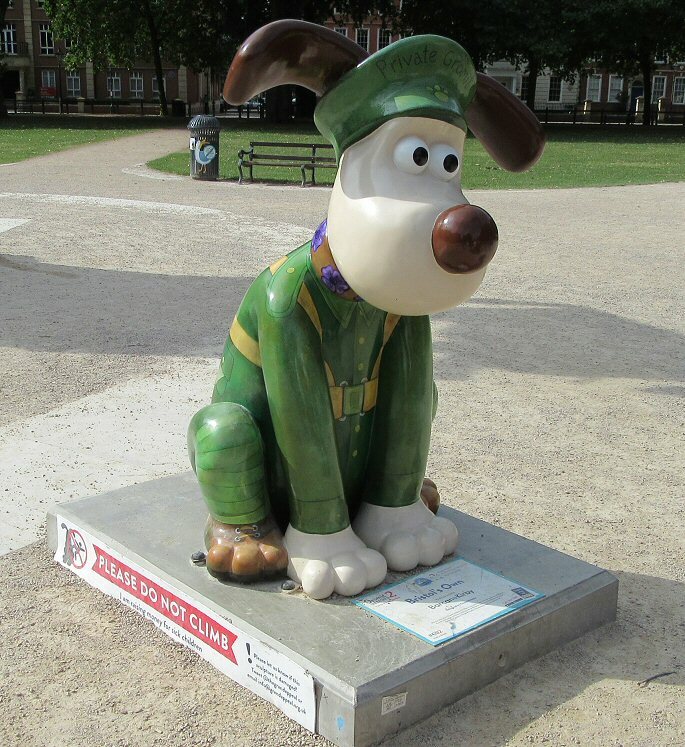 I was once again at the College Green and the Cathedral was my next stop. To really understand the whole shebang you need to know where it happened and there are a number of maps out there to show the area. I picked up this one in a shop window although I do not know when it dates from, but it does show the outline of the cemetery which means it was created after 1857 as the cemetery was opened in that year. There is a reason why the cemetery position is important, but that comes later. 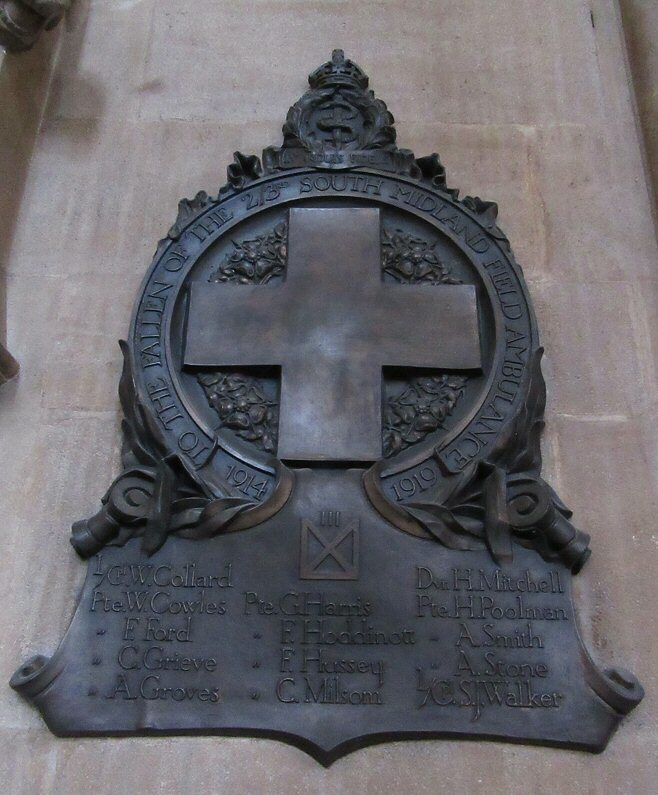 The Yorkists were descendants or supporters of Edmund of Langley, fifth son of Edward III and, from 1385 1st Duke of York, and they adopted the white rose as their badge. 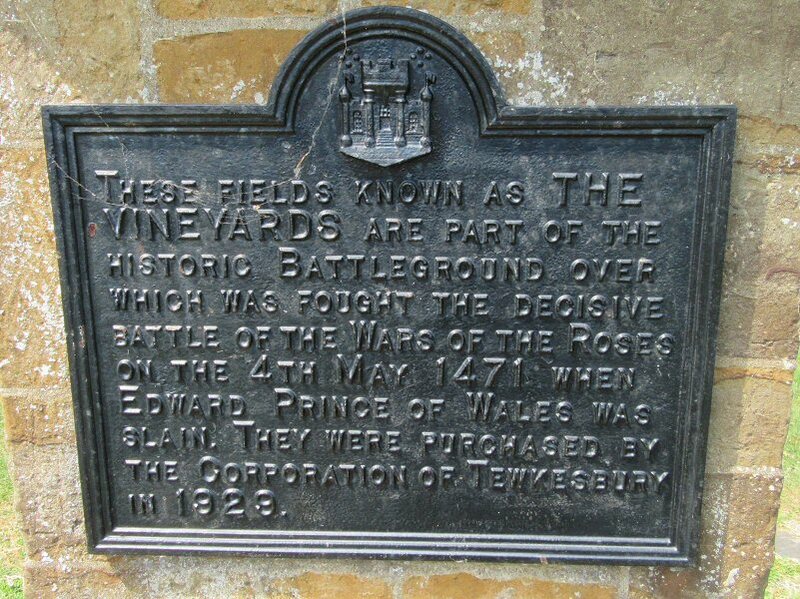 In the context of the Battle of Tewkesbury and the Wars of the Roses they were the army fielded by King Edward IV. 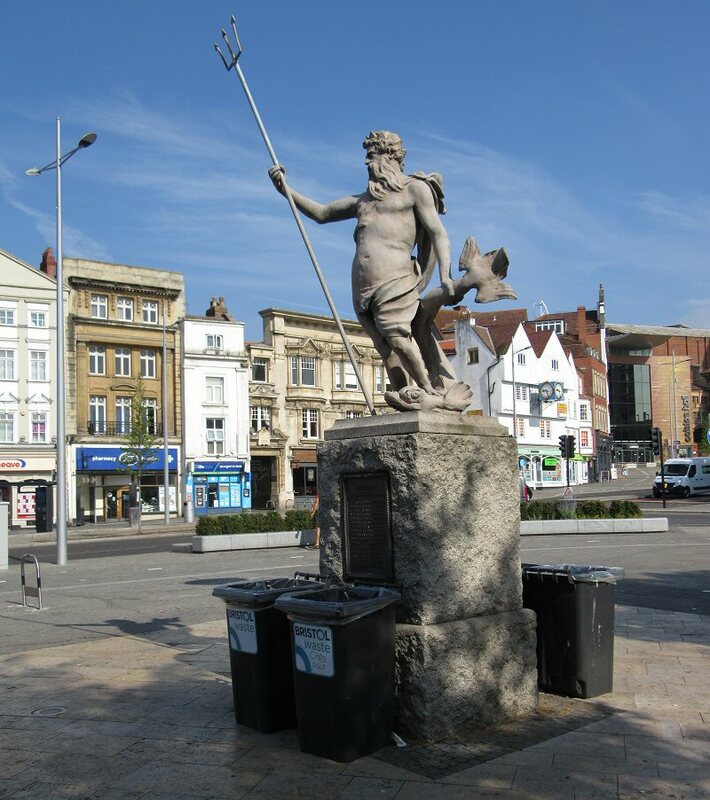 Having landed at Weymouth the Lancastrians were seeking to cross the River Severn into Wales to meet up with Jasper Tudor and the men he was gathering, then march into Lancashire and Cheshire, and raise the men of the north to overturn the Yorkist throne. 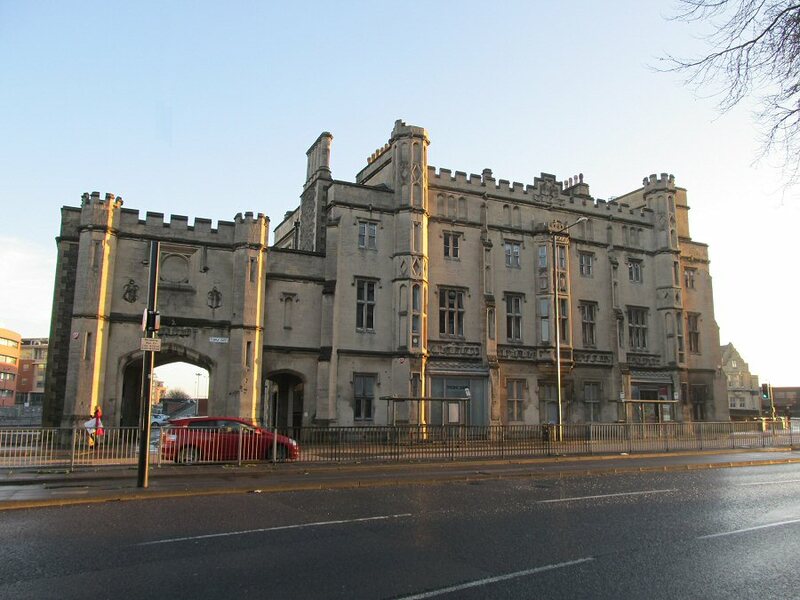 The nearest crossing point was at Gloucester and forewarned King Edward sent urgent messages to the Governor, Sir Richard Beauchamp, ordering him to bar the gates to Margaret and to man the city’s defences. 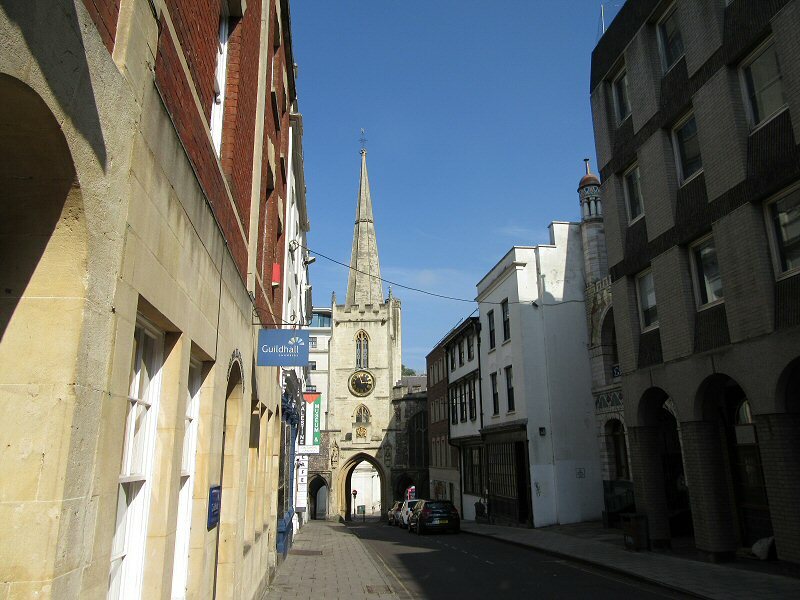 When Margaret arrived at Gloucester on the morning of 3 May, Beauchamp refused to let her army pass, and she realized that there was insufficient time to storm the city before Edward’s army arrived. 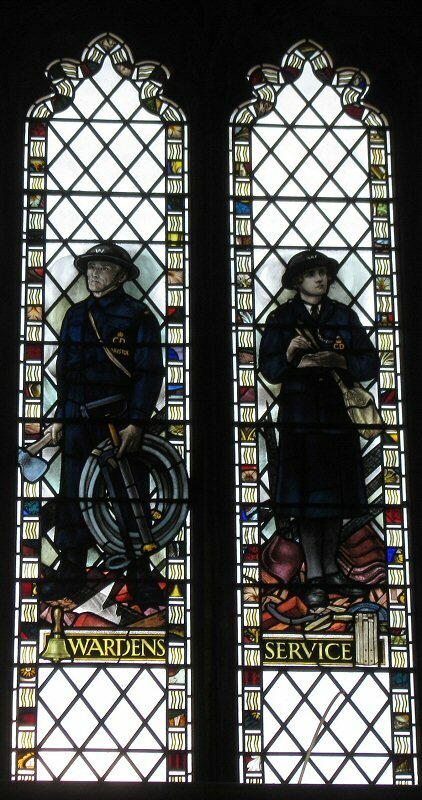 Her army made another 16 km forced march to Tewkesbury, hoping to reach the next bridge at Upton-upon-Severn 11 km further on. The Lancastrians halted for the night at Tewkesbury, while Edward drove his army to make another march of 9.7 km from Cheltenham, finally halting 4.8 km from the Lancastrians who knew they could retreat no further before Edward attacked their rear, and that they would be forced to give battle. 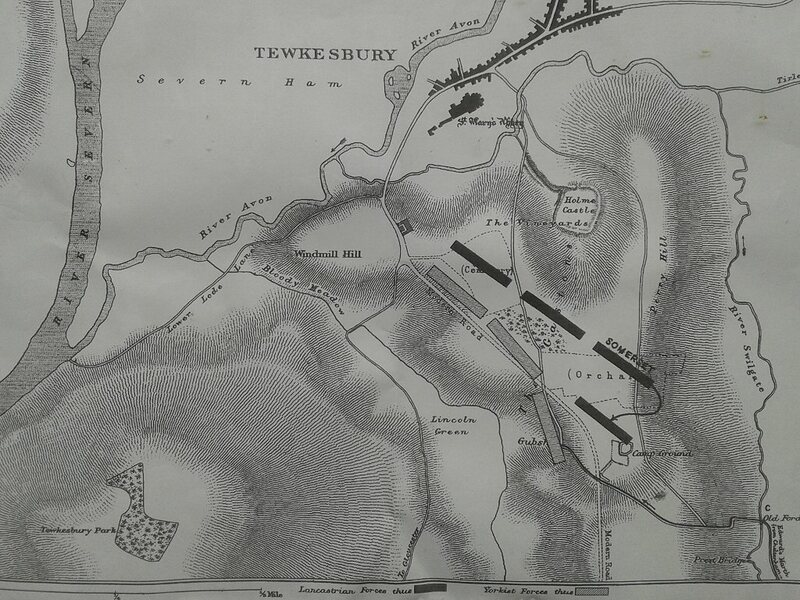 As day broke on 4 May 1471, the Lancastrians took up a defensive position a mile south of Tewkesbury. 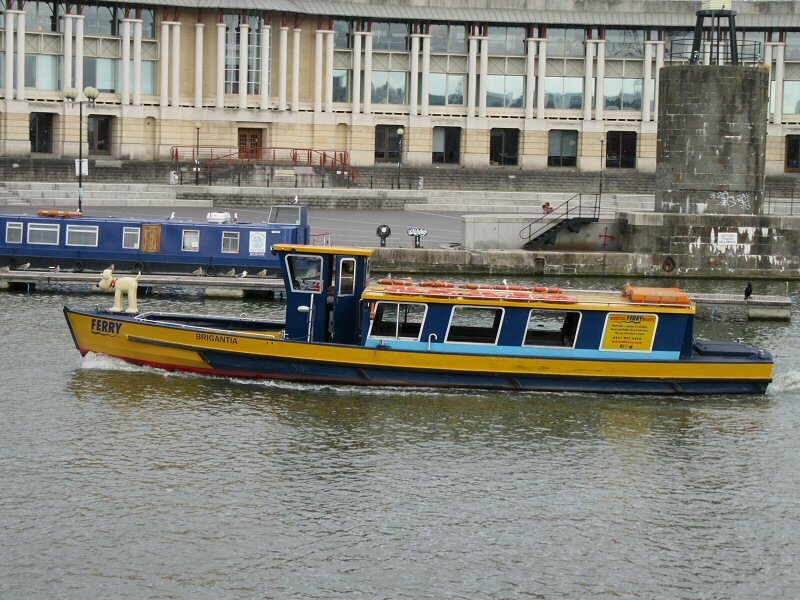 To their rear were the Rivers Avon and Severn. 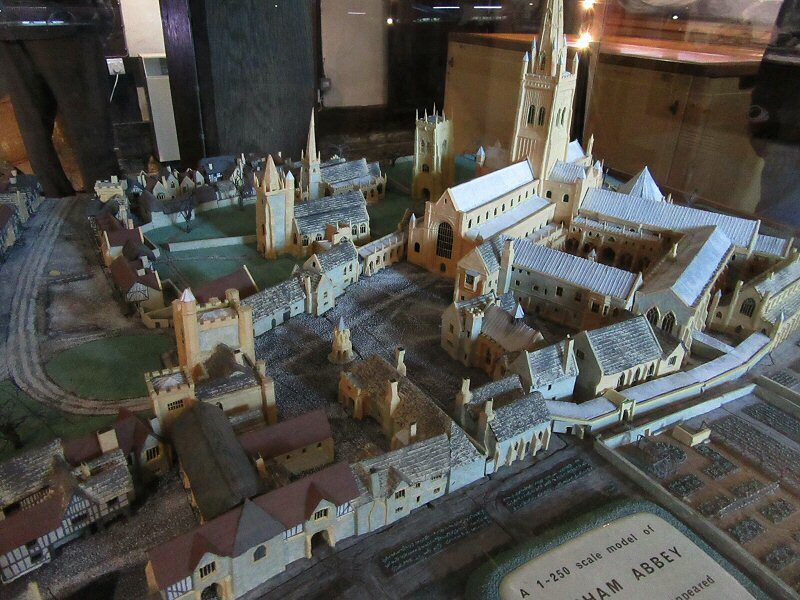 Tewkesbury Abbey was just behind the Lancastrian centre. 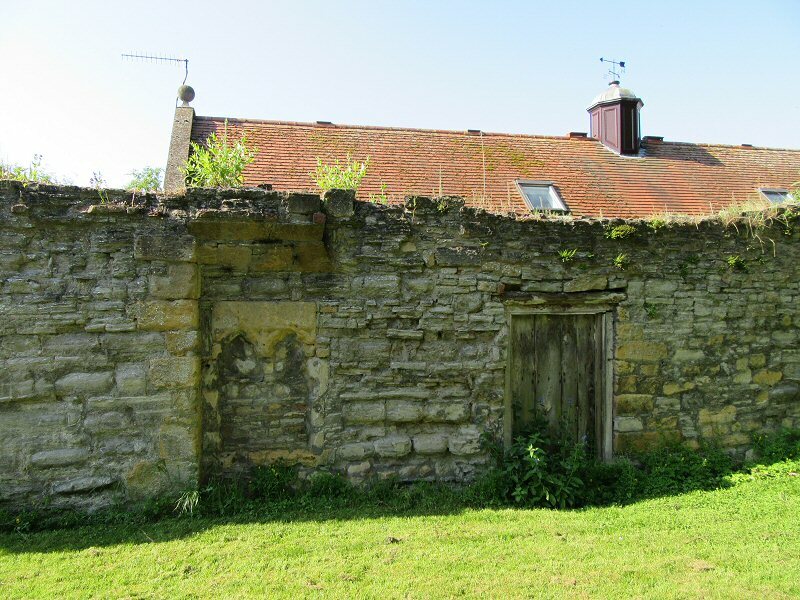 A farmhouse then known as Gobes Hall (Modern day Gupshill Manor) marked the centre of the Lancastrian position. The Lancastrian army was approximately 6000 strong, and as was customary was organised into three “battles”. 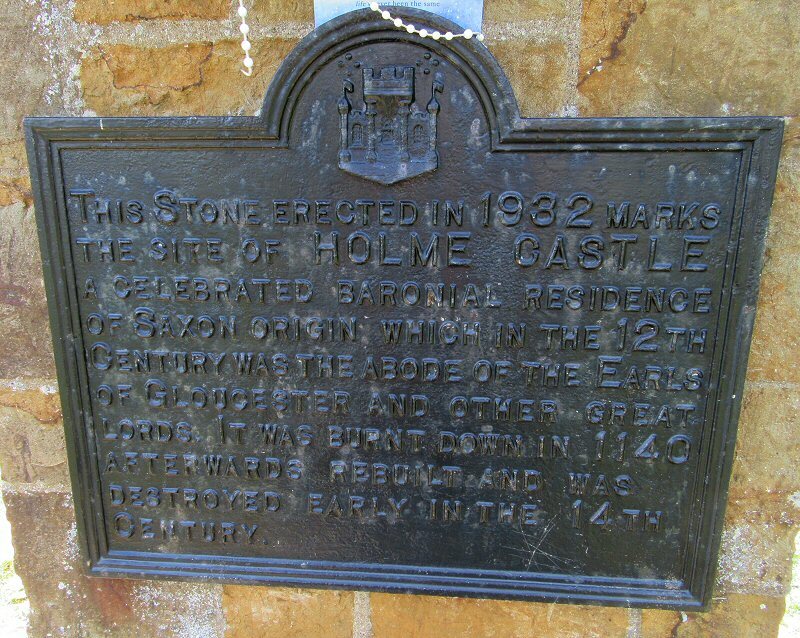 The right battle was commanded by the Duke of Somerset, the centre was commanded by Lord Wenlock, while 17 year old Prince Edward was present with the centre. 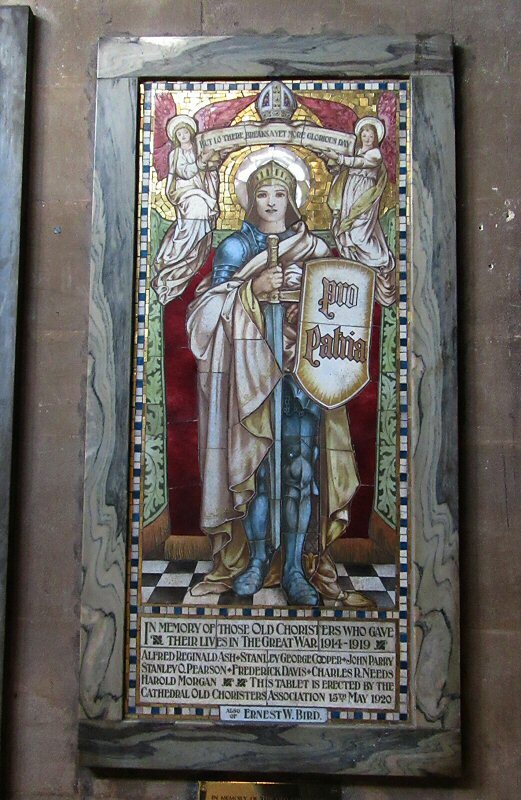 The left battle was commanded by the John Courtenay, 15th Earl of Devon. The River Swilgate, protected Devon’s left flank, before curving behind the Lancastrian position to join the Avon. The main strength of the Lancastrians’ position was provided by the ground in front, which was broken up by hedges, woods, embankments and “evil lanes”. This was especially true on their right. 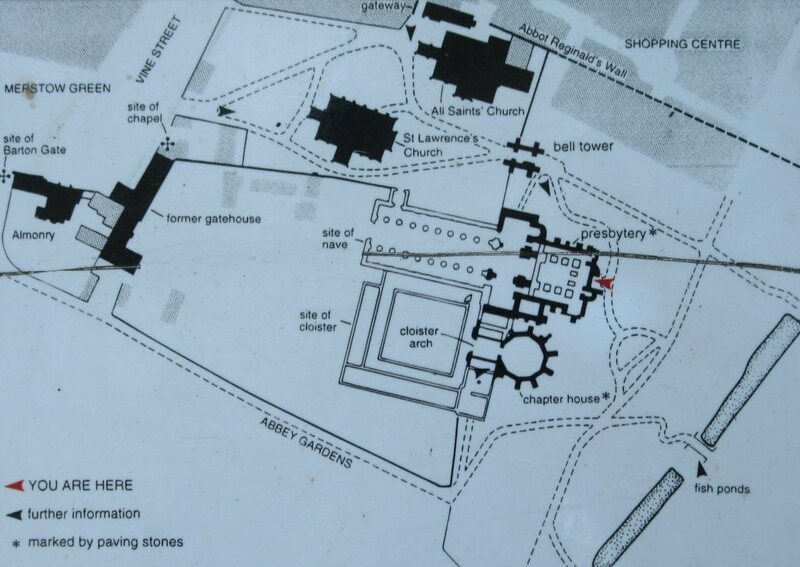 On the map below the Swilgate starts at the upper right and cross through the map in front of the abbey. The Yorkists numbering roughly 5000, were slightly outnumbered and they too were organised into three battles. King Edward commanded the main battle and his vanguard was commanded by his youngest brother, Richard, Duke of Gloucester while Lord Hastings commanded the rear. To the left of Edward’s army was a thickly wooded area and he ordered 200 mounted spearmen to occupy part of the woods and prevent the Lancastrians making use of them, or act on their own initiative if they were not themselves attacked. These men really played an important role in the defeat of the the Lancastrians. As they moved towards the Lancastrian position the Yorkist army found that the ground was so broken up by woods, ditches and embankments that it was difficult to attack in any sort of order. Yorkist archers and artillery showered the Lancastrians with arrows and shot. The Duke of Somerset led at least part of his men via some of the “evil lanes” to attack Edward’s left flank. 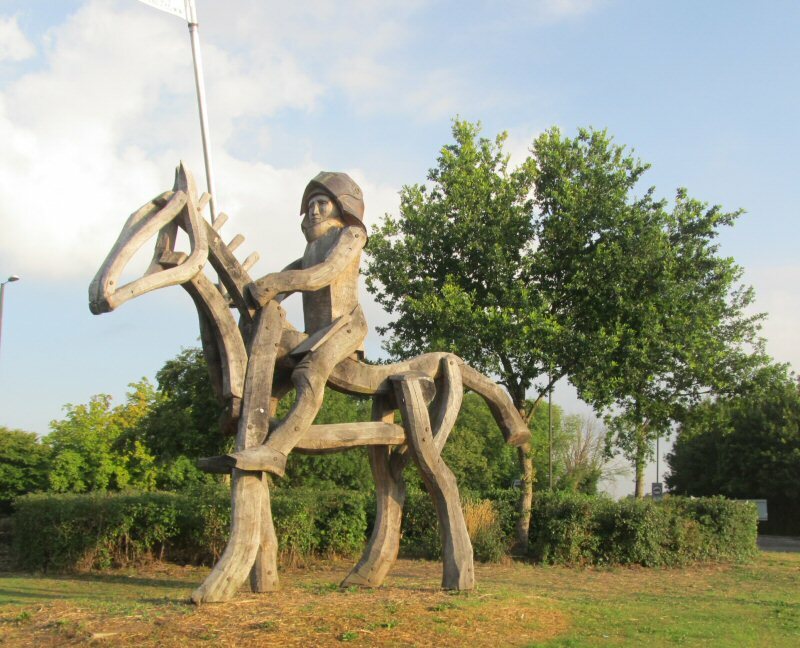 Edward’s men resisted stoutly, beating back Somerset’s attack, the 200 spearmen Edward had earlier posted in the woods attacked Somerset from his own right flank and rear. 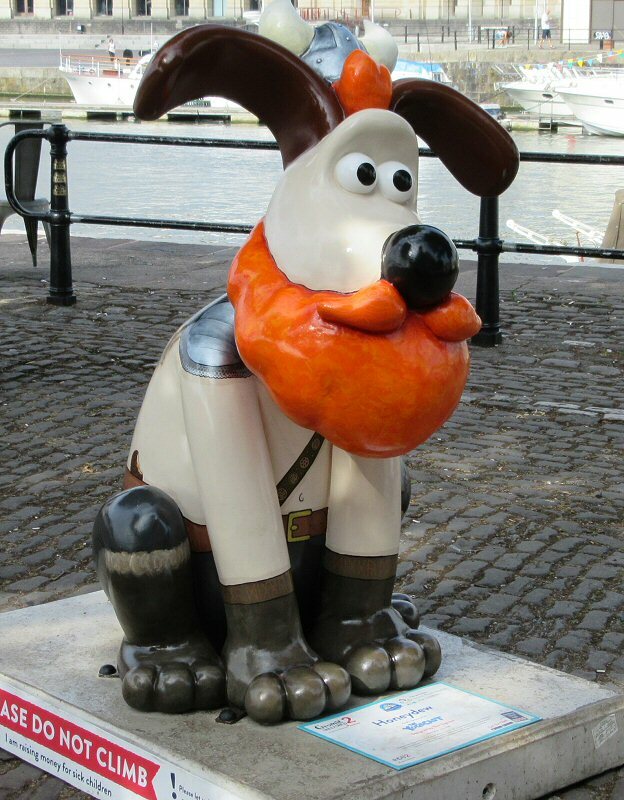 Somerset’s battle was routed, and his surviving army tried to escape across the Severn. Most were cut down as they fled. The long meadow astride the Colnbrook leading down to the river is known to this day as “Bloody Meadow”. As its morale collapsed, the rest of the Lancastrian army tried to flee, but the River Swilgate became a deadly barrier. 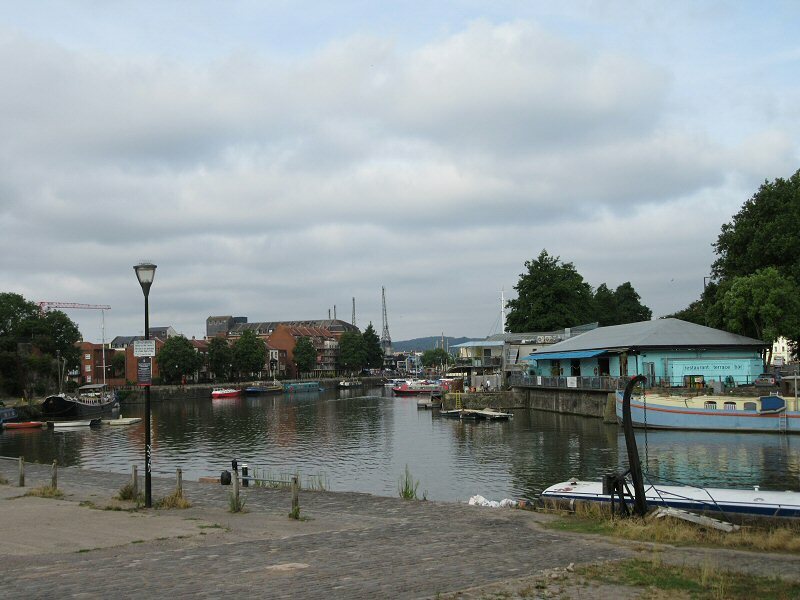 Many who succeeded in crossing it converged on a mill south of the town of Tewkesbury and a weir in the town itself, where there were crossings over the Avon. Here, too, many drowned or were killed by their pursuers. 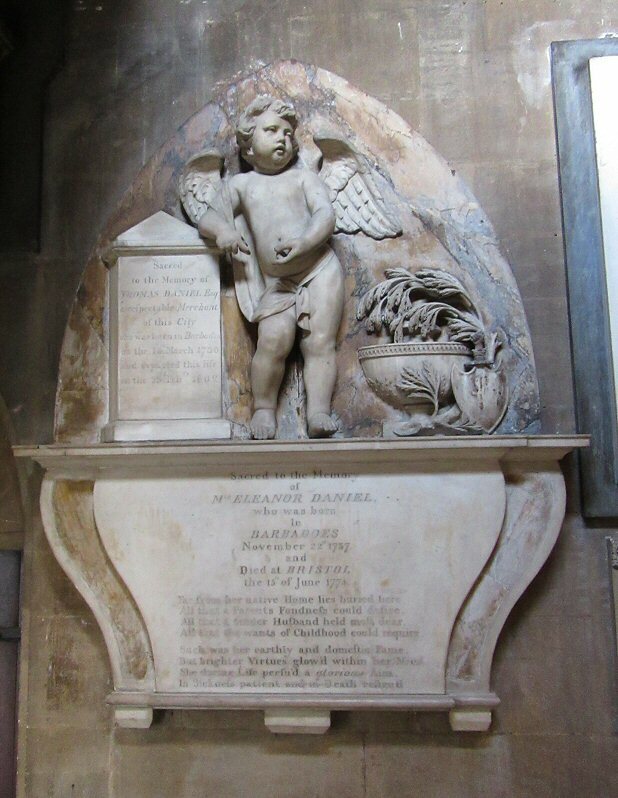 The grave of Edward, Prince of Wales, the last legitimate descendant of the House of Lancaster may be found in Tewkesbury Abbey. 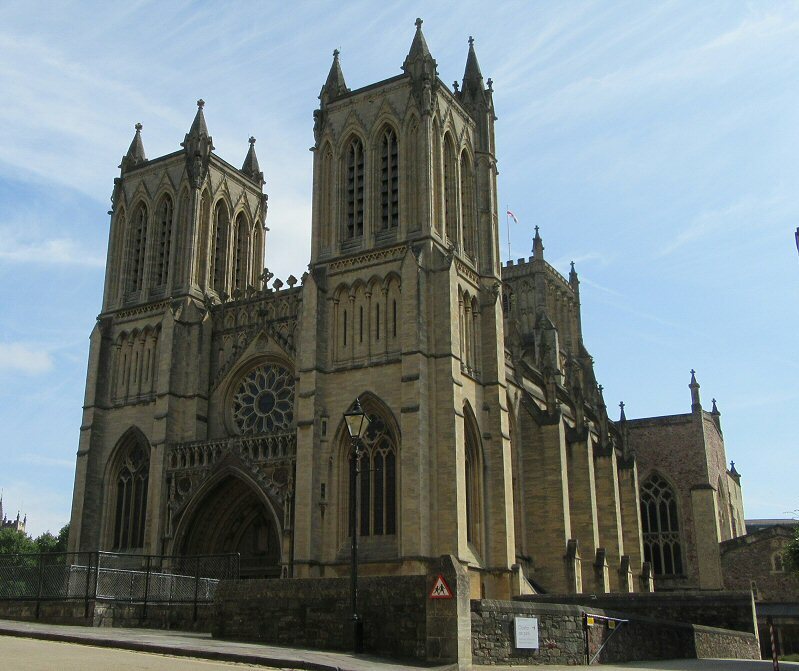 A number of others from the battle are also buried in the Abbey, and it is likely many of the foot soldiers were buried where they fell. History is not altogether clear as to their fate, after all, in this struggle for power they were really just pawns in a larger power game between kings and queens. Just past Gupshill Manner on the Stonehills roundabout on the A38. 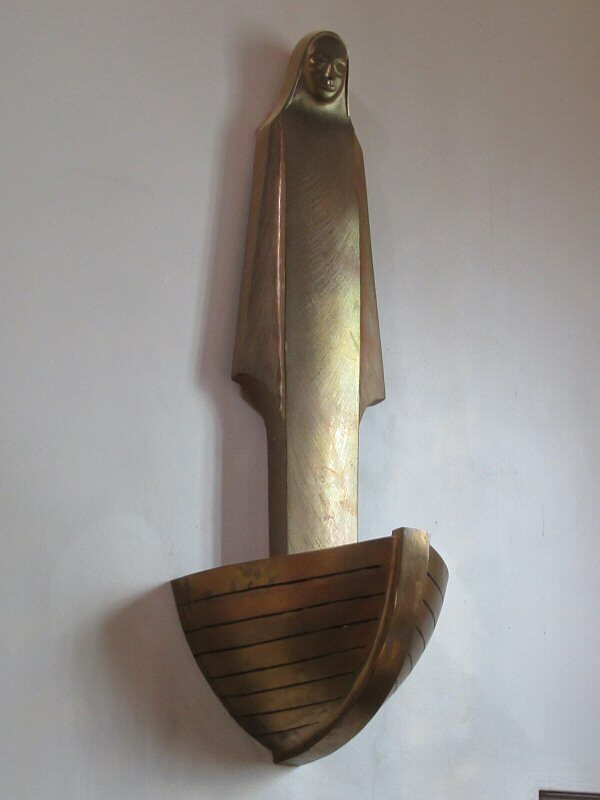 there are two large wooden statues collectively known as The Arrivall. 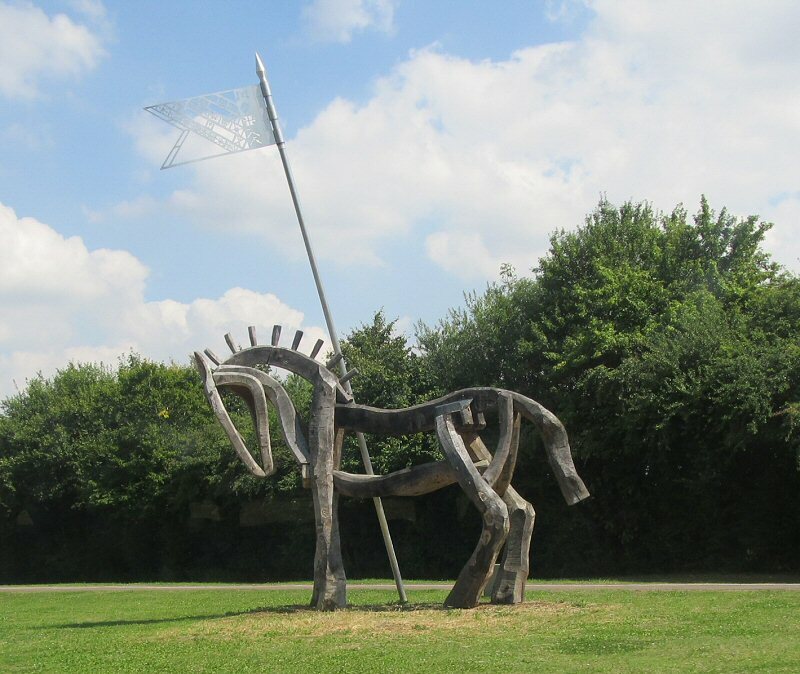 The two 5 metre works, feature a victorious knight on horseback and a defeated horse. 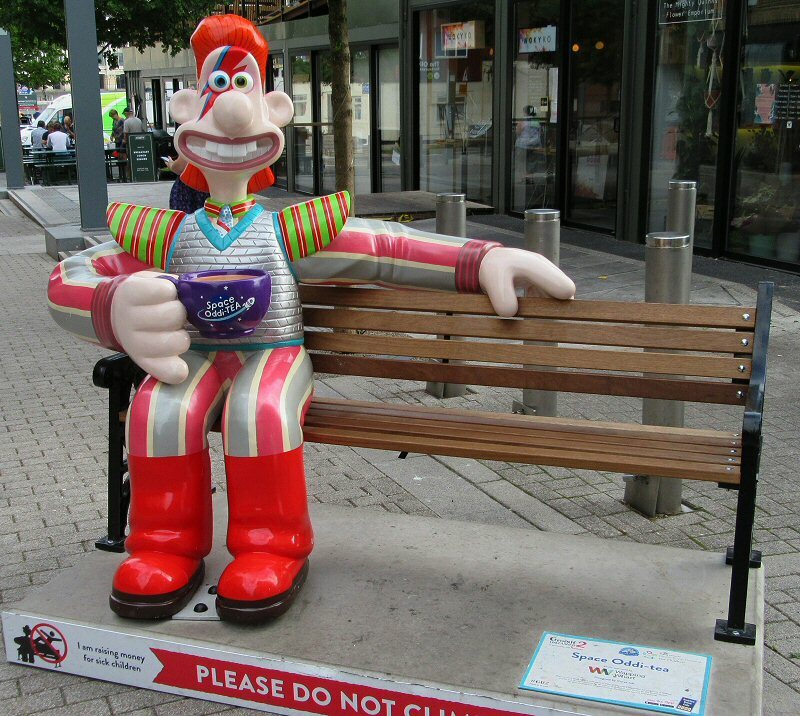 They took 15 years to plan and two years to make and they were created by Sculptor Phil Bews from the Forest of Dean and were unveiled in May 2014. They pretty much sum up the battle in two images. Unfortunately I have never been able to see them up close and personal but only managed images from the bus. There is a lot written about the battle and the consequences thereof, who wrote the story? probably the winners. Personally I really deal with aftermaths, as my collection of references above shows. I do not know the whole story, but one of these days I will do the tour and hear another version and hopefully I will be able to add even more to this page afterwards. 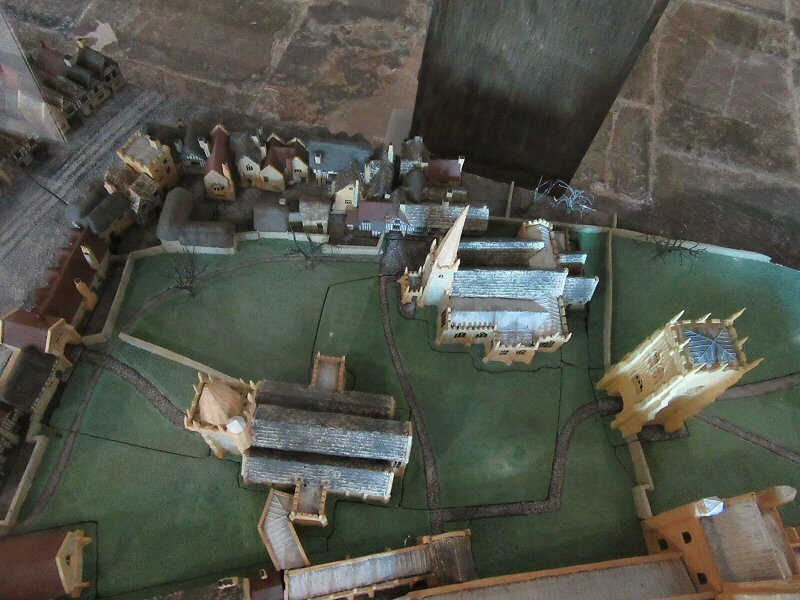 Sadly, Evesham Abbey is really a small collection of foundations, walls, artefacts and a tower left over following the carnage of the dissolution of the monasteries and the reformation. 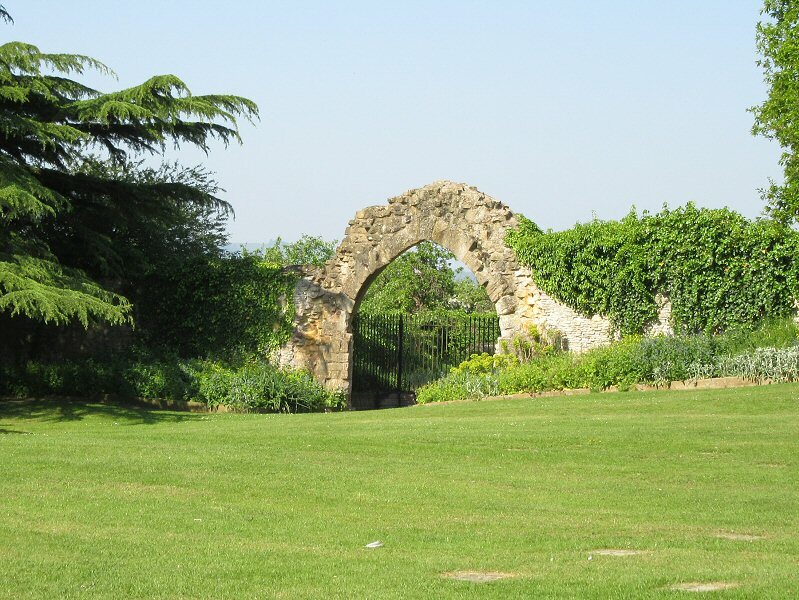 and, unlike the ruins of Netley Abbey, there is less to see at the place where the Abbey used to stand. 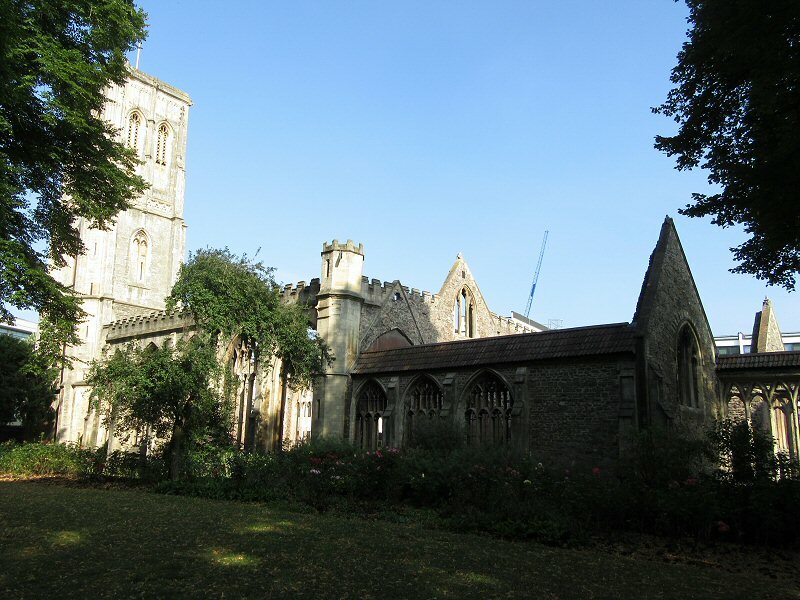 The biggest surprise though is that there are two parish churches (St Lawrence and All Saint’s Church) in close proximity to the space that was occupied by the Abbey, and they have both survived. The one information board has a layout off what the area may have looked like. 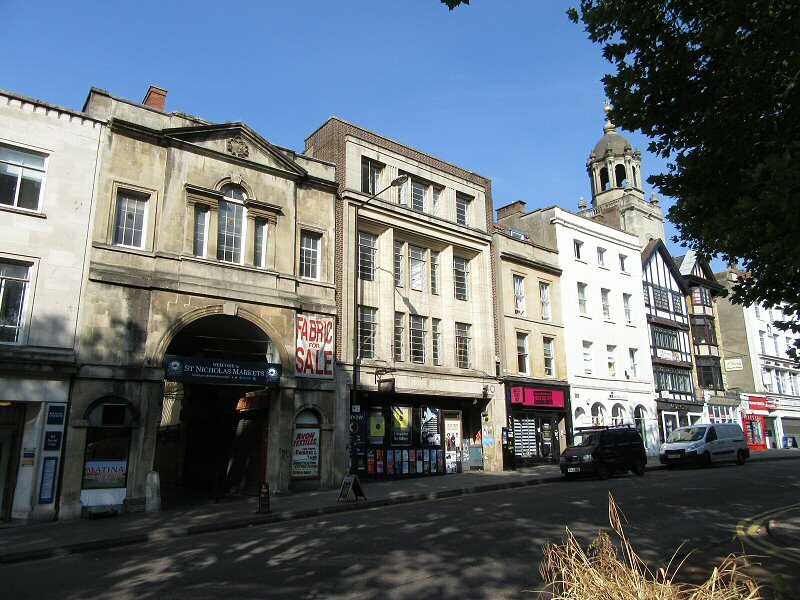 Make no mistake, it is a very pretty area today with lush green lawns and gardens, but given where the building stood it would have been spectacular to see from the River Avon that would have flowed past it. 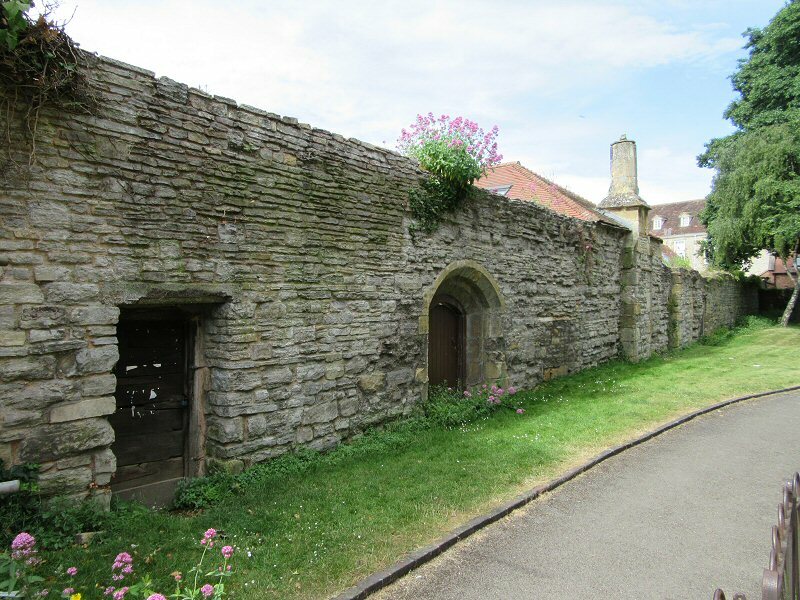 The Evesham Abbey Trust is really the proper place to find out more about the archaeology and history and to promote an understanding, appreciation and engagement with the heritage and history of the site where the Abbey stood. 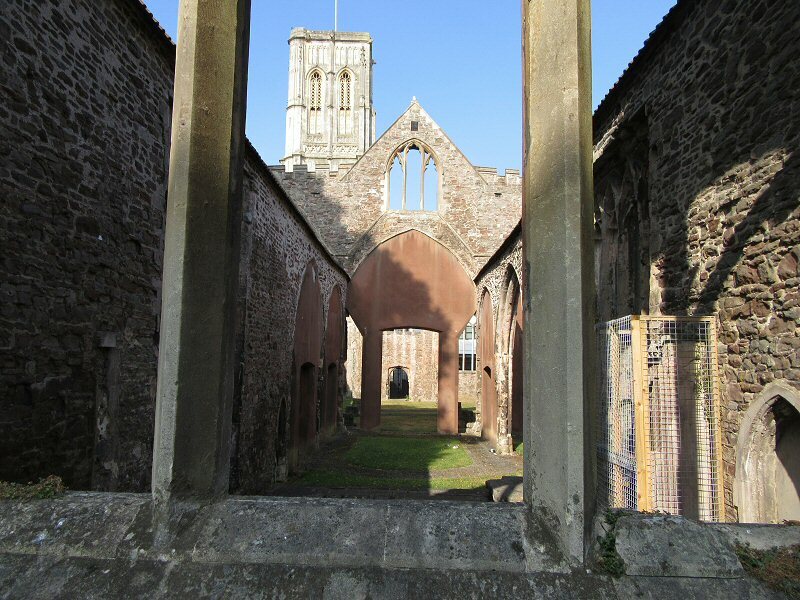 The bell/clock tower was spared the destruction of the Abbey, probably because it was not a physical part of the original building, although today it looks almost lonely without it’s context, but we are fortunate that it survived because it is very beautiful. 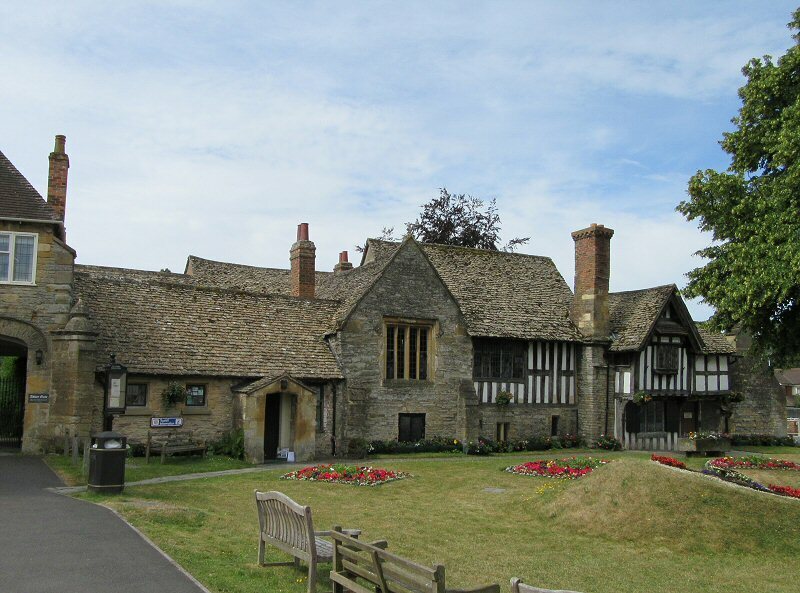 The tower was built between 1529 and 1539 by Clement Lichfield, the last Abbott of Evesham. 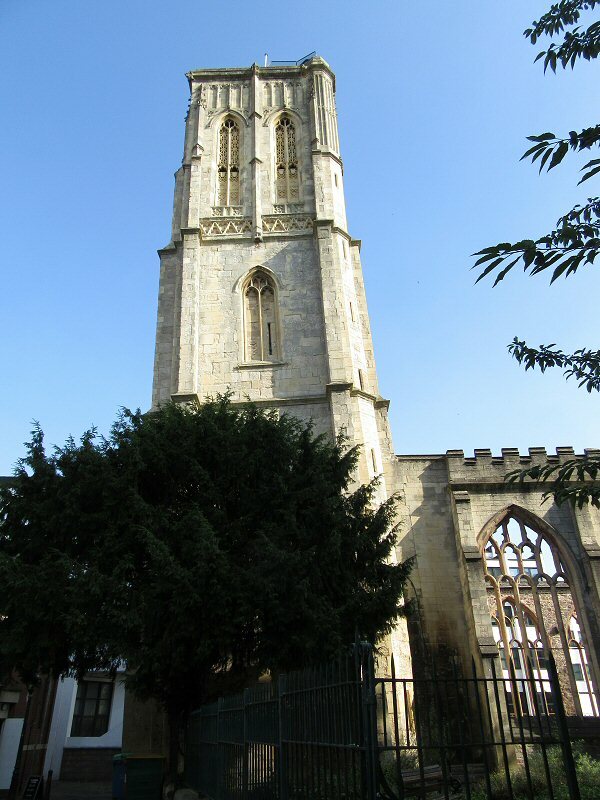 It is 33 metres high and was restored in 1951 with the original peal of 10 bells recast and increased to 12. 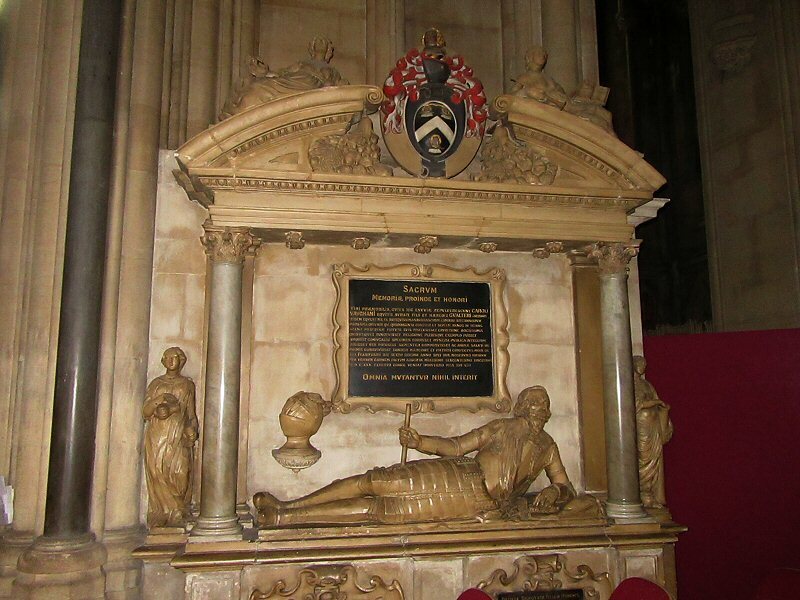 The tomb in the front is that of the remains of Simon De Montfort, Duke of Leicester, who was killed in the Battle of Evesham on 4 August 1265. 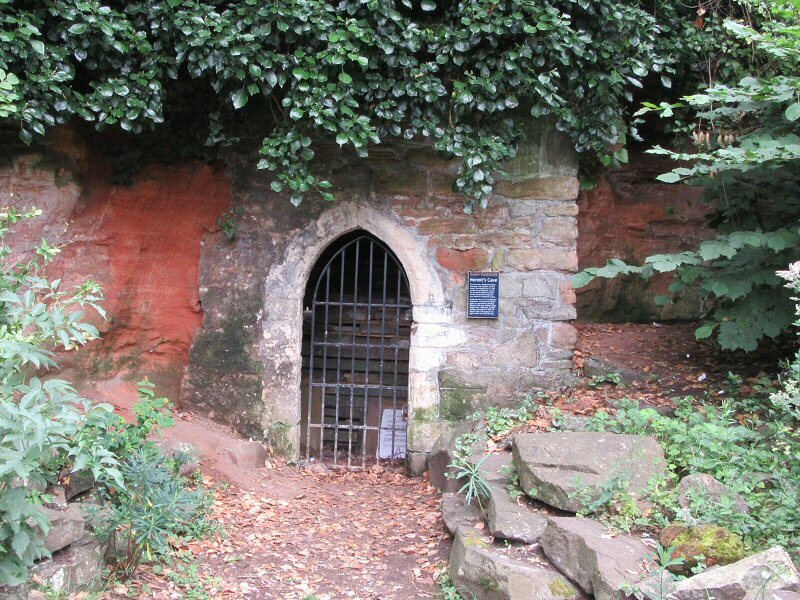 The gateway led out into what was then the Monk’s Graveyard, and that now lies under Abbey Park. 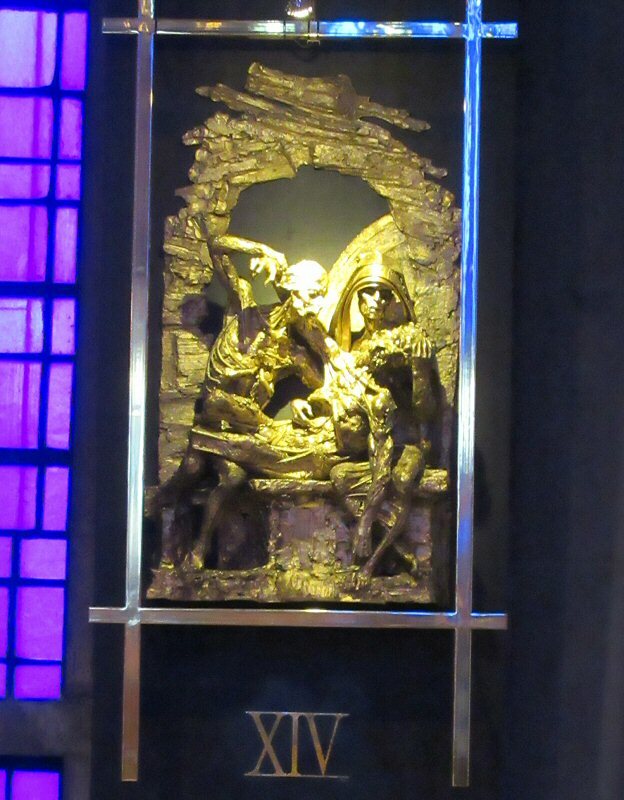 During the 19th century excavations unearthed some of the graves of the monks. 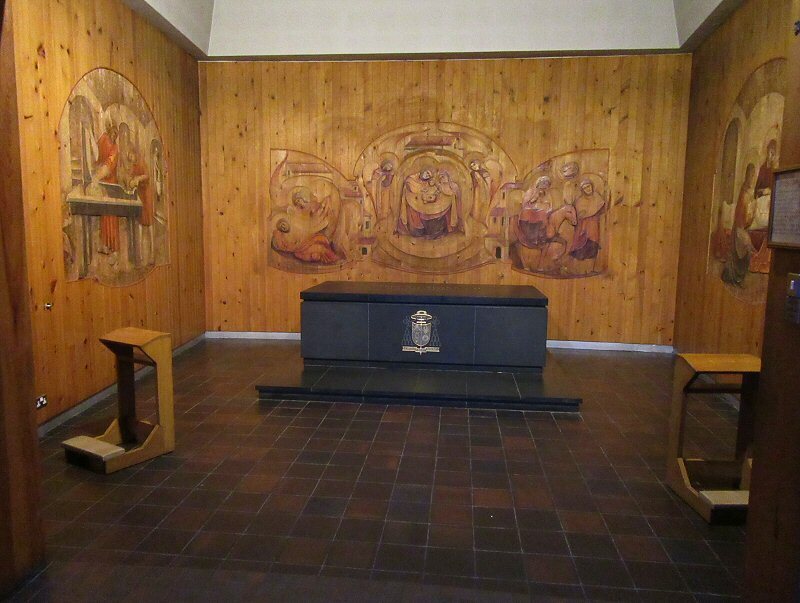 They were wrapped in a shroud and placed on a wooden board with a simple wooden marker. 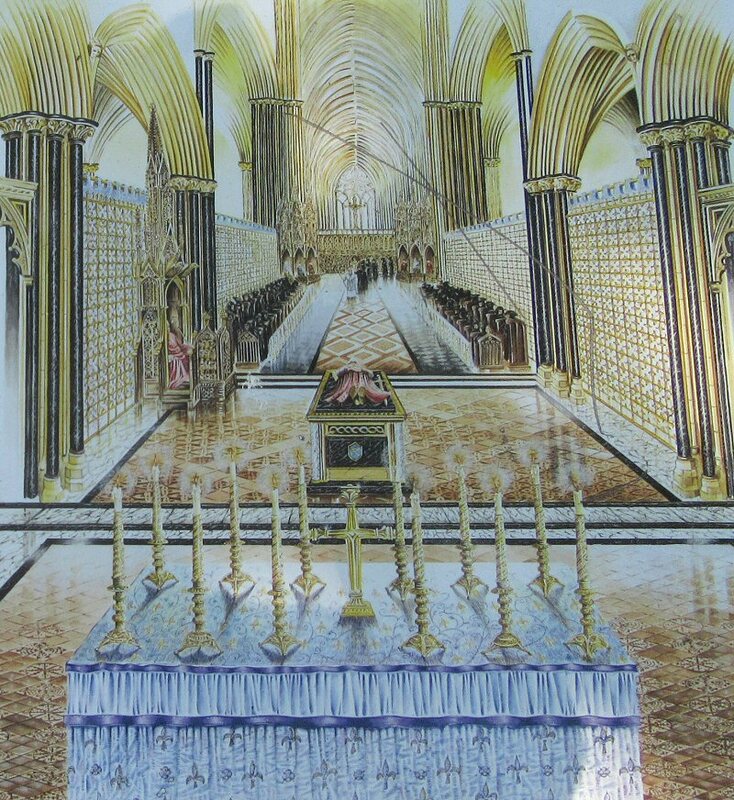 Higher up in the hierarchy would entitled you to be buried within the Abbey along with your marks of office (rings, keys, chalices, lead seal, etc.). 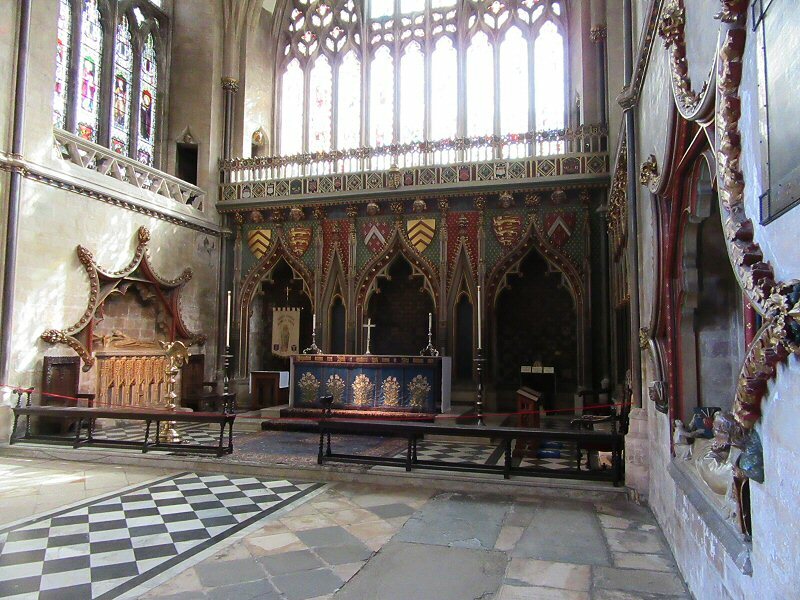 Some of these were recovered from the grave of Henry of Worcester who was the Abbot of Evesham and who died in 1263. 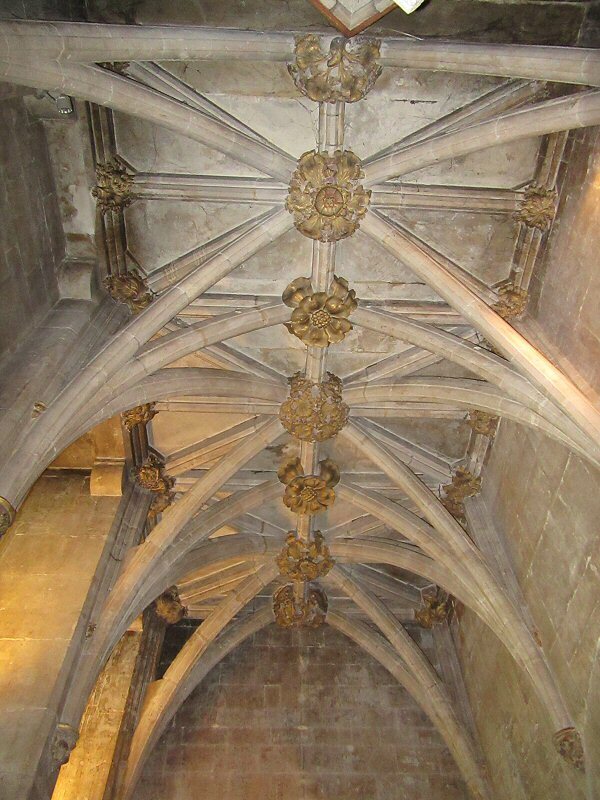 The cloister arch would have been between the cloisters and the chapter house. This is the area behind the archway, it is a real jungle or grassland. and of course the Almonry found a new purpose. 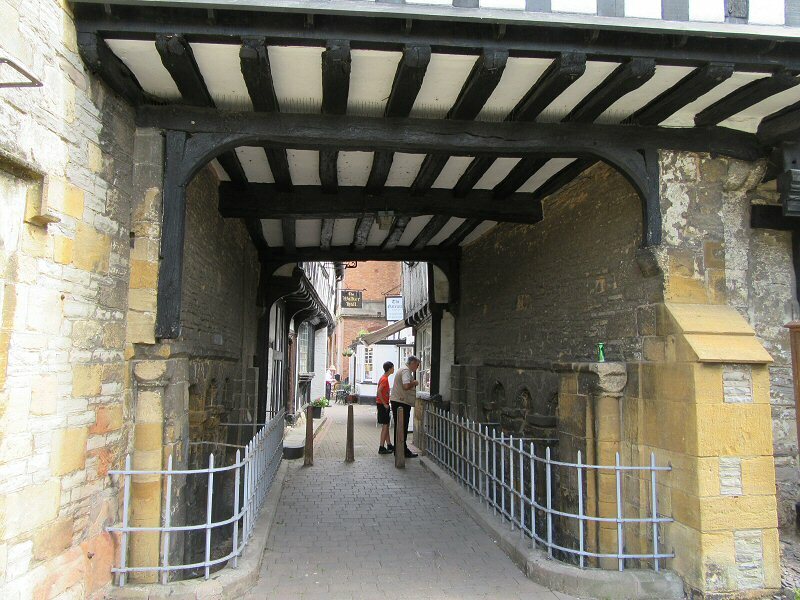 The remains on a Norman gateway to the Abbey is still to be seen today, and it dates to roughly 1130. 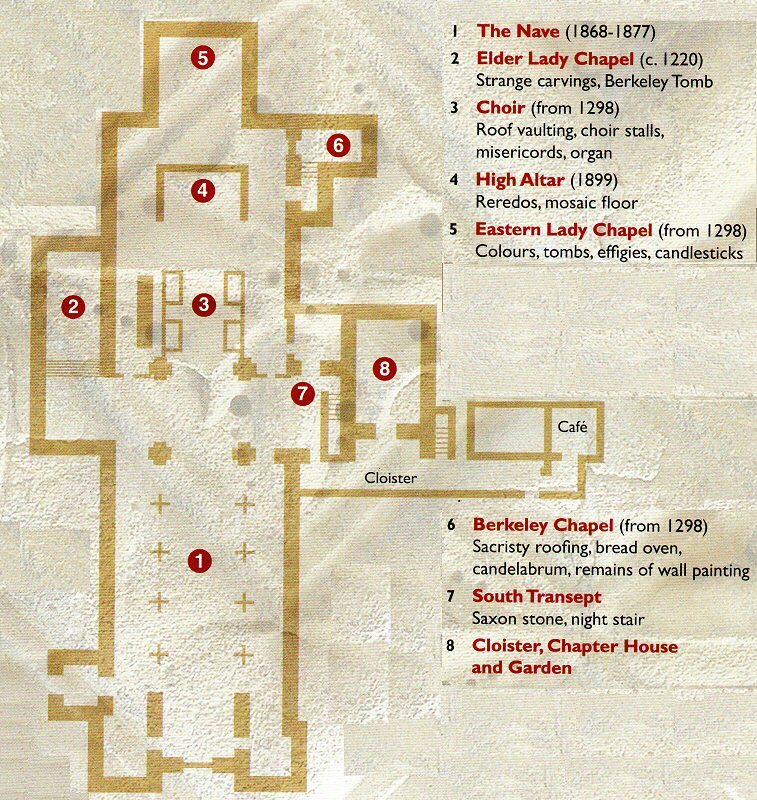 What the the Abbey looked like is really educated guesswork, although foundations do exist and they give a rough outline of the shape of the building, but from the foundations upwards it is an educated guess. Was there a spire? if there was there is no trace of it. 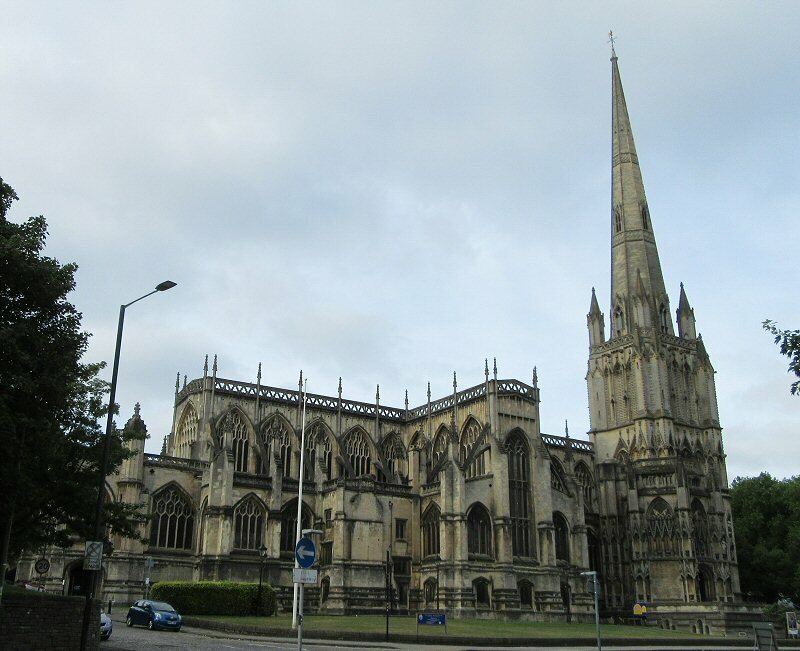 However is is reported that it reached 310 feet into the sky (Salisbury Cathedral Spire is 404 ft), the Chapter House was 50 feet in diameter and 10 sided, while the Abbey was the 3rd largest in England. 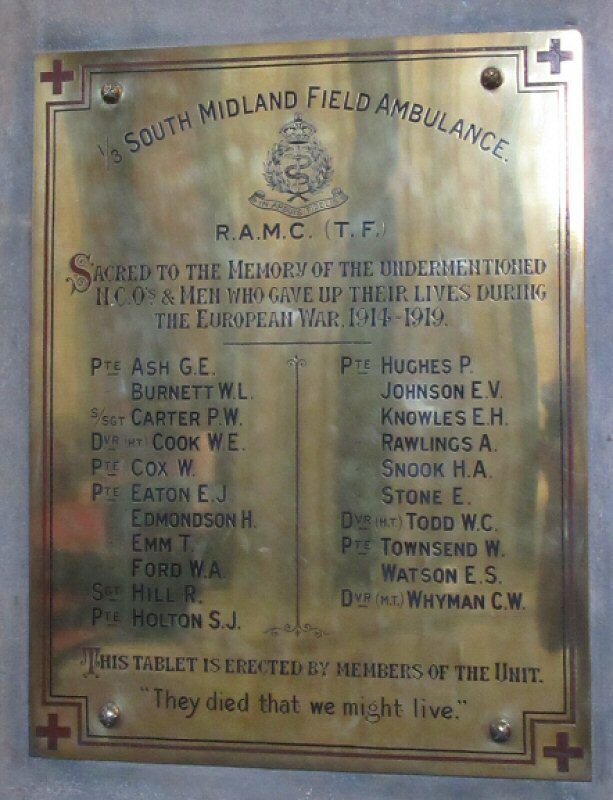 The sad reality though is portrayed on one of the information boards at the site. 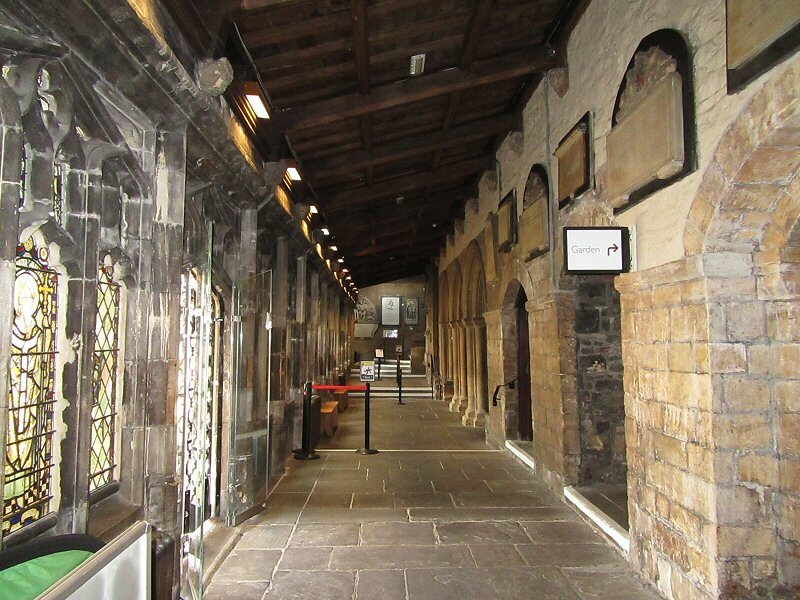 On the 30th of January 1540 the soldiers came and the monks were ordered to leave. 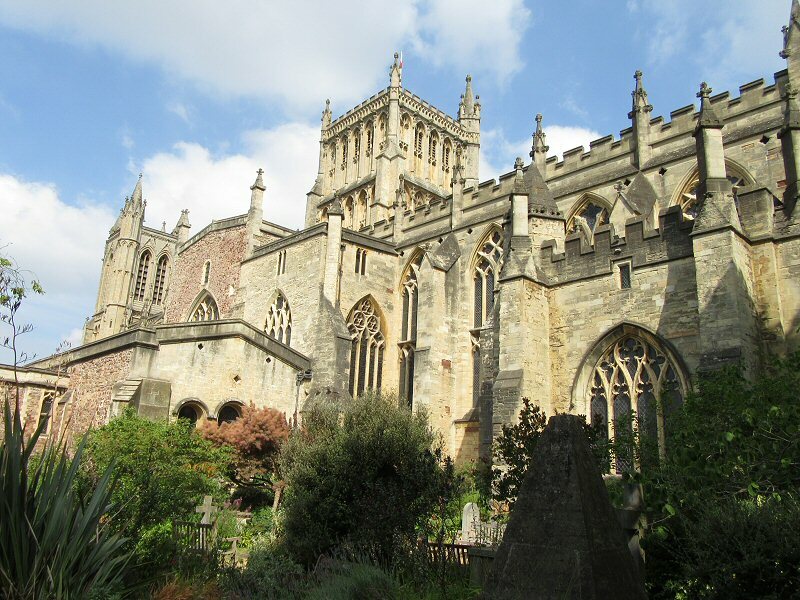 The Abbey buildings were given to Sir Philip Hoby, who reused the stone. 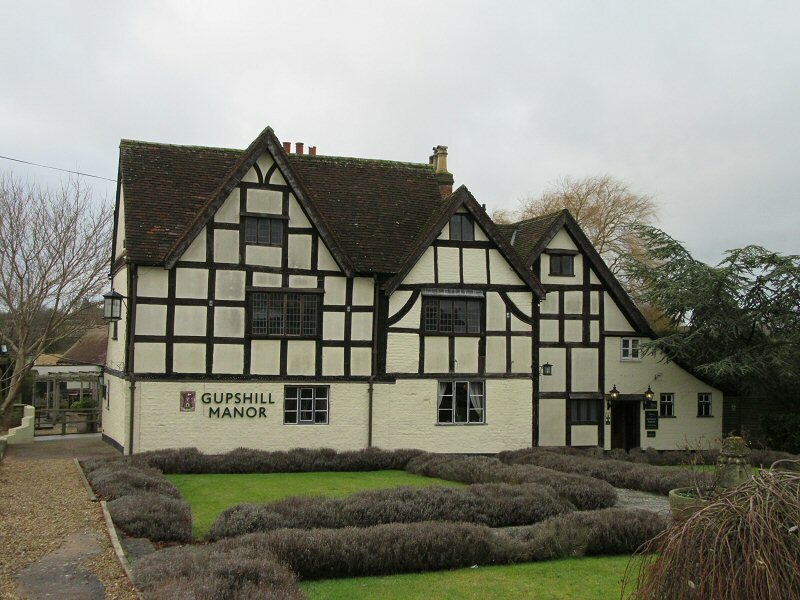 It was acquired by the Rudge family in 1664 and has been in the family ever since. 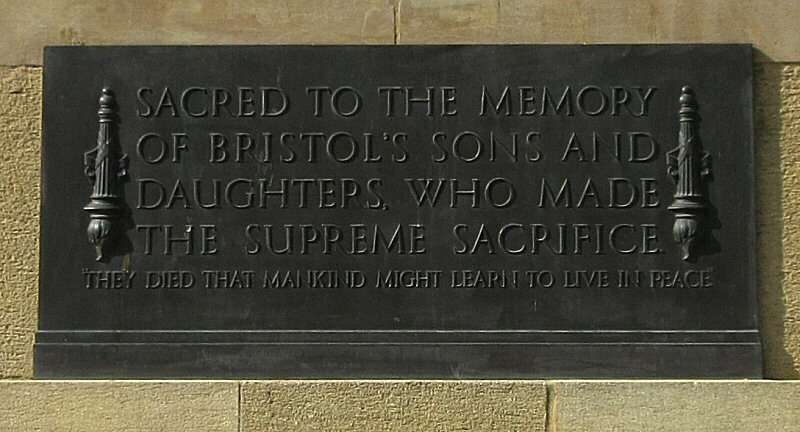 And to me that sums up the Abbey, and what the people of Evesham saw once the deed had been done. I can only speculate on how the monks and clergy felt when they watched the building being destroyed. And I can just imagine the smug looks of the accountants of the day as they catalogued the assets that were seized. 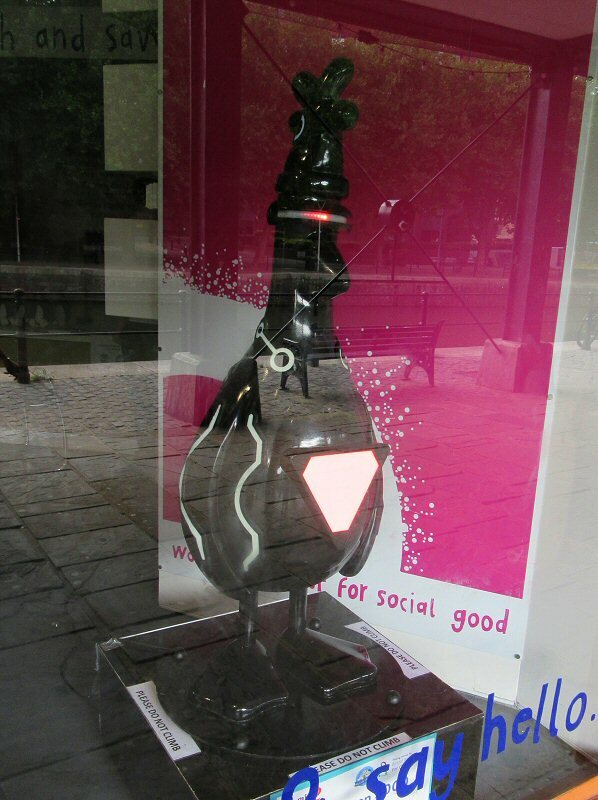 All that loot into the coffers of the state and a community robbed of an item of beauty. 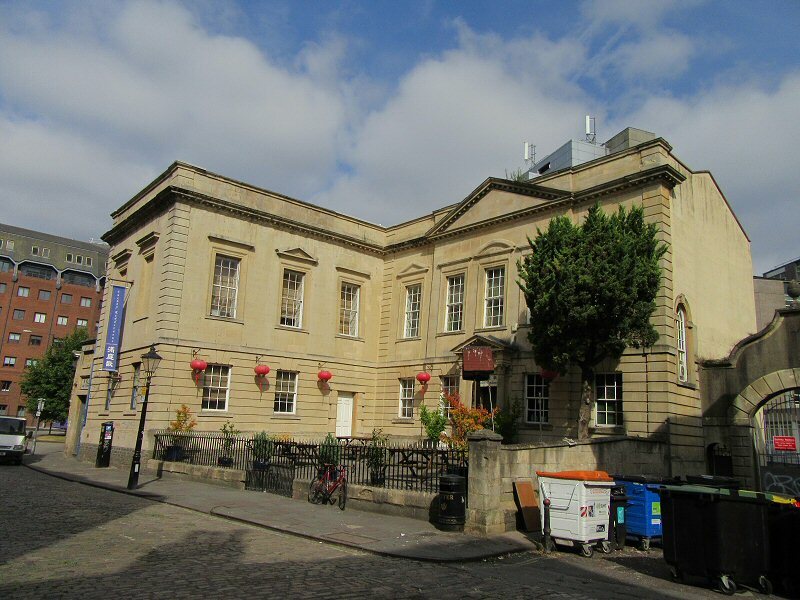 Some of the stonework was reused in the building of the city hall, and you can bet there are other properties in the town with stonework too. 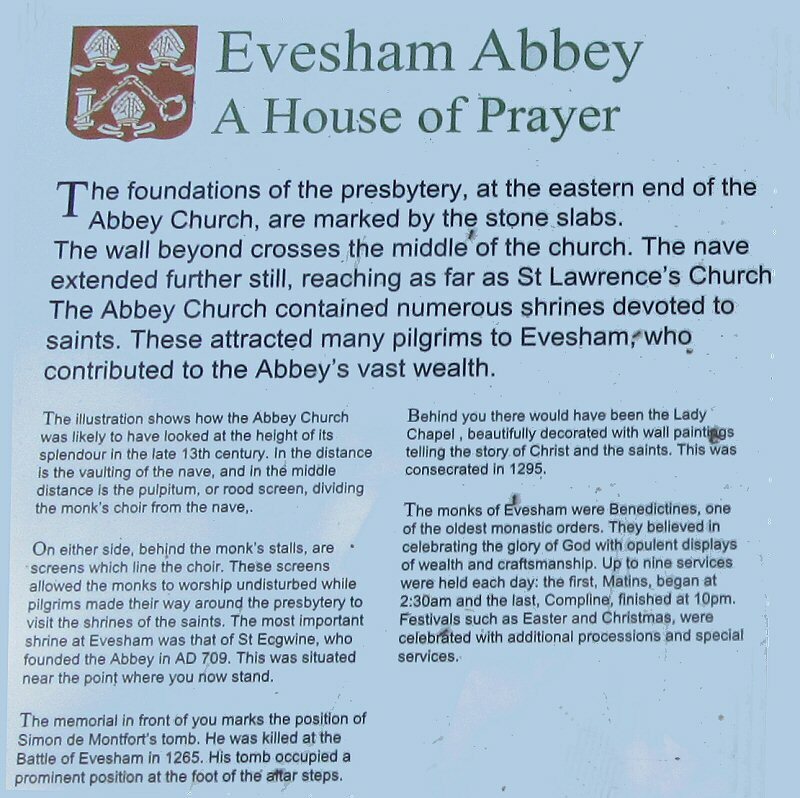 That sums up Evesham Abbey, it may be gone but it really lives on in local history and in the physical remnants left behind. 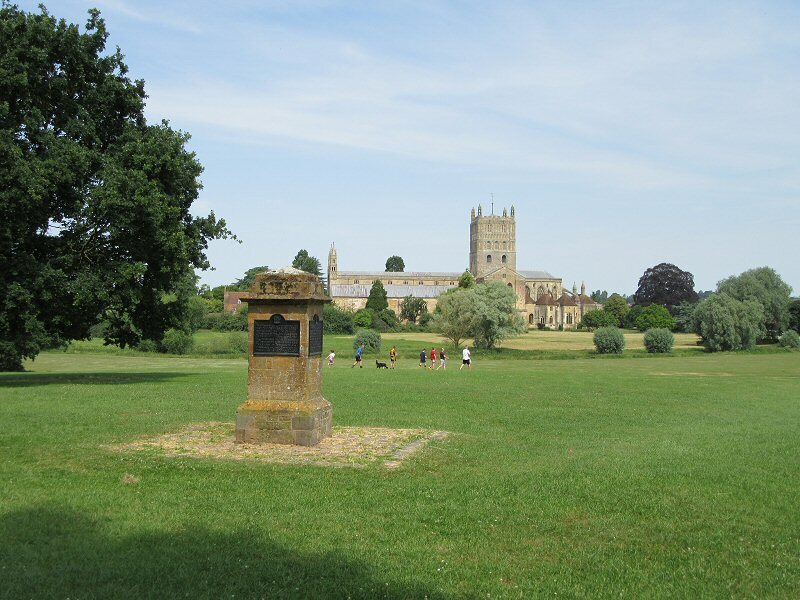 Tewkesbury was fortunate that they were spared this destruction and the Abbey still exists as an integral part of the town. Evesham was not so lucky. 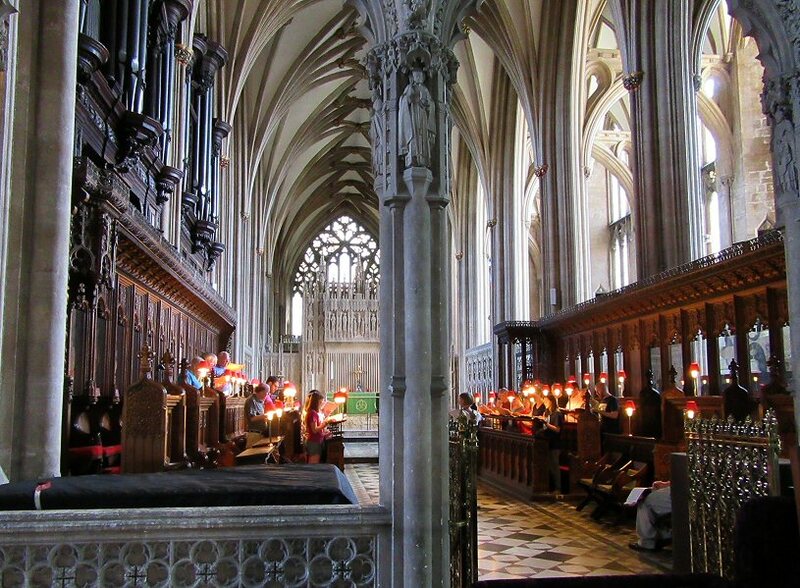 I will admit that I have not been to many Catholic Cathedrals, or even been inside any of their churches, although the odds are that some of the older churches and cathedrals may have been from the Catholic Faith before the reformation. 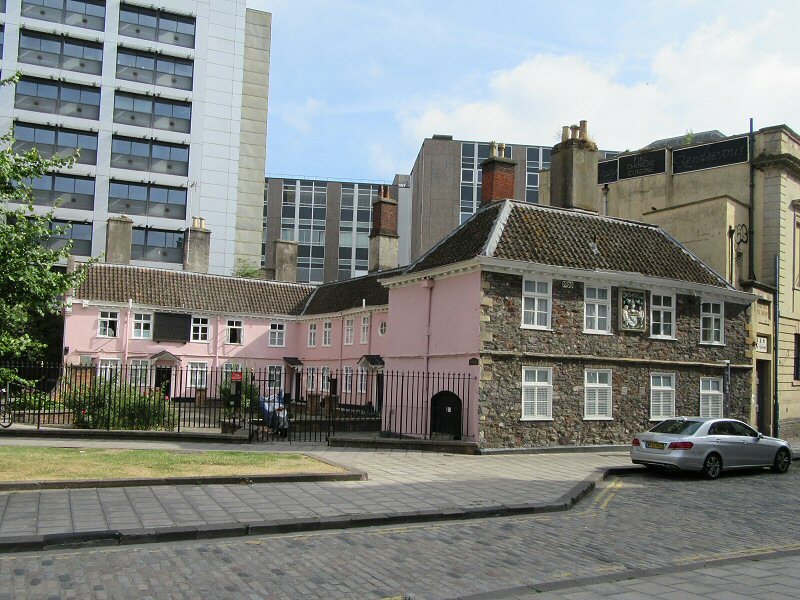 My first real view of the building was when I was looking for Abercromby Place, it was really a landmark for the park, but I had ended up in the wrong street originally so it did not help me anyway. At that time of the early evening the cathedral was closed anyway, but at first glimpse it did not really inspire much interest because it was obviously a modern iteration of a cathedral and as a result I really expected the worst. Clinical concrete, chrome and glass. I was absolutely shocked when I arrived there for my visit though because the interior I saw was like nothing that I had experienced before. 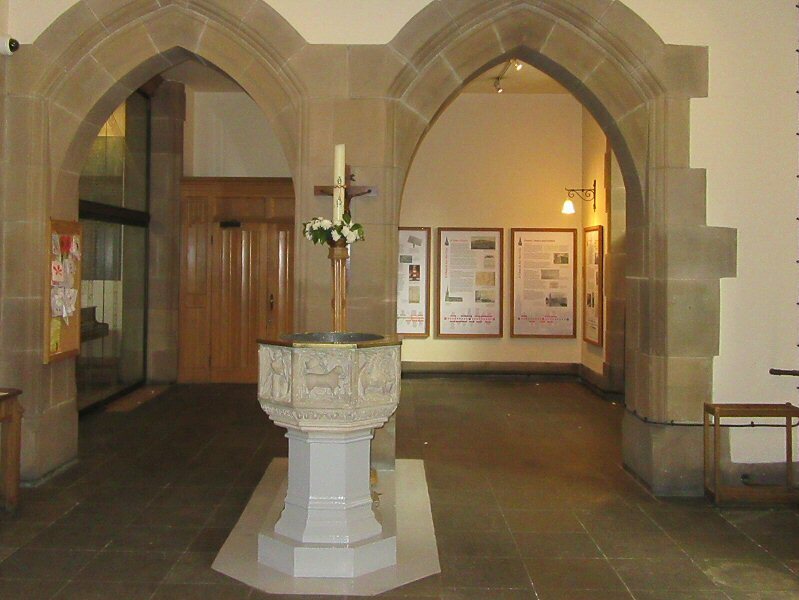 There was a service on the go in the one chapel when I got there so I ambled along on the periphery just absorbing the ambience of the building. It was like walking around the periphery of a stadium, and it was a long distance to walk around too! 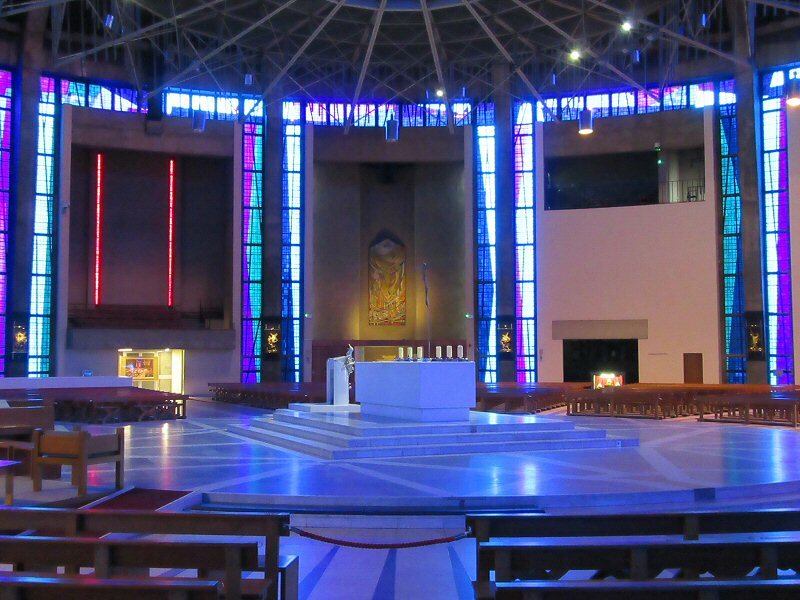 The interior was stunning; yes, there was concrete and neon and glass but it blended in with the interior space, and of course the large lantern was letting in the right amount of light and it blended well with the stained glass and coloured lighting. 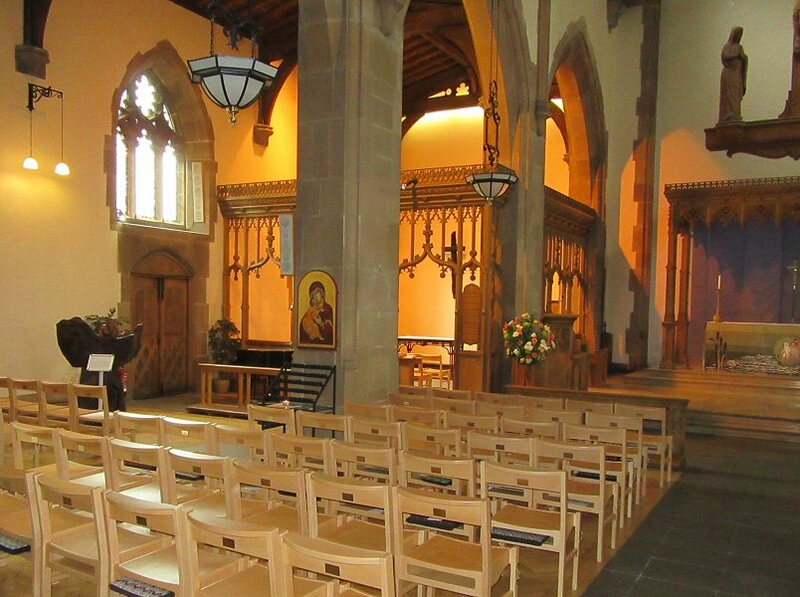 The altar and pulpit were in the centre with light coloured wood bench seating all around it. It was really an awe inspiring building, and so very different from any of the other cathedrals and abbeys that I have seen already. 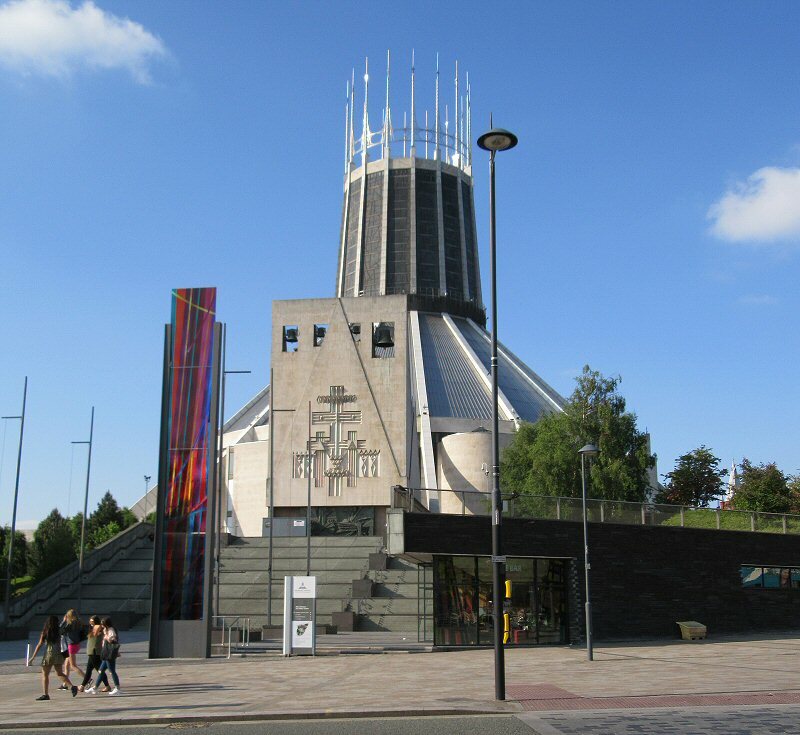 It was designed by Sir Frederick Gibberd, and construction began in October 1962 and it was consecrated on the Feast of Pentecost 14 May 1967. It is almost as old as I am! 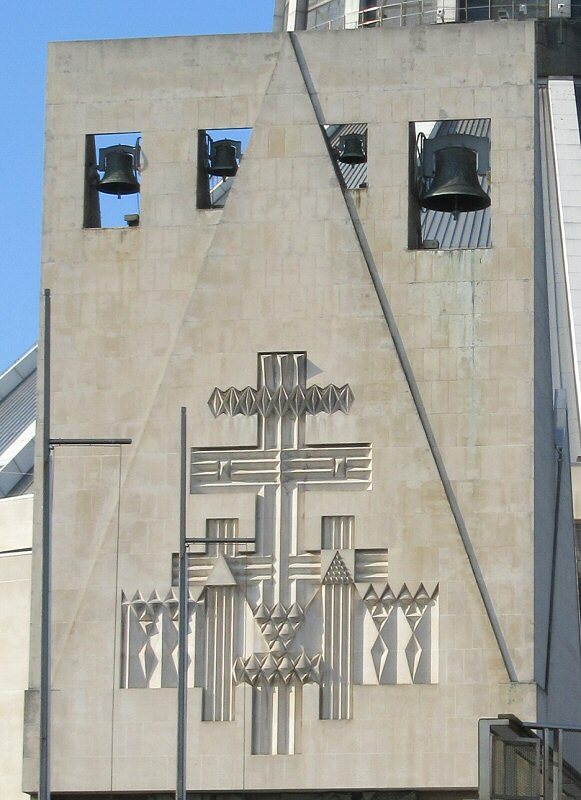 The bells are incorporated in the wedge shape above the entrance. 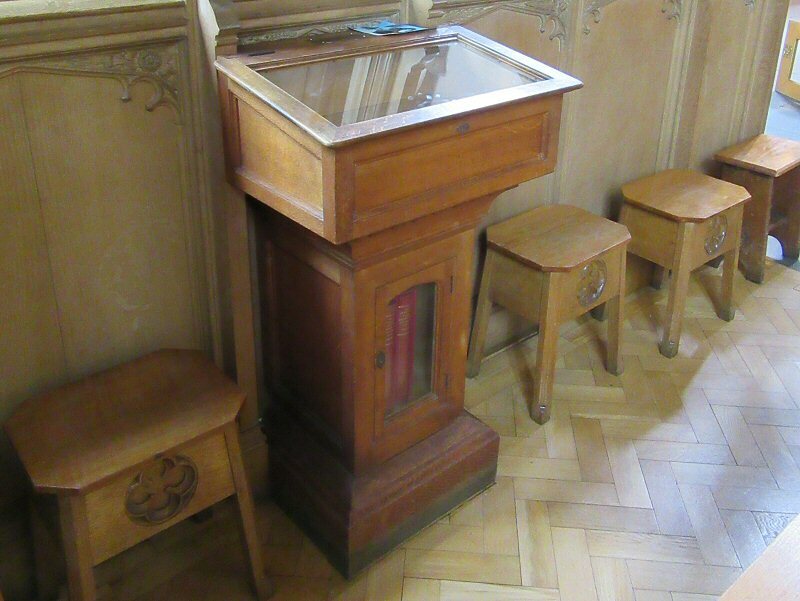 Aspects of the interiors were almost simple, but so very effective in how they were presented. 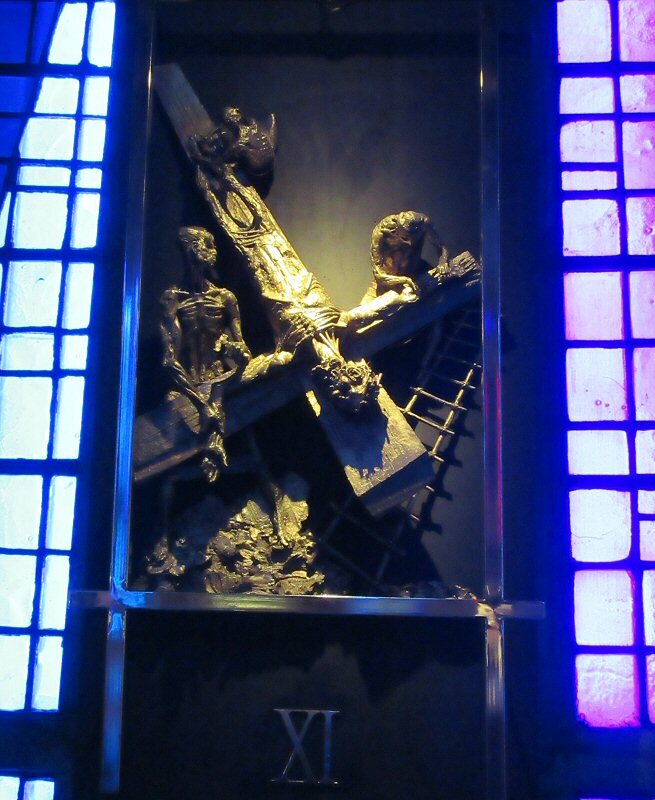 The one memorable piece of art (14 pieces actually) was Stations of the Cross by Sean Rice. 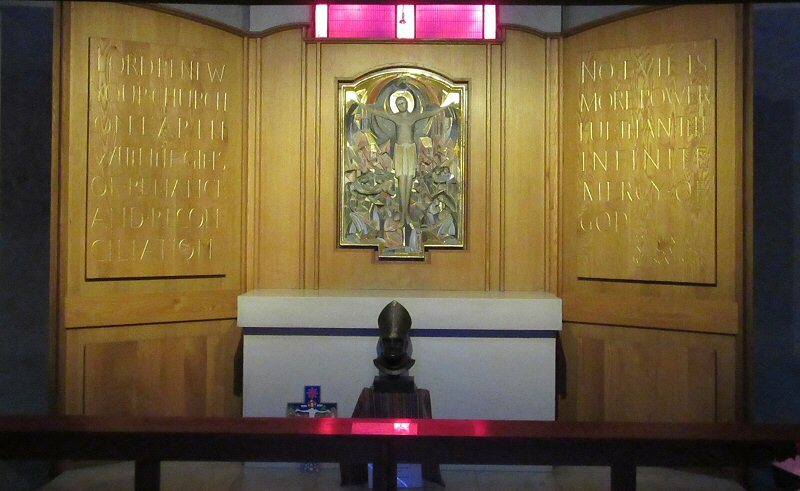 Many years ago I was given a year book from 1967 and there were images of the newly consecrated cathedral in the book, I recall that those images were odd, part of the vision of the future presented in the present. As I walked around those images came back to me and the dots were connected, this was the same place! It was infinitely better in real life. 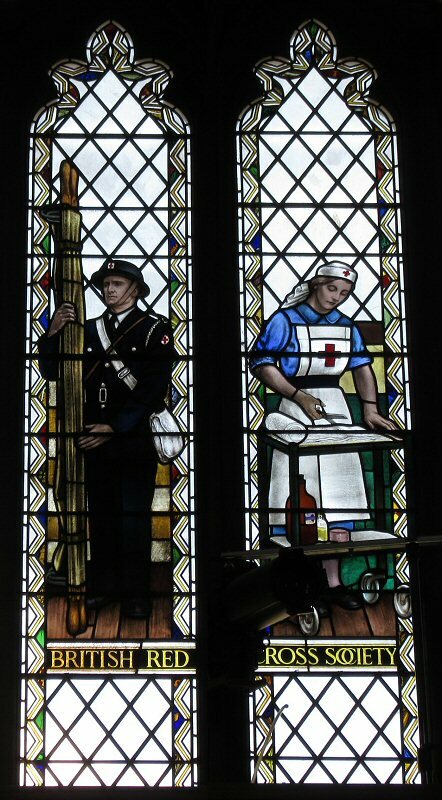 Once the service was over I could explore, but I seem to think that somewhere in the building somebody was doing something that involved moving something else because their voices resonated around me. 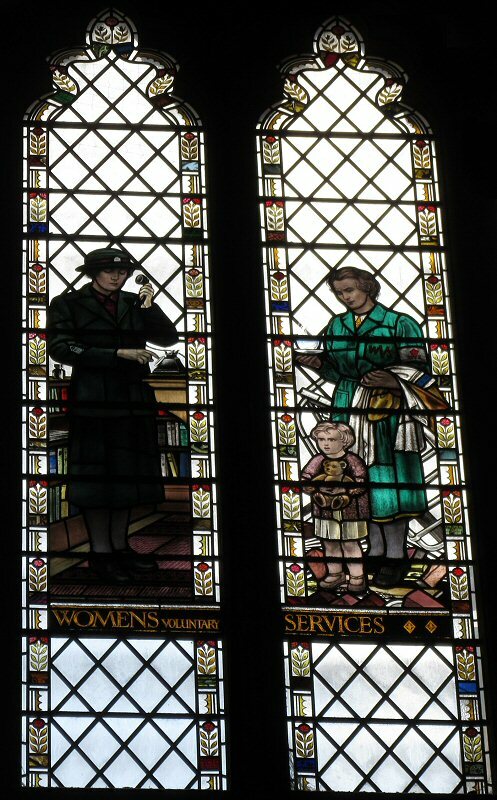 What would a service sound like? 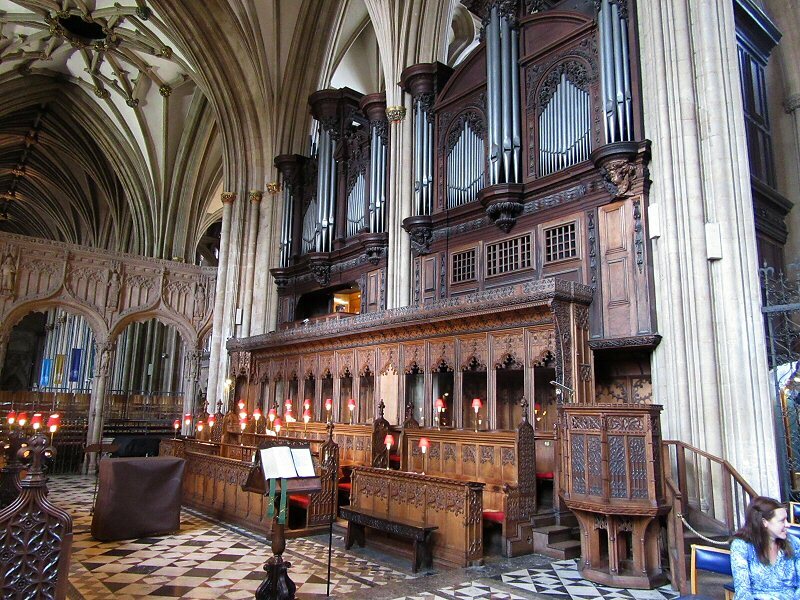 Or even the organ? I don’t have answers to those I am afraid. 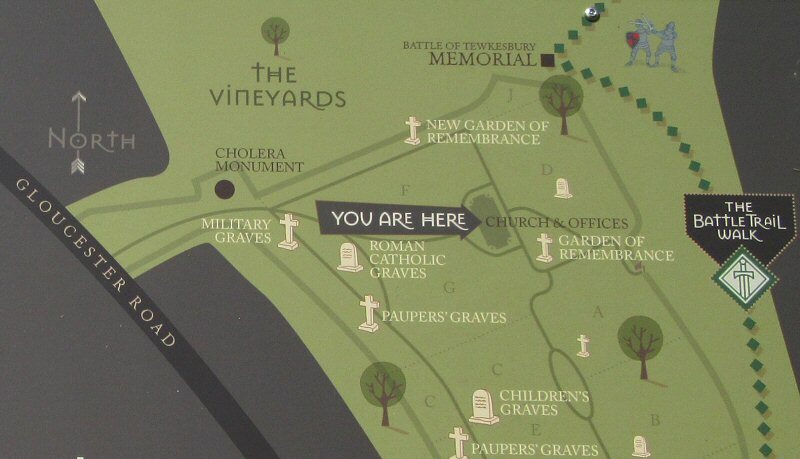 Unfortunately I did not get to look around the much vaunted Luytens Crypt, but that is parr for the course for me. One more for the bucket list if ever I return to Liverpool in the future. I left after a final look around and headed to my next destination. 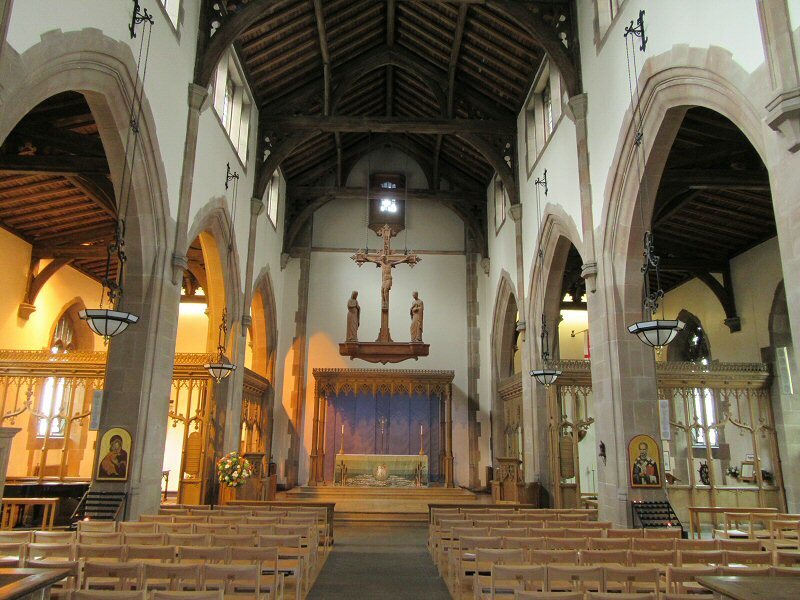 But to be honest that building really impressed me, it did not have the heaviness of the Anglican Cathedral, but had a light and almost joyous feel about it. 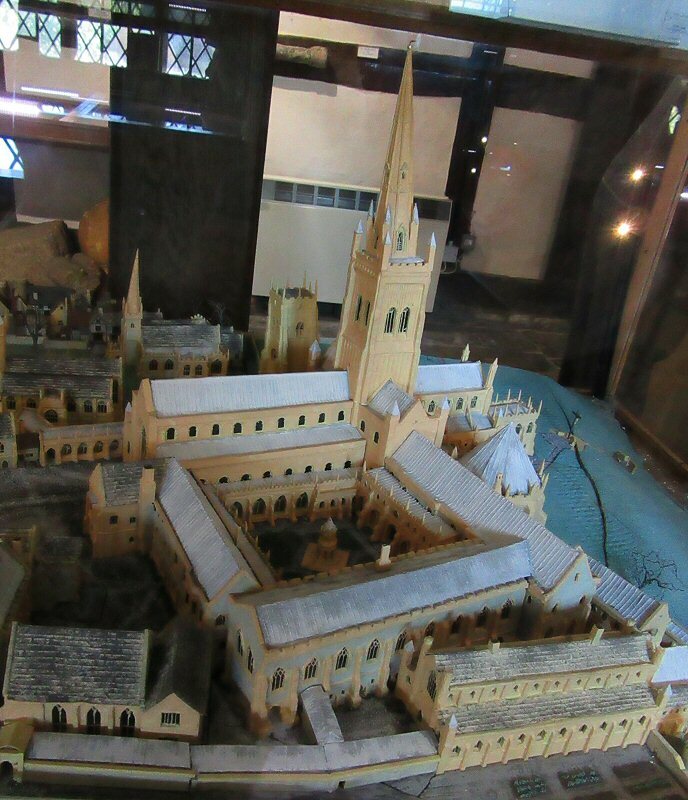 Had the grand vision of Lutyens been built it would have really overpowered everything and it probably would feel very much like St Paul’s in London which made you feel small and not welcome. Fortunately the Metropolitan was nothing like that. It had been a brief visit, but I came away much more impressed than when I had arrived. The building has its faults though and there was a lot of controversy when it started to leak shortly after it was completed. 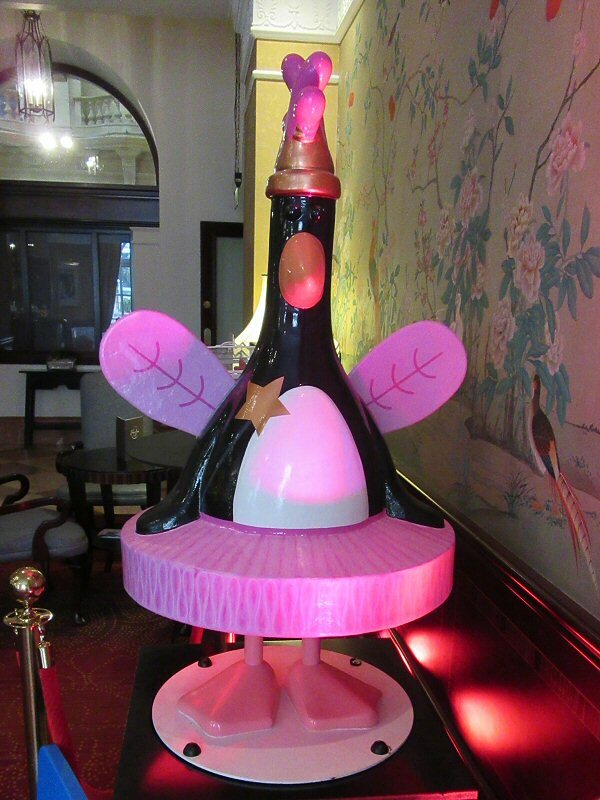 And of course detractors condemned it when they saw it. 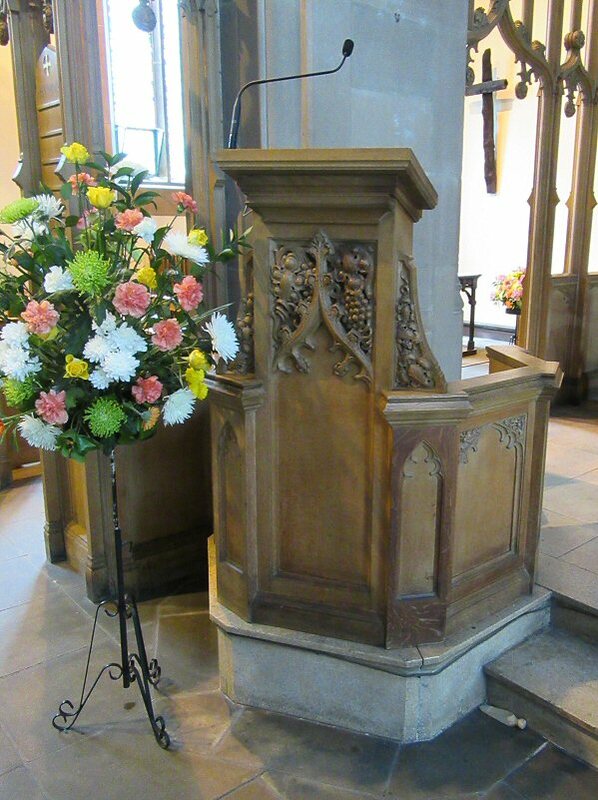 But I expect that it is past that point a long time ago and is now a part of the landscape and the congregation would not have it otherwise. The big question is: in 100 years time, will it still be here? 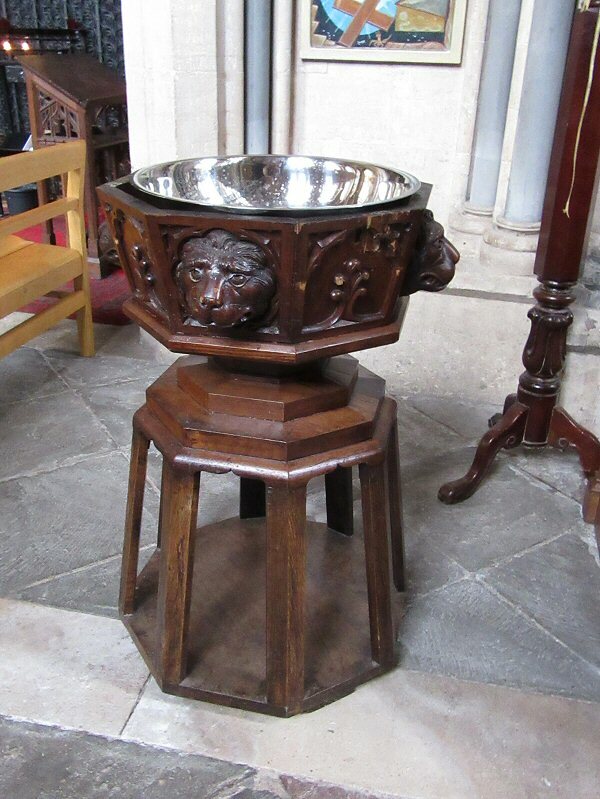 how will it survive the weight of ages like so many cathedrals and abbeys? I guess we will only know in 100 years time. 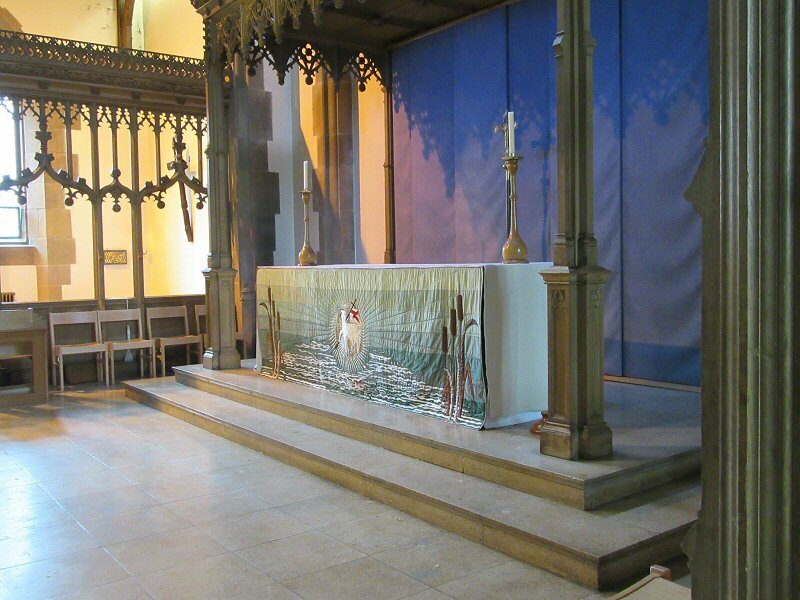 I do recommend a visit to the cathedral website too. 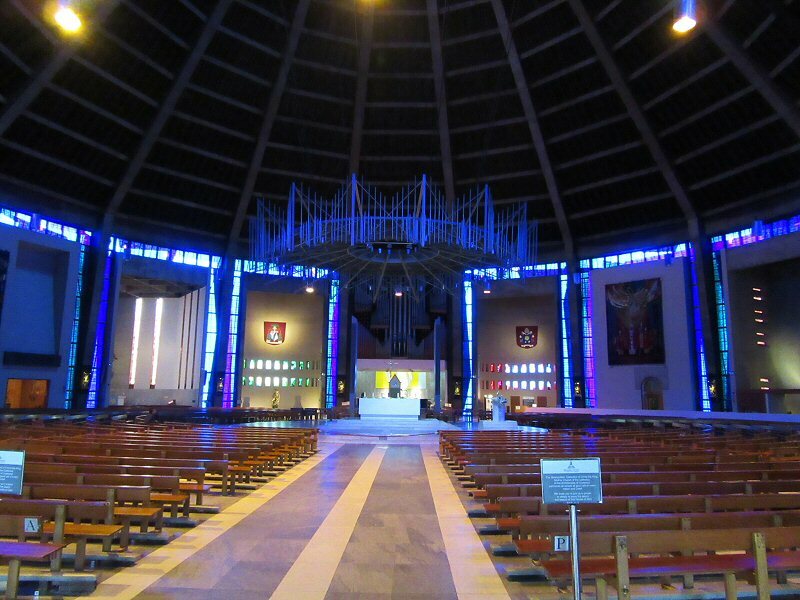 The Cathedral is the mother church of the Roman Catholic Diocese of Liverpool and the seat of the Archbishop of Liverpool, the spiritual leader of the whole Northern Province of the Catholic Church in England. Having visited the Cathedrals of Liverpool it was time to come to grips with Western Approaches Command. Have your pass ready please. 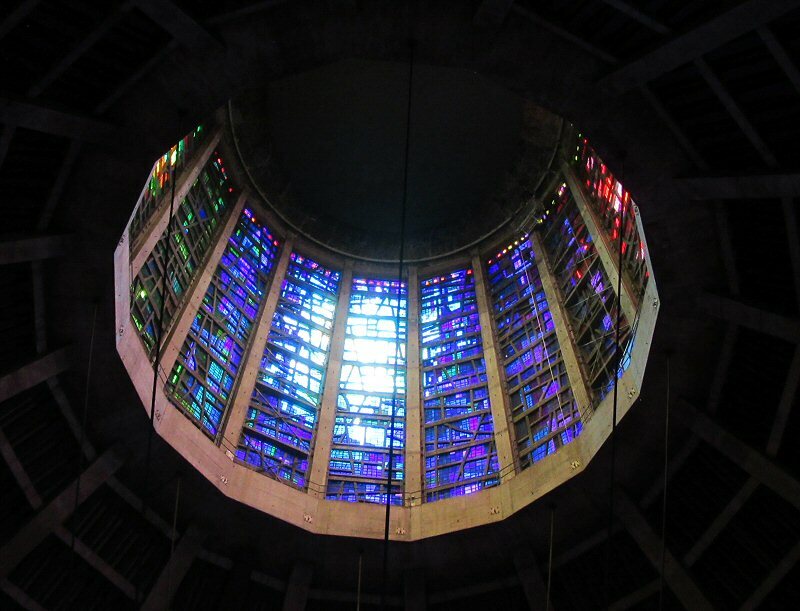 Continuing where we left off, this post deals with Anglican Cathedral in Liverpool and not the Catholic one. 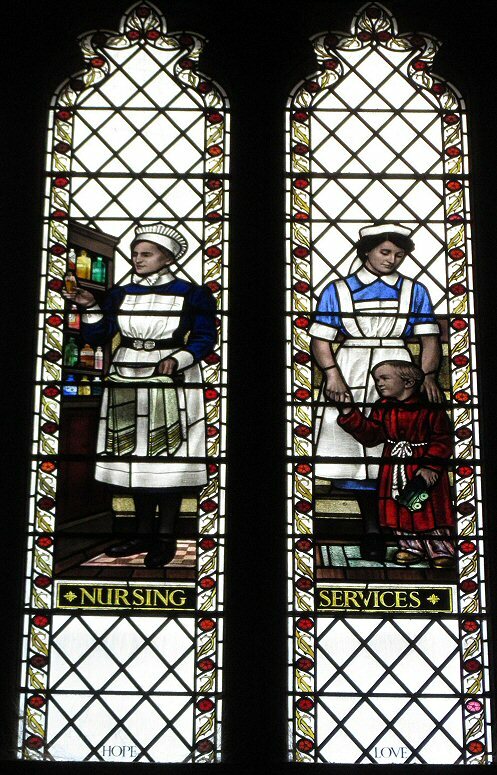 I have also merged images from both visits that I made to the building. Where to start? the building is huge and I felt the exterior gave it a very gloomy and brooding look. Make no mistake though, it is so big you can see it from the waterfront. From close up it is even bigger and does not easily fit into the lens when you try to photograph it in it’s entirety. The interior is incredibly difficult to photograph because of the sheer size of the building, so everything is just so much bigger or further away. 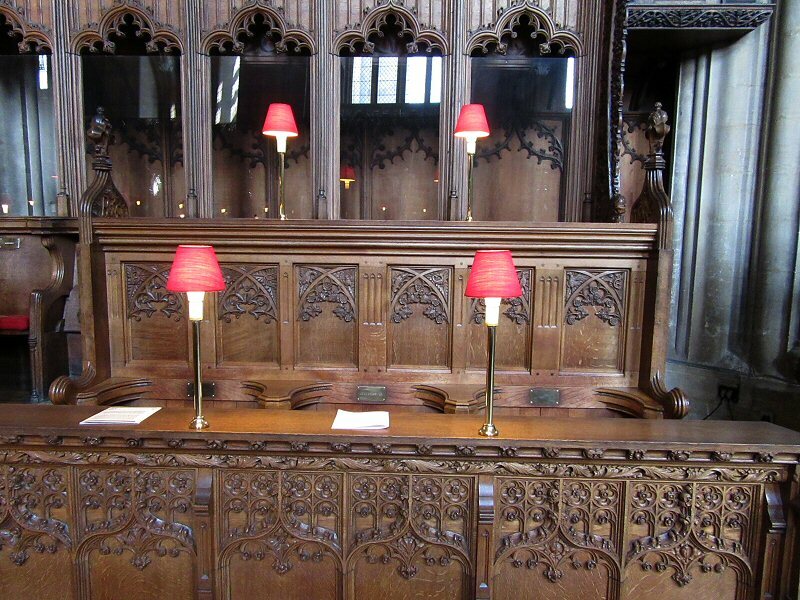 Unfortunately I was unable to get into the Lady Chapel as it was closed off during my visits. 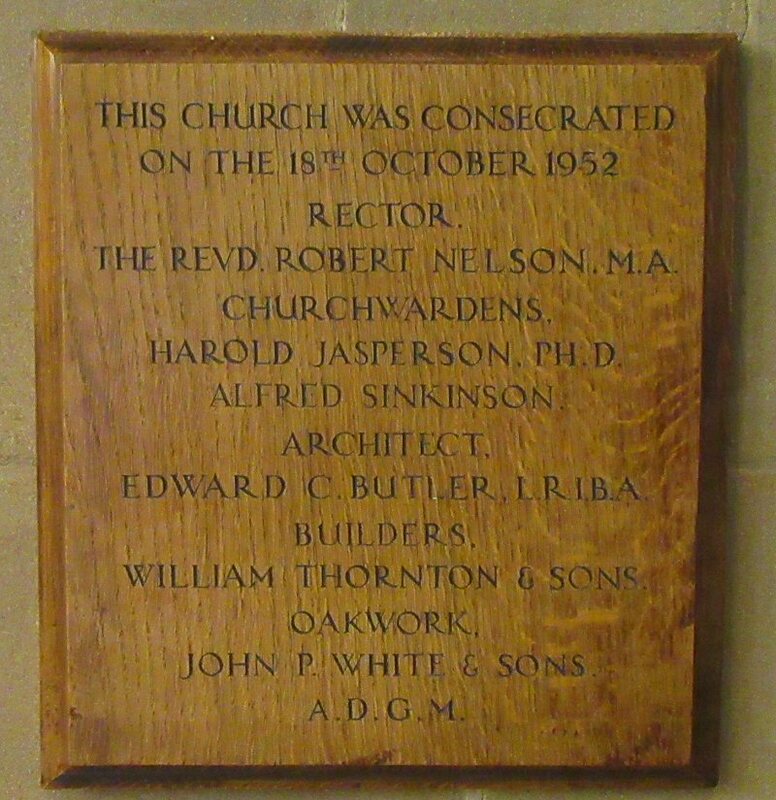 The building was designed by Giles Gilbert Scott and the foundation stone was laid by Edward VII in 1904. 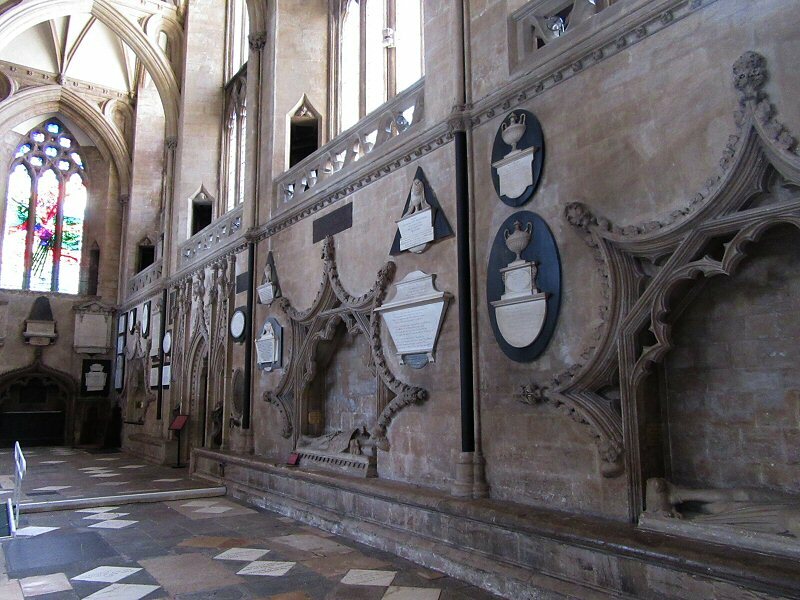 Unlike so many of the ancient cathedrals I have visited, this one does not have a lot of wall memorials, and I suspect not too many burials beneath its floors. 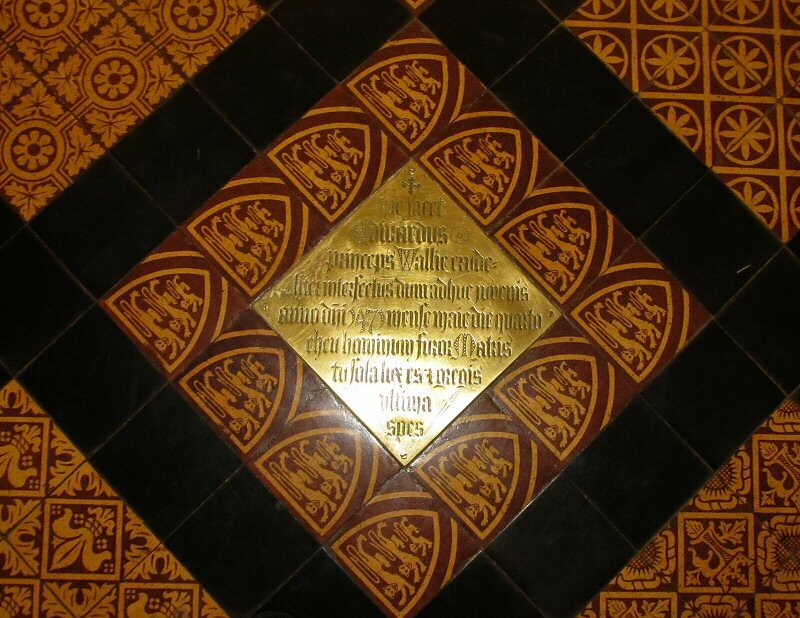 There is however, a memorial commemorating Giles Gilbert Scott set into the floor under the tower. The architect is buried outside the building in a grave very close to it. 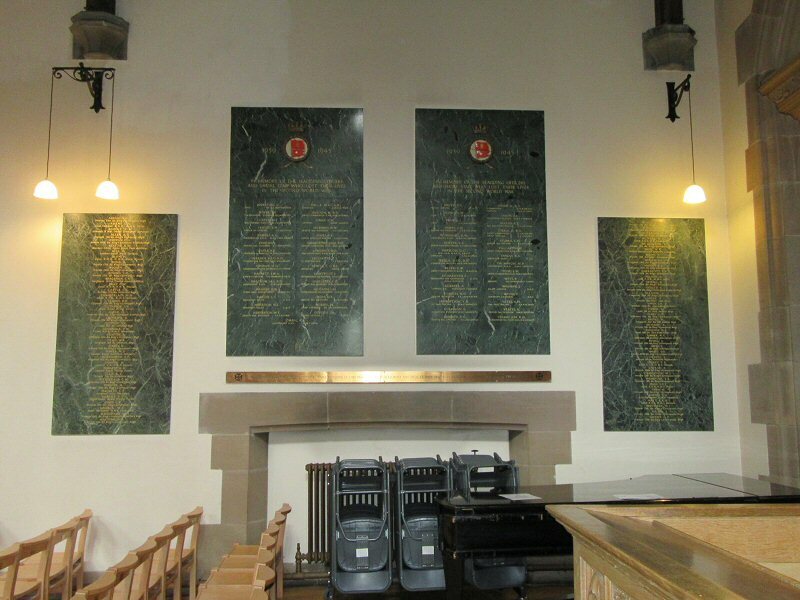 While affixed to the one wall is a memorial to Francis Chavasse, the second Bishop of Liverpool from 1900-1923, and father of Noel Godfrey Chavasse VC* MC. 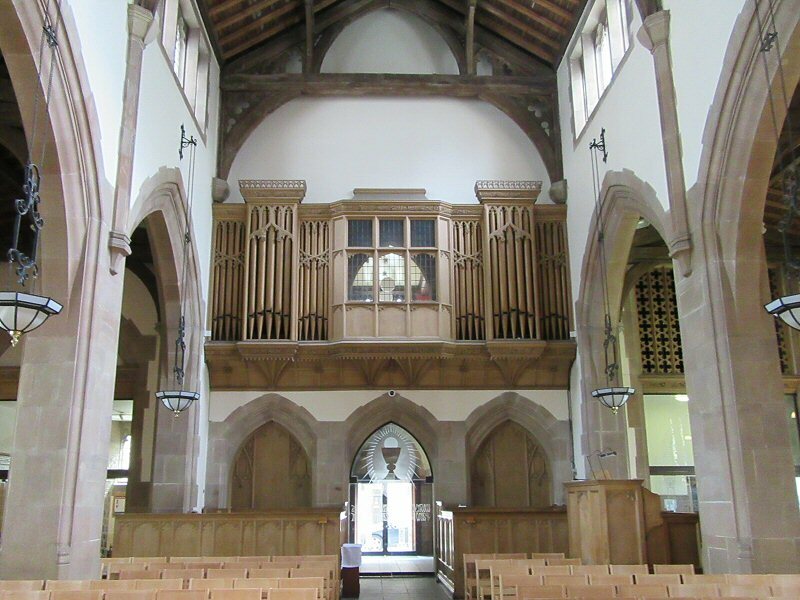 Even the organ is large, and is the largest pipe organ in the UK. 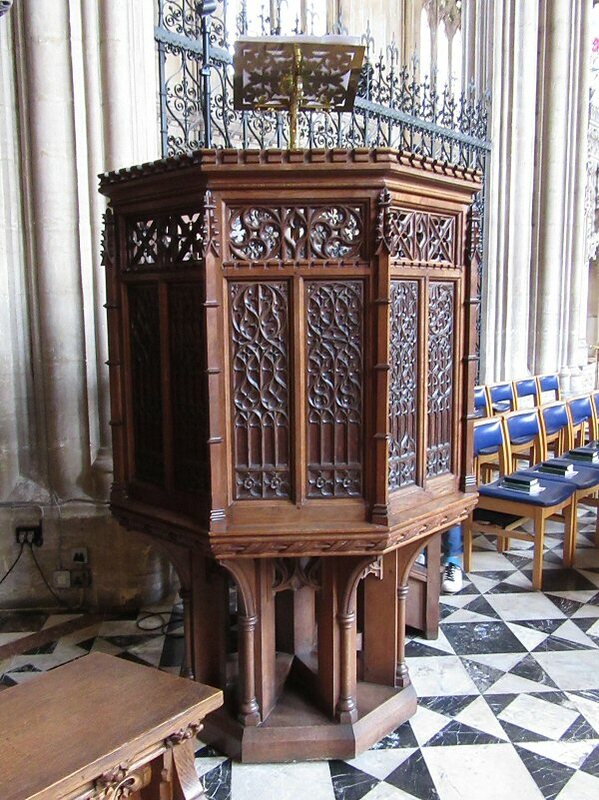 It was built by Henry Willis & Sons, and has two five-manual consoles, and 10,268 pipes. 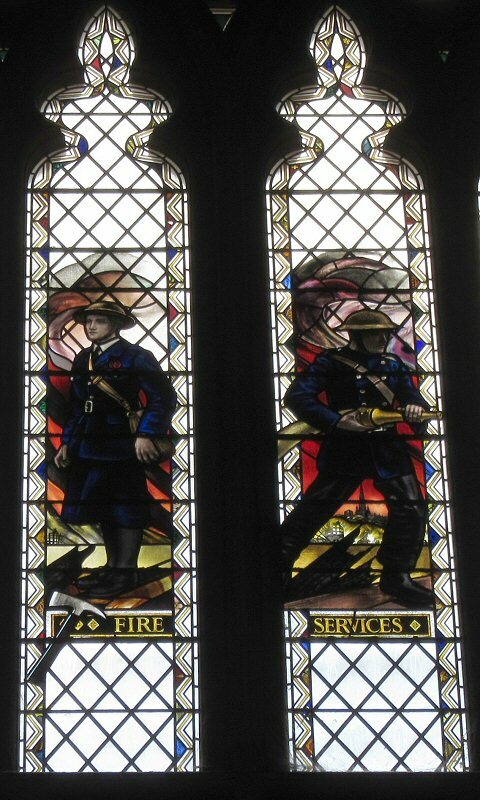 The War Memorial Chapel is not marked on the map but is on the left hand side just before the organ (# 5 on the map). 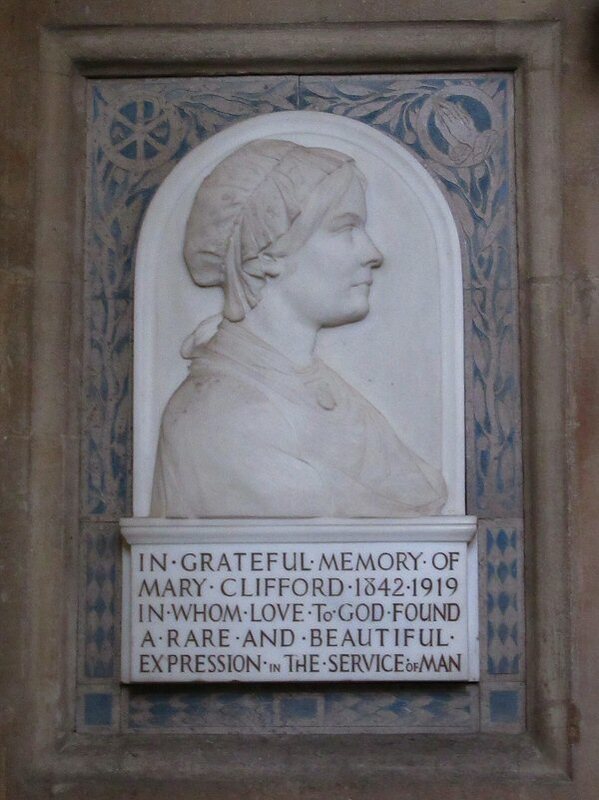 I did not really think much of it and found it really bereft of memorials and really very plain. 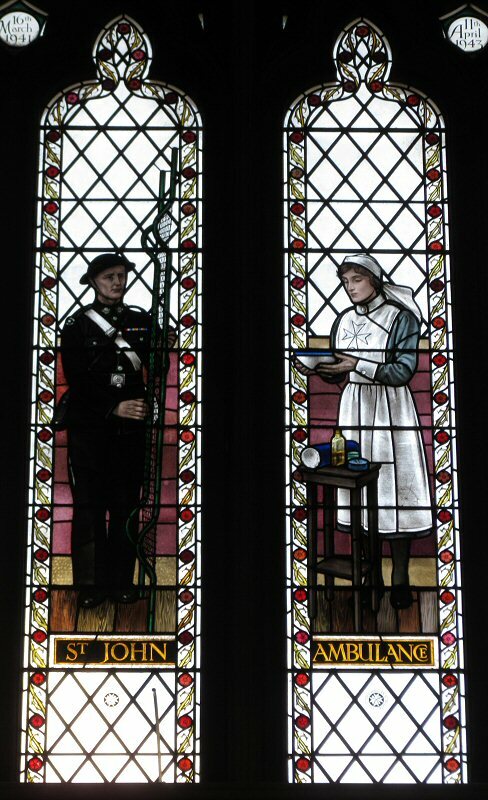 The Roll of Honour is placed in a glass topped cabinet in the front of the chapel, and it is opened on the page with the Victoria Citation of Noel Chavasse, while a bust of the Captain is affixed to the wall close by. 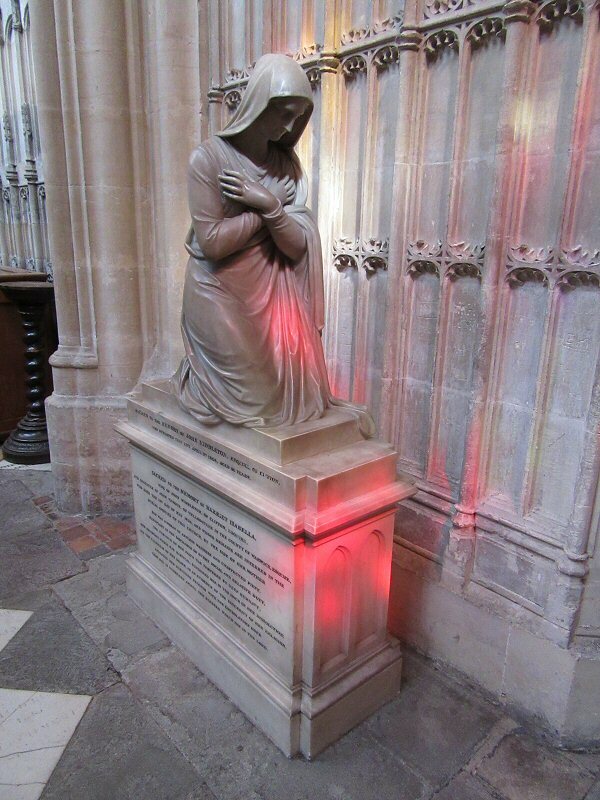 I was really battling to photograph in the cathedral which tended to be dark in some area’s and of course trying to avoid including people in my images was sometimes impossible. The bell tower (aka Vestey Tower) is named after its benefactors, the Vestey family, and has a floor to top height of 101m (331ft). 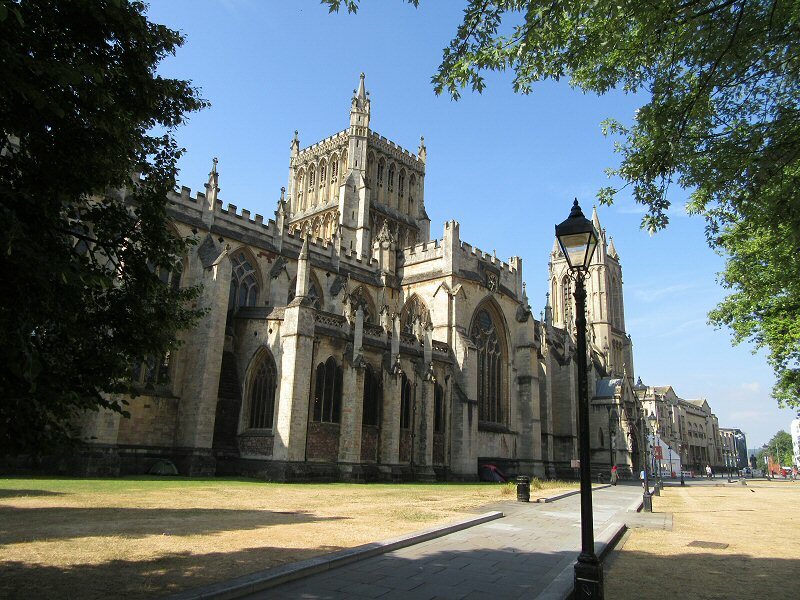 The bells housed in the tower are the highest and heaviest ringing peal in the world. There are two lifts (thankfully) and only 108 stairs to the top. The peal proper consists of thirteen bells weighing a total of 16.5 long tons. 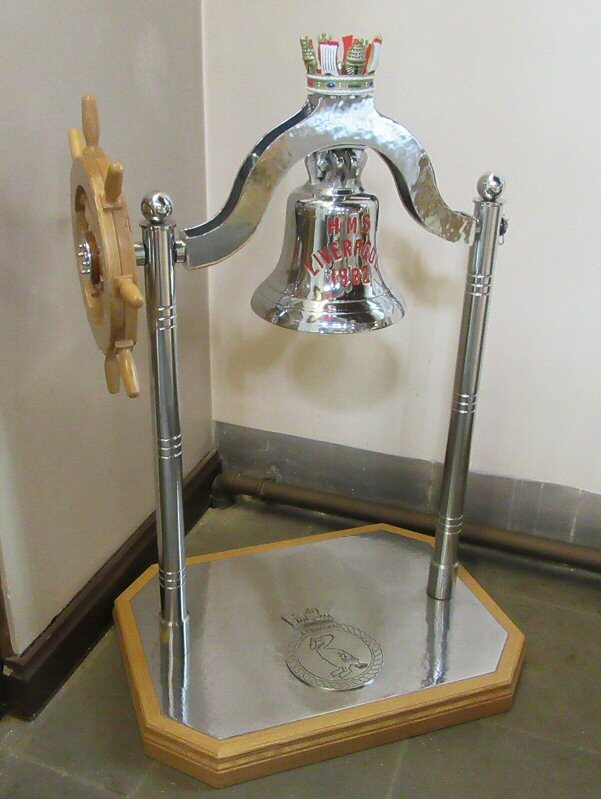 They vary in size and note and all thirteen bells were cast by Mears & Stainbank of Whitechapel in London. I went up the tower on the 2nd day of my Liverpool visit as it was too late to do on the day before (although I should have done it considering what the weather was like on my 2nd trip) . The two lifts can only take 6 people at a time so it can take some time to ascend or descend. Fortunately there are only 108 steps. Had they only been steps I would not have climbed the tower at all! It was miserable outside though so the view was not as far as I would have liked, or as good as it could be. And then it was time to descend. There was a young woman wearing very high heels tottering around the tower and I did not want to get stuck behind her while she went down the stairs in them. 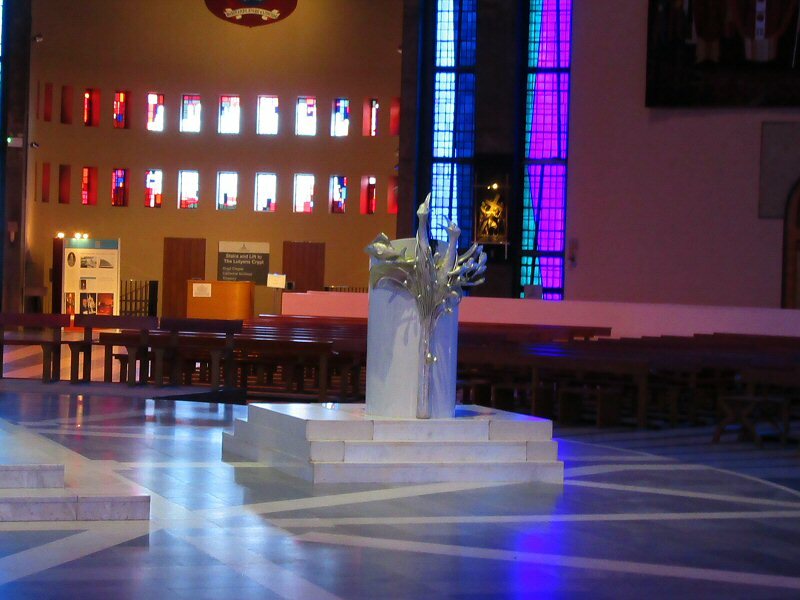 It was also time to leave the cathedral. 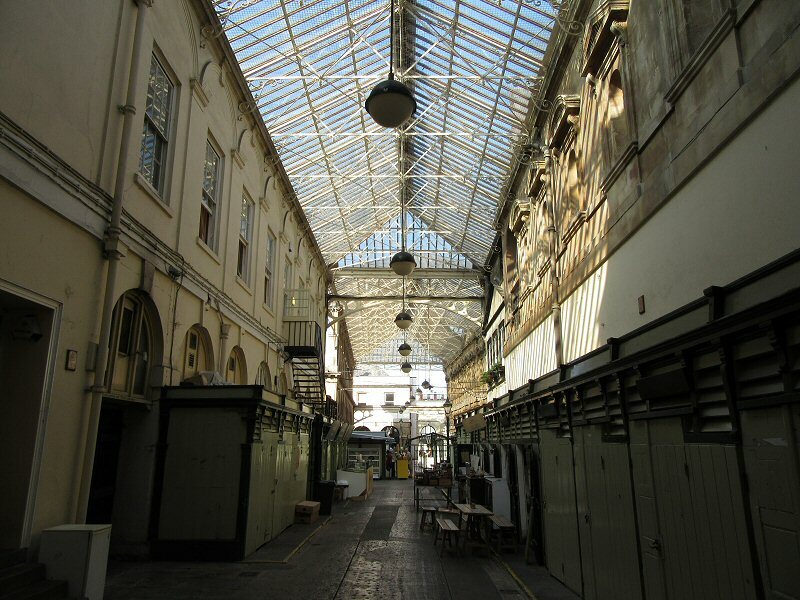 There is no doubt that it is a mighty space, it is a very overpowering building and well worth multiple visits because there is so much more that I have not covered due to constraints on the blog platform. I have surprisingly few photographs of the interior simply because much of the interior is too large to photograph without proper equipment. The amazing thing is that the building is not as old as some that I have seen, and it will probably be around long after I am gone. What will people 100 years down the line have to say about it? will it even exist? 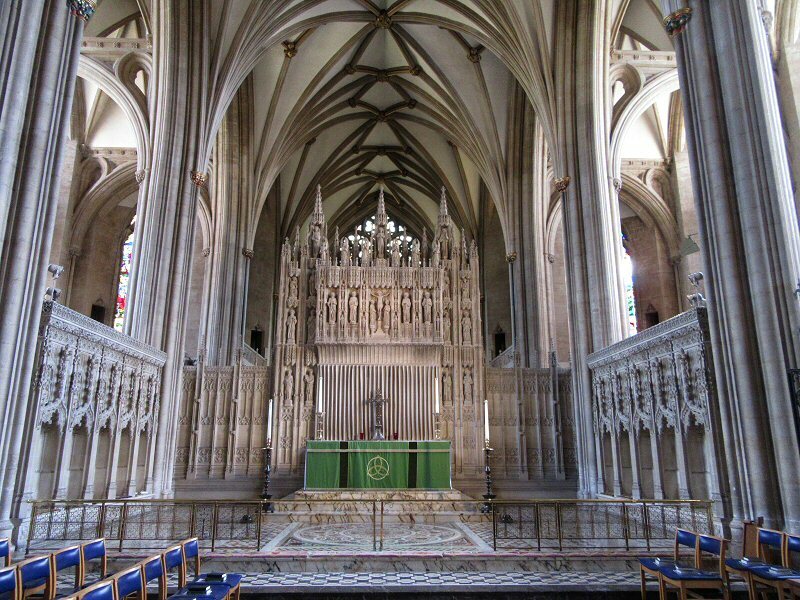 given how long lived cathedrals tend to be I am sure it will be. 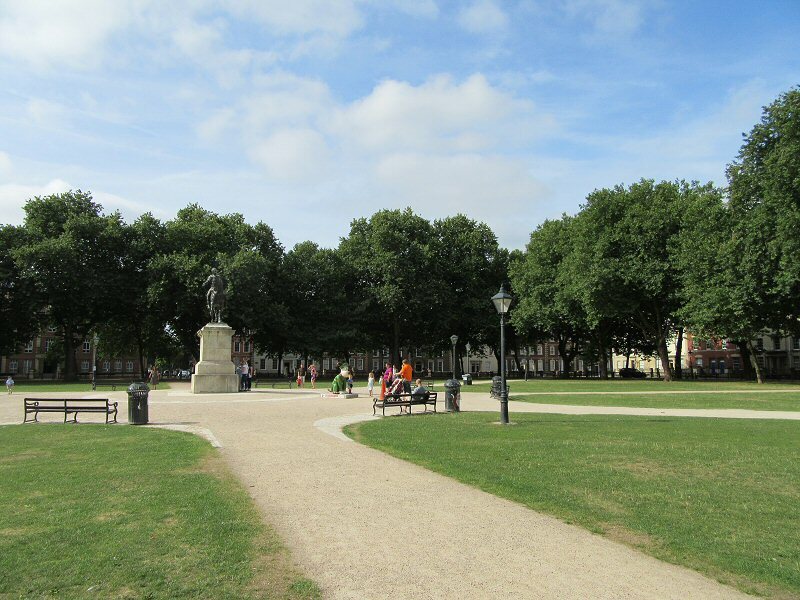 In which we go looking for Abercromby Square. Having checked into my hotel and showered I still had some time to kill as the sun was still high and bedtime was nowhere close. Marked on my navigation was “Abercromby Square” which sounds kind of obscure but there was a reason for my interest. 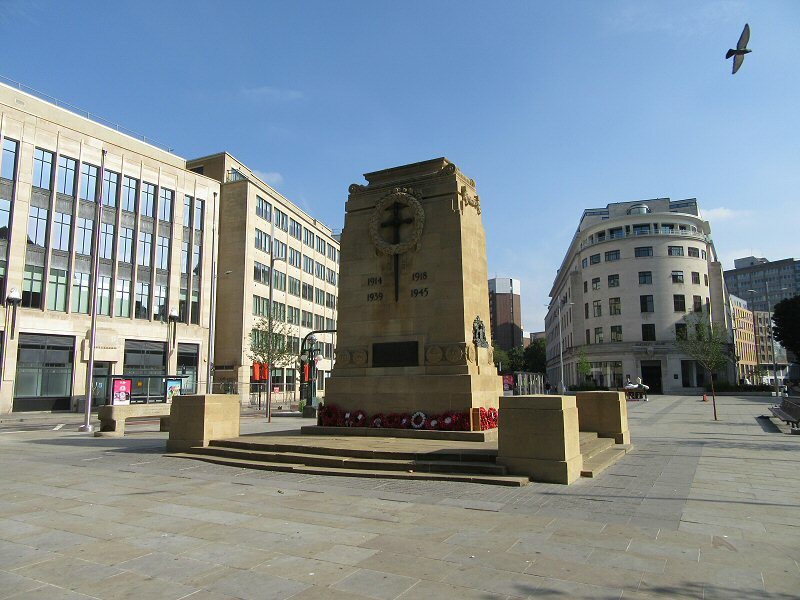 Liverpool was home to members of the Chavasse family, the most famous of whom was Captain Noel Godfrey Chavasse. VC*, MC. 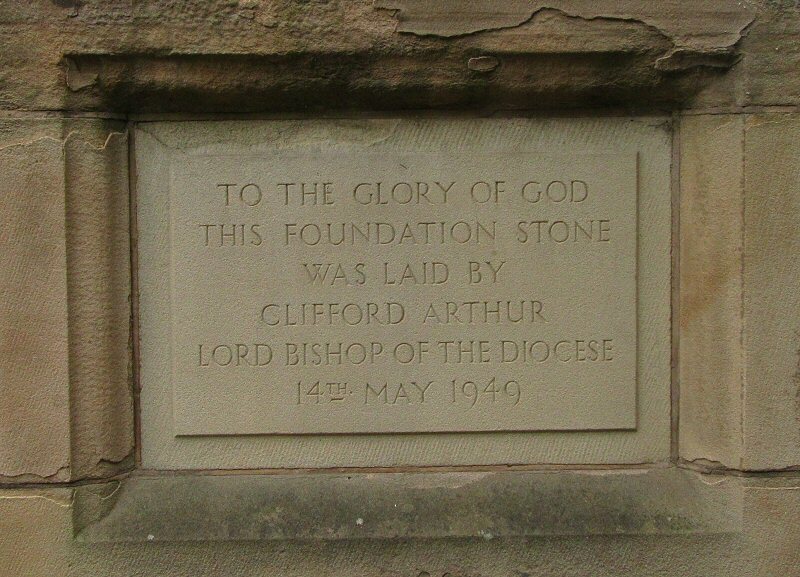 while his father was the second Bishop of Liverpool. 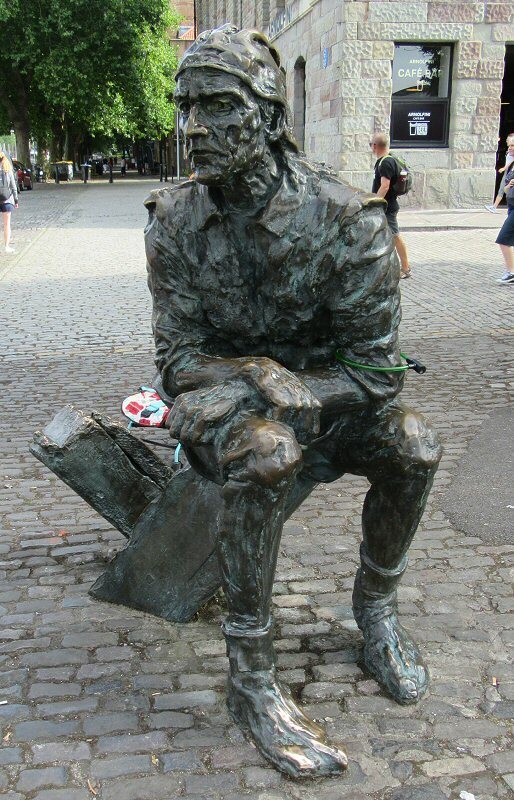 I was keen to find the place because there was a statue of him in the square. It was more like a pilgrimage though, and one of the many reasons I was visiting this city originally. 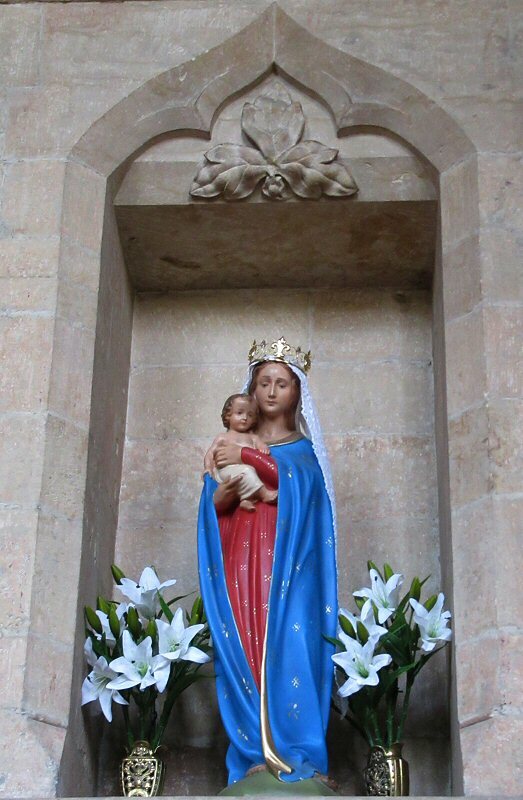 Unfortunately my street map did not show the square, but I knew it was close to the Catholic Cathedral so technically should not be too difficult to find as long as I went up the right street in the first place. Unfortunately I did not and while I could see the cathedral I could not work out where the park was on the ground in relation to it. My mapping app did not work either because it would never refresh and if you tried to refresh it manually all you would end up was a “mapping app has stopped functioning” error. Bah humbug! 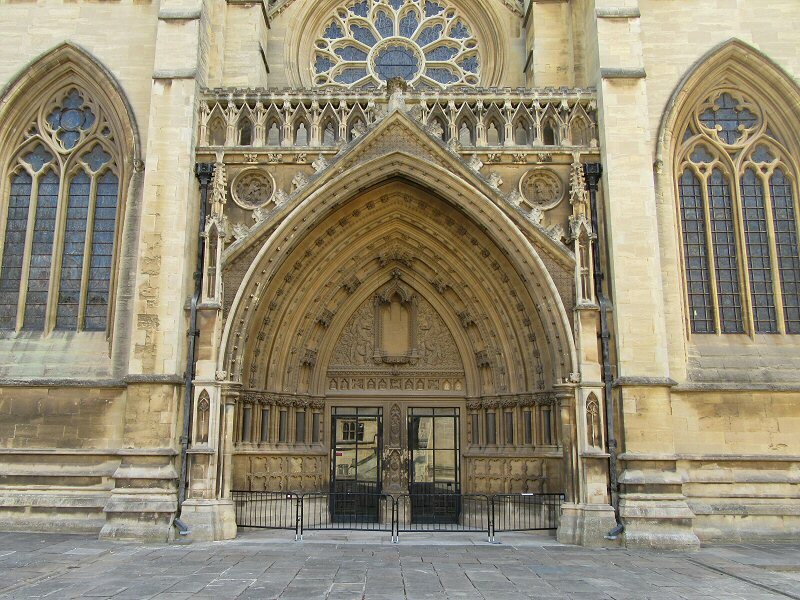 I decided that my best course was to try the roads at the front of the cathedral (this is the back) and see what happens. Fortunately a kind hearted soul took pity on me and pointed down the road to a green area 3 blocks away. Huzzah! the destination was in sight. 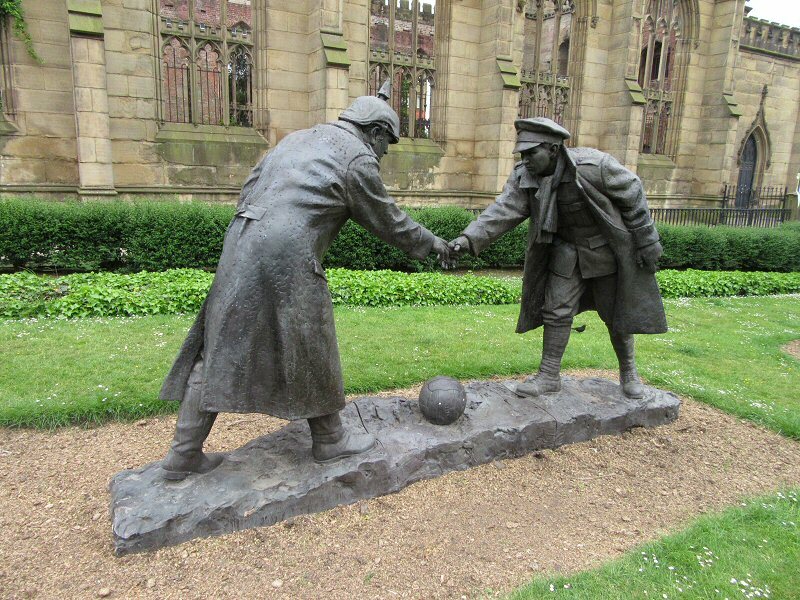 The statue was not in the square but on the pavement next to it, and it was such a moment to see that statue. us all of the debt we owe to such men. 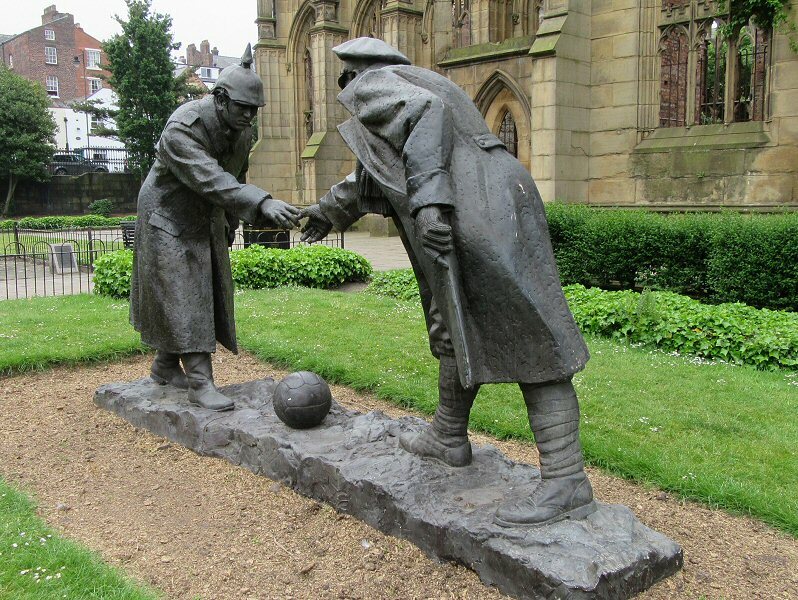 The sculptor is Tom Murphy of Liverpool. It was time to move on. The Catholic Cathedral was closed so I started to head towards the direction of town. 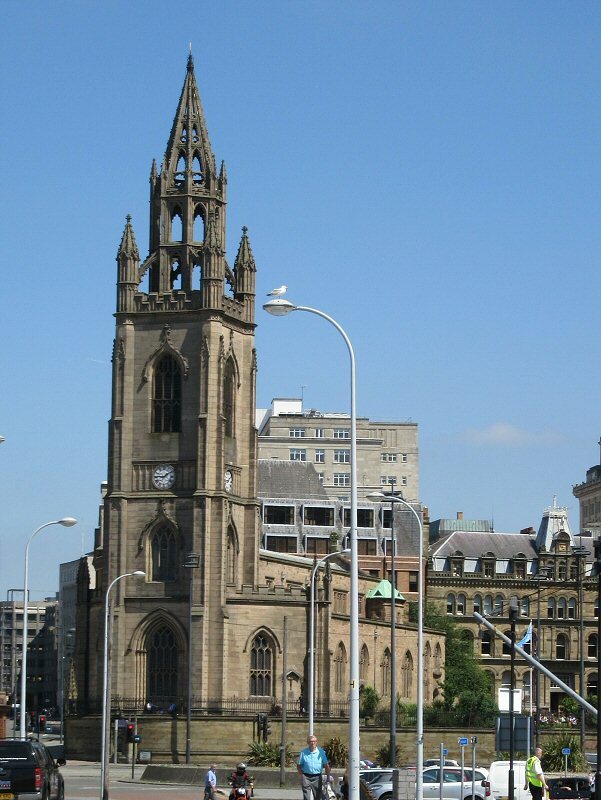 Unfortunately for me, the Anglican Cathedral loomed close by at the end of a street. It just seemed so close. The sun was still shining and I had some time to kill so I thought I would head down in that direction and have a quick recce before returning the next day. 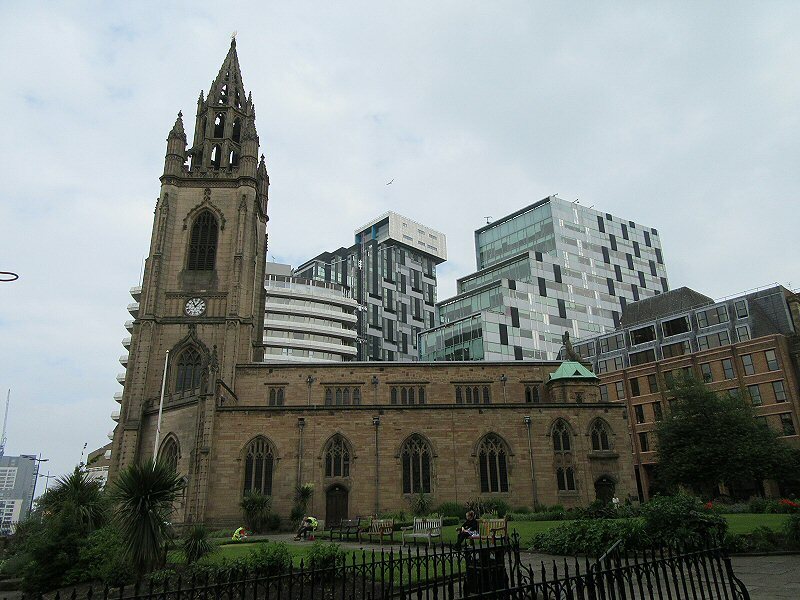 There were really two spaces I wanted to visit at what is known as “St James Mount”:- the first was the actual cathedral, and the second was a cemetery known as St James Garden (aka St James Cemetery). 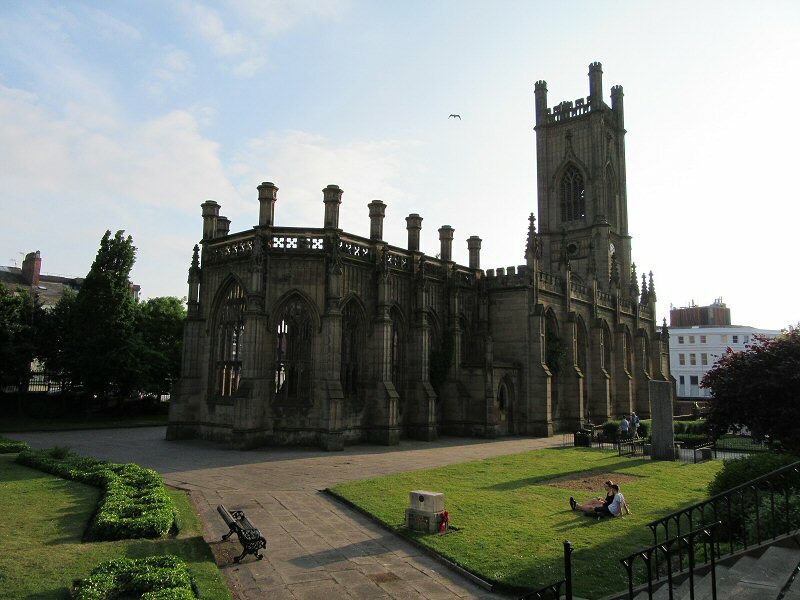 Situated behind the cathedral it was created below ground level in a former quarry that was in use till 1825, and until 1936 was used as the Liverpool city cemetery and contrary to what you would think, the cemetery is not associated with the cathedral. It is a very beautiful place and I was very glad that I saw it in the evening light. I went in through the gate by the Oratory, which is the former mortuary chapel of the cemetery. 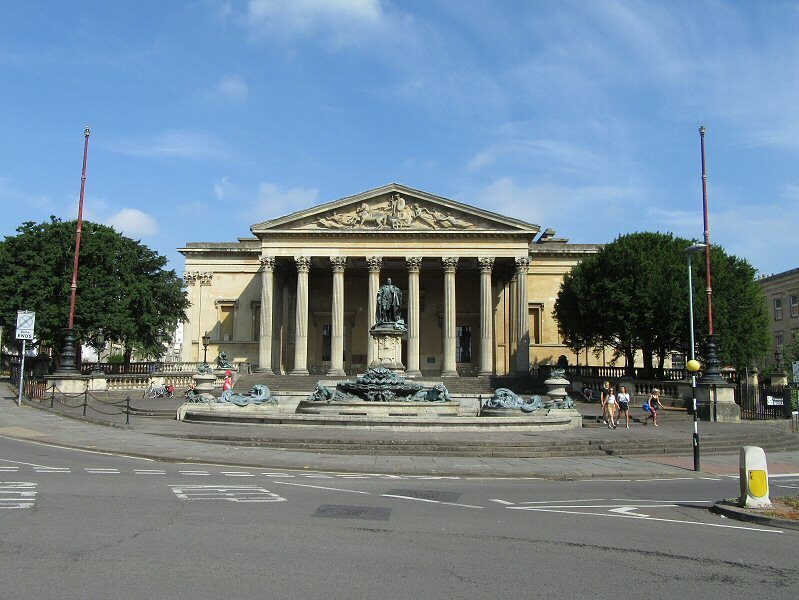 It was designed in 1829 in classic Greek architecture by John Foster Jnr, as a re-creation of a Greek temple. 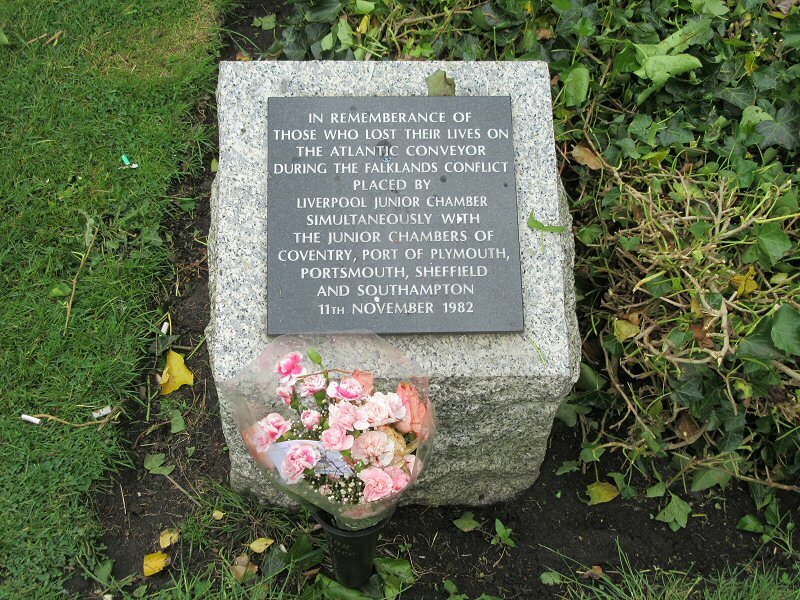 Once flat ground was reached I was in a quiet park, dotted with headstones, flowers, pathways, mausoleums and trees. People were sitting around and enjoying the coolness of the air, others were walking their dogs or just strolling. It was hard to believe that you were actually in a cemetery that held close to 60 000 people. 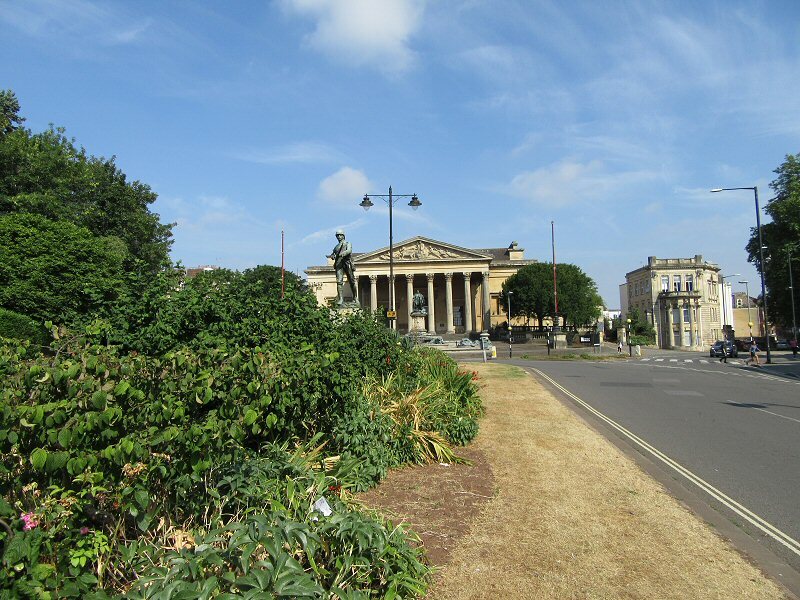 The domed cupola in the last image is the Huskisson Monument, it was designed to house the statue of William Huskisson who holds the distinction of being the world’s first reported railway passenger casualty; when he was run over and fatally injured by George Stephenson’s pioneering locomotive engine Rocket. The statue is no longer there, but the monument is. A mineral spring also flows through this area (the Chalybeate) although I did not see it at the time. From the flatness of the bottom of the quarry it was time to ascend. I was starting to tire and needed to make my way home so I followed the path upwards to the gate and to ground level. This was the back of the cathedral and even here people were enjoying the warm evening air. I really felt like staking a spot for myself but I still had a long walk ahead of me so resting was not an option at this point. I walked past the huge building and it is a mighty, lofty, looming building. 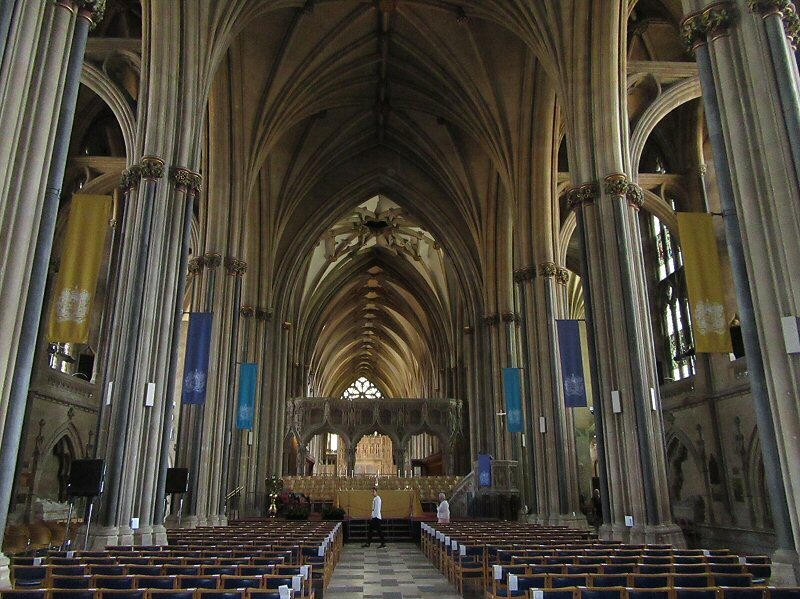 It is reportedly the largest Anglican Cathedral ever built. 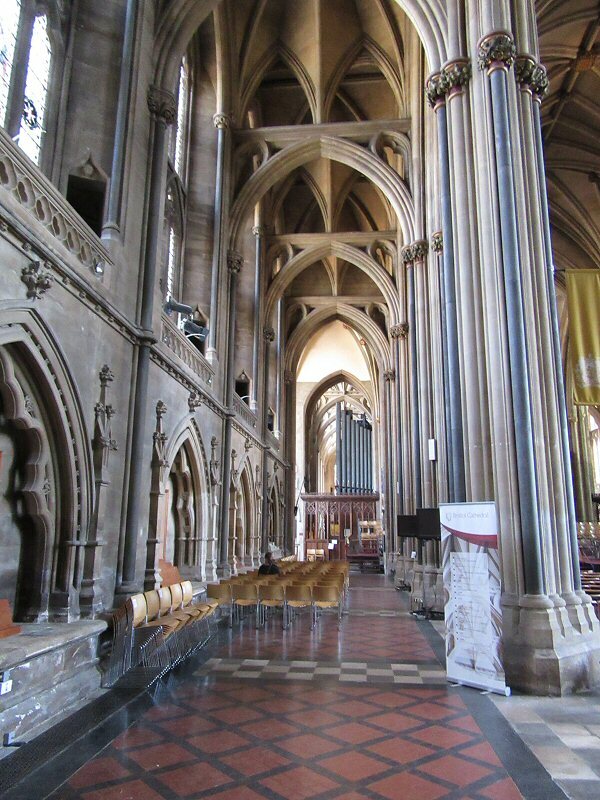 I came to the spot where I had entered the area and saw that the Cathedral was open so decided to pop in and have a quick look…. The Museum of the Moon. I kid you not, the moon was shining in the cathedral, and it was magnificent. Photographs do not do the work justice. And having stood in awe at the moon and the cathedral I shall now turn the page and cover the cathedral on the next page. I headed off home after a quick walk around and spent a restless night trying to get to sleep. I was bushed, but the reality is that I had accomplished all that I wanted to see and do in half a day. 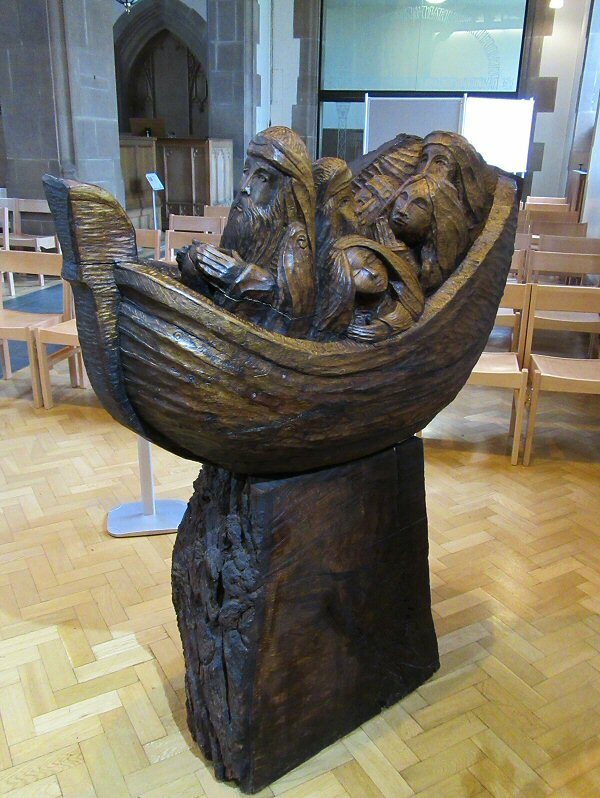 The only thing left was the ferry trip across to Birkenhead and of course the cathedral. The bridge was erected in 1856 and as far as I can recall it is called the Workman Bridge (named after the mayor at the time). That is the Avon stretching away into the distance. 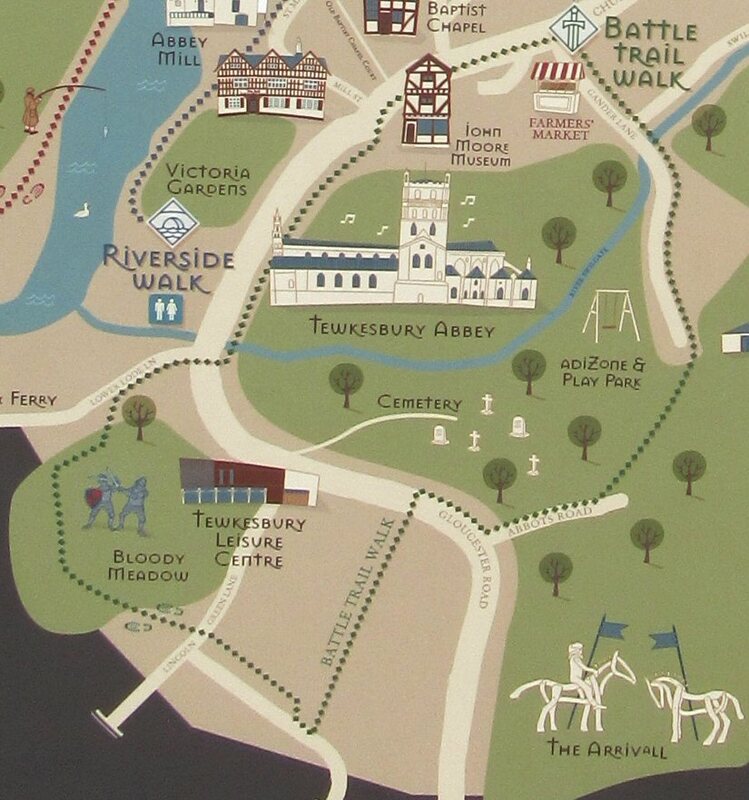 Evesham sits in a lobe of the Avon, and like Tewkesbury it probably suffers each time the Avon floods. 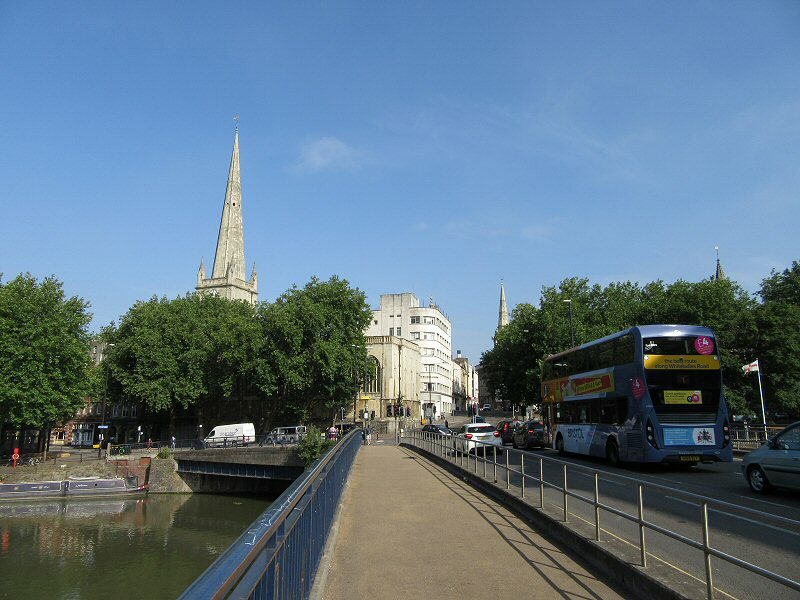 The image below shows the Avon towards the bottom of the lobe and the bus came into the town over a bridge that is just beyond the bend. 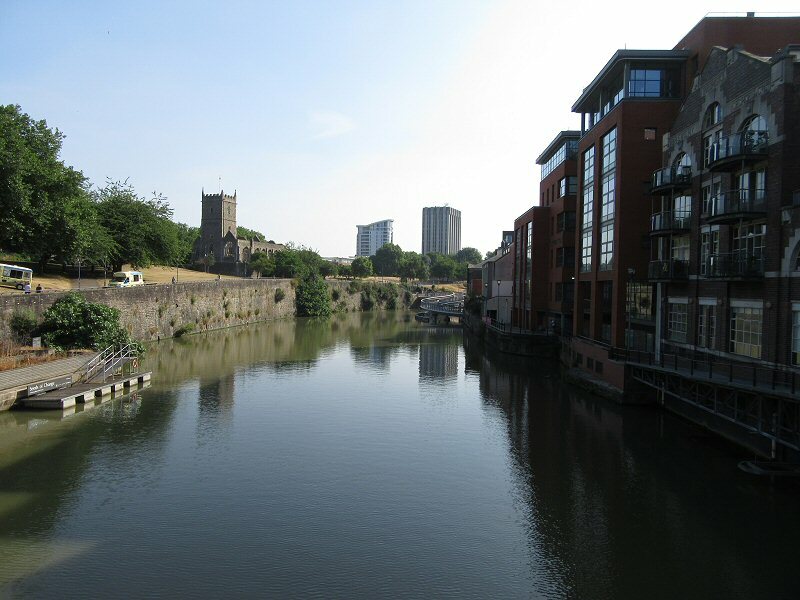 Having crossed the Avon at the Workman Bridge I now had a longish walk along the banks till I reached the cemetery. It was a pleasant walk because the area was very beautiful, and of course the sun was shining like crazy. I was actually quite grateful for the shade. The bridge in the image above is the one I had just crossed and I was now in a public park called Worksman Gardens and there was one piece of public art that really struck me. Called Whale Bone Arch, it features a carved Bowhead Whale (Greenland Right Whale) and it was based on a set of real whalebones that used to be on display in Evesham. The arch is the same size as that of a real whale, and it was created by Steven Cooper and the whale was carved by Tom Harvey. The original bones are at the Evesham Hotel. And in the distance was the bridge I had come across with the bus. In my original navigation I had considered walking down to this bridge and crossing back into town and walking back to the bus stop, but had scrapped the idea. The cemetery was in sight! and there were 41 graves to find: 10 from WW1 and 30 from WW2 (and one that is maintained by CWGC). It is not a large amount, but somedays a single grave can keep you searching for hours. The WW2 graves were mostly laid out in a small cluster of 23 graves, and they were mostly airmen and Canadians. The other graves were scattered throughout the smallish cemetery, but unfortunately I could not find the one private memorial from WW1, the graves are not marked and legibility was poor in the one area where I suspected the grave was. Gravehunting over, it was time to head back to town and considering my bus back to Tewkesbury. 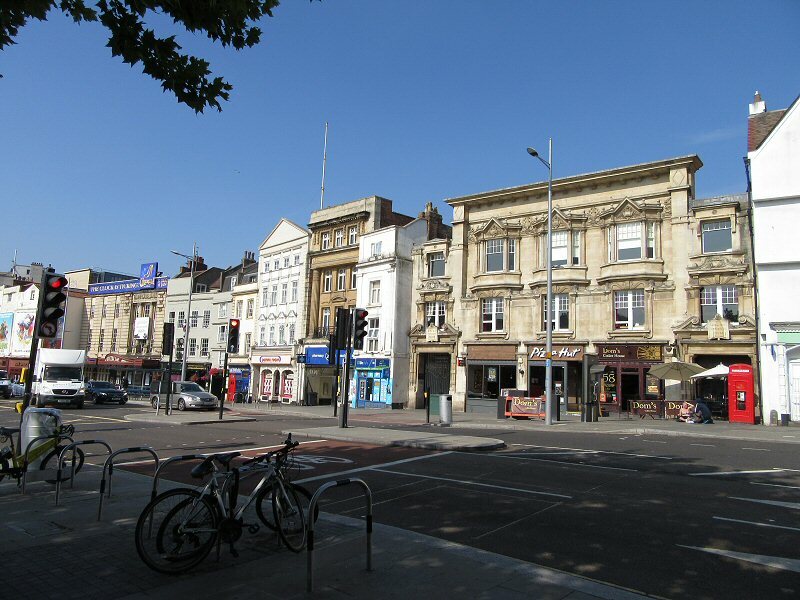 I leisurely strolled back towards town, enjoying the day and pleasant weather. 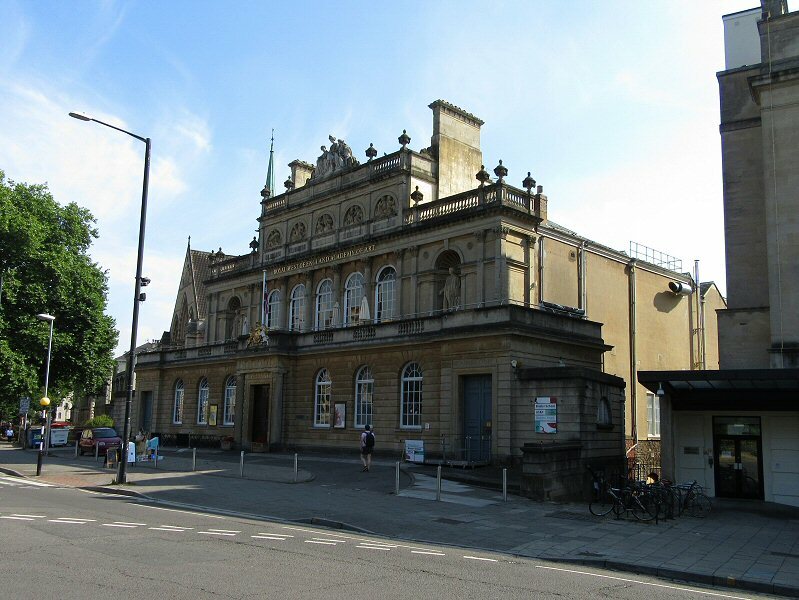 Evesham Methodist Church is situated on the one corner of the river bank next to Workman Bridge, and it is a very pretty building too. There were a lot of people about though and it was heading towards 11 am. The bus was leaving at 11H48 with the next one scheduled for 12H48. 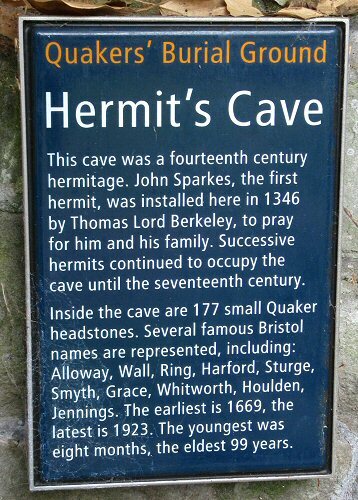 I had just missed the one so would get the next one, leaving me enough time to find the Quaker Burial Ground. 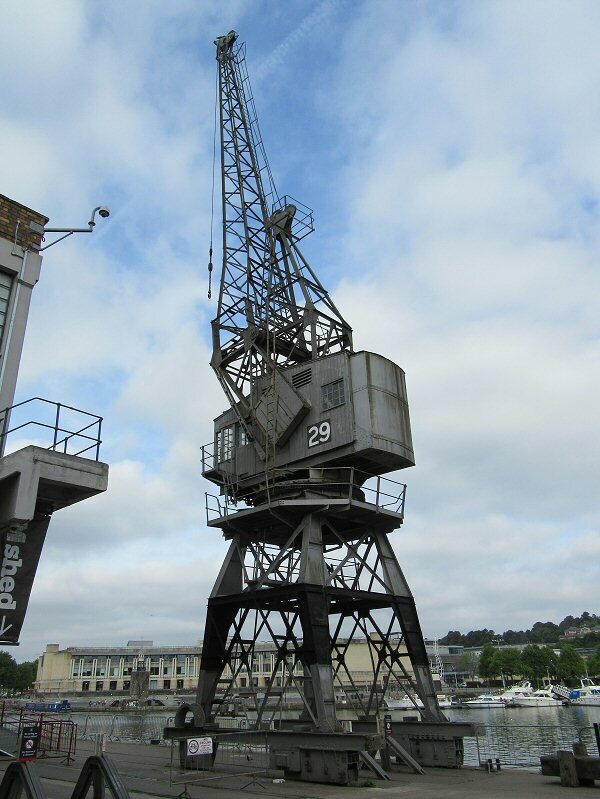 I had first seen one of these in Southampton way back in 2013 and it had been a very pretty place. 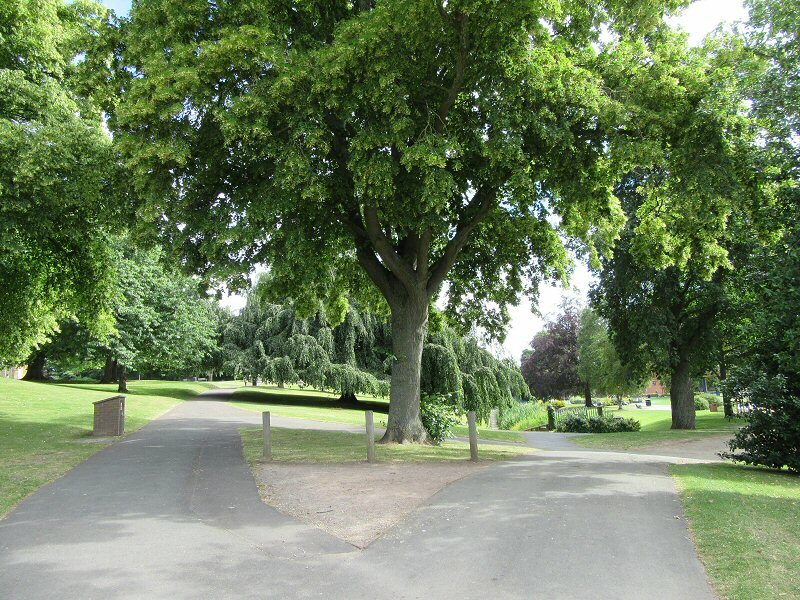 We have a Society of Friends Burial Ground in Tewkesbury, but it was not recognisable as a graveyard. Personally I find them very interesting people of enormous faith and courage, so finding another burial ground was a good find. 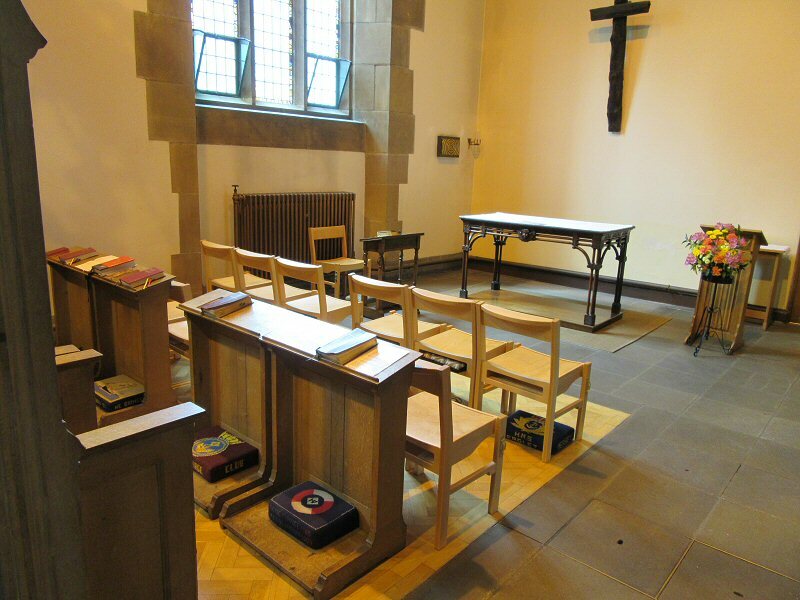 The history of the Quakers in Evesham may be found at their website. 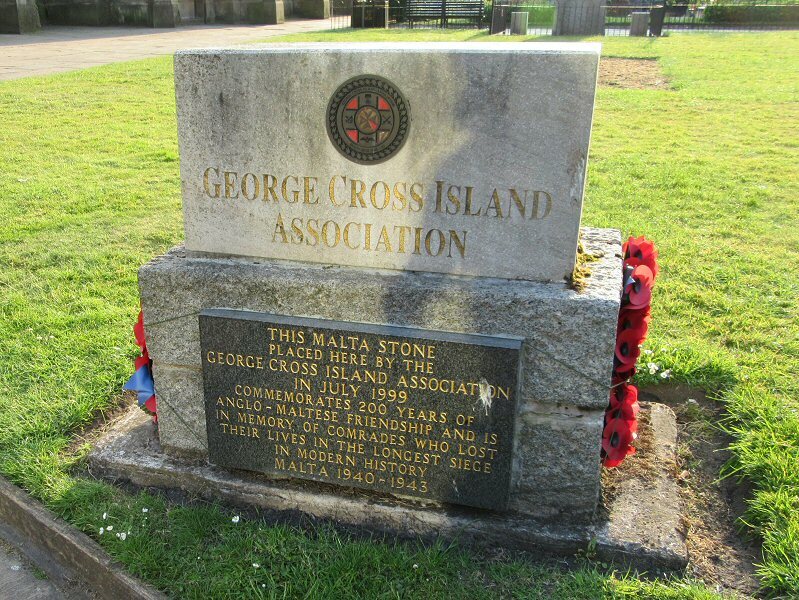 There were a number of ledger stones laid flush with the grass, the oldest one I saw was from the 1830’s, and there was a burial from the 2000’s in the “peace garden” too. Unfortunately I did encounter one person and I got the impression that it was time to leave as I was disturbing him. It is a pity because I really would have liked to have found out more about the burials. I was back in town now and located the bus stop and visited that shop I mentioned in the first part of the blog, and it was a real treasure house of goodies. 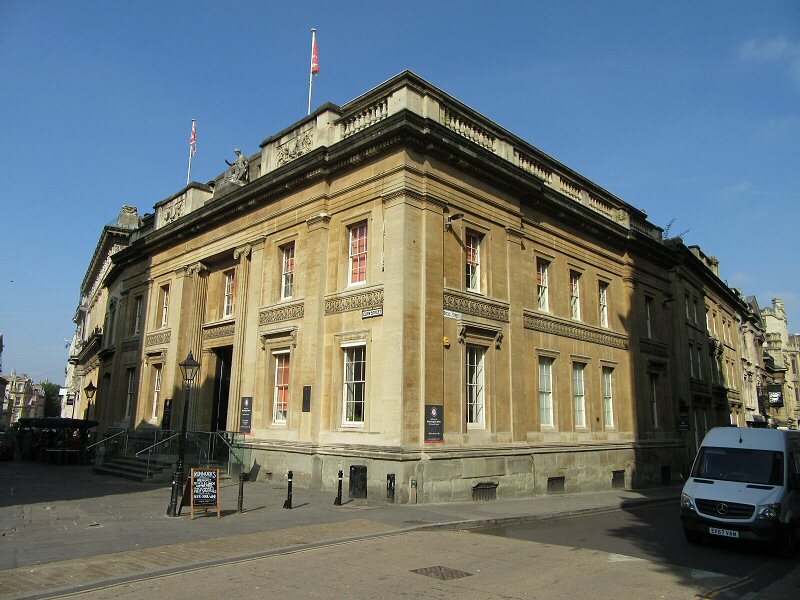 There are a number of things I need to explore further in Evesham, for starters there is Evesham Vale Light Railway, and of course tracking down the whale bones at the hotel and visiting the Almonry Museum and relooking the Abbey area. There are still a few reasons to return to Evesham, and possibly explore Stratford upon Avon as I saw buses tagged with that city in town. The £4 bus fare is well spent, and certainly cheaper than the bus to Cheltenham. 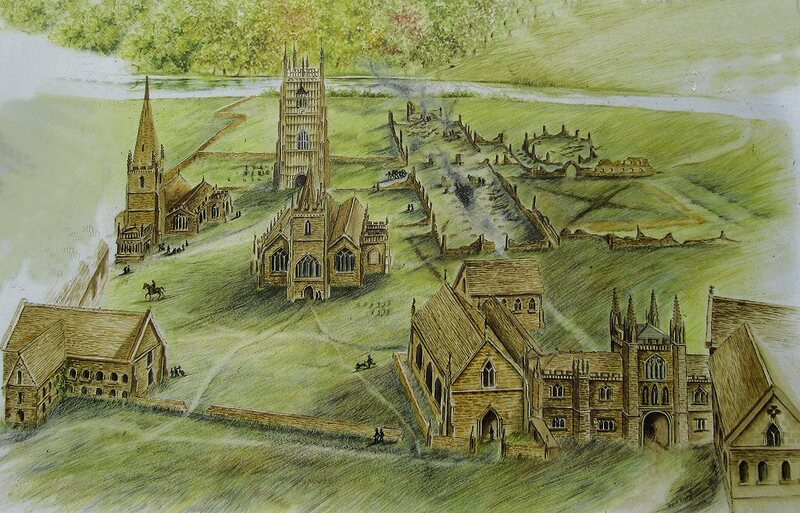 How does Evesham feature in the Domesday Book? Taxable units: Taxable value 3 exemption units. Payments of 1.0 rent. Value: Value to lord in 1066 £3. 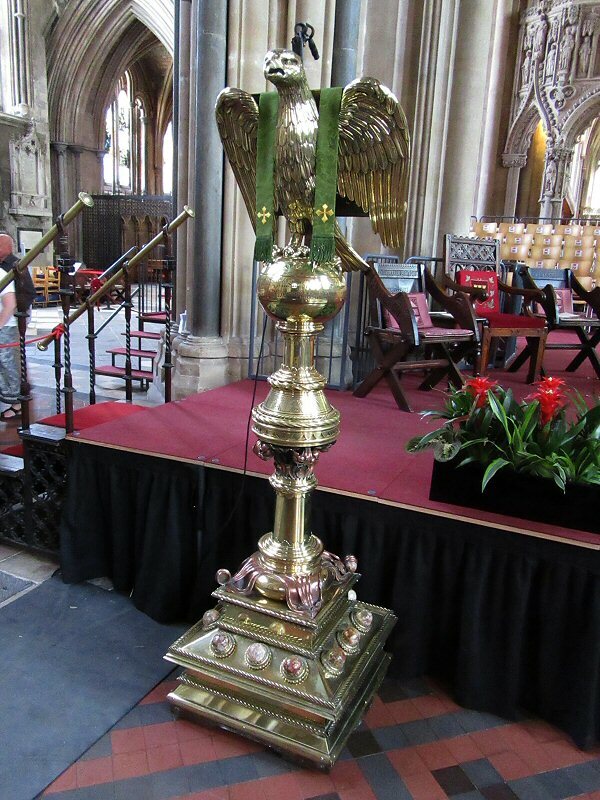 Value to lord in 1086 £5.5. Value to lord c. 1070 £4. Ploughland: 3 lord’s plough teams. 4 men’s plough teams. 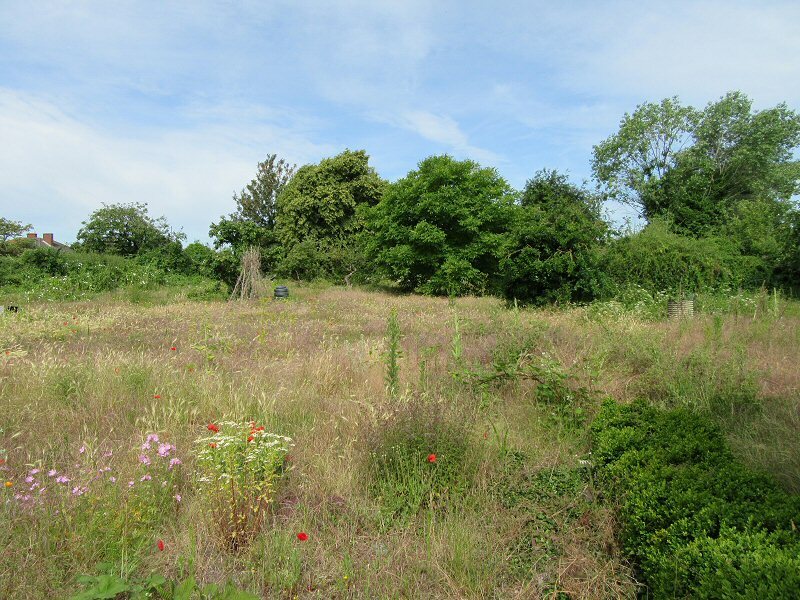 Other resources: Meadow 20 acres. 1 mill, value 1.5. 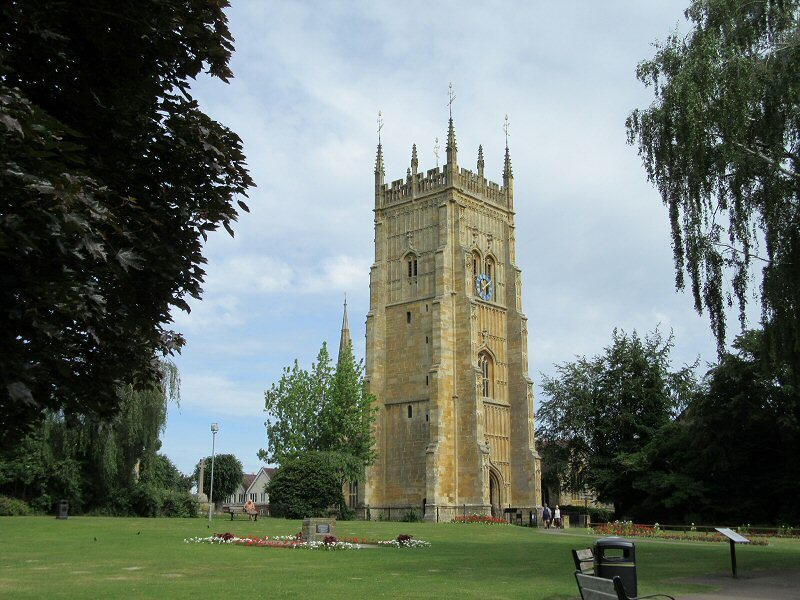 Lord in 1066: Evesham (St Mary), abbey of. 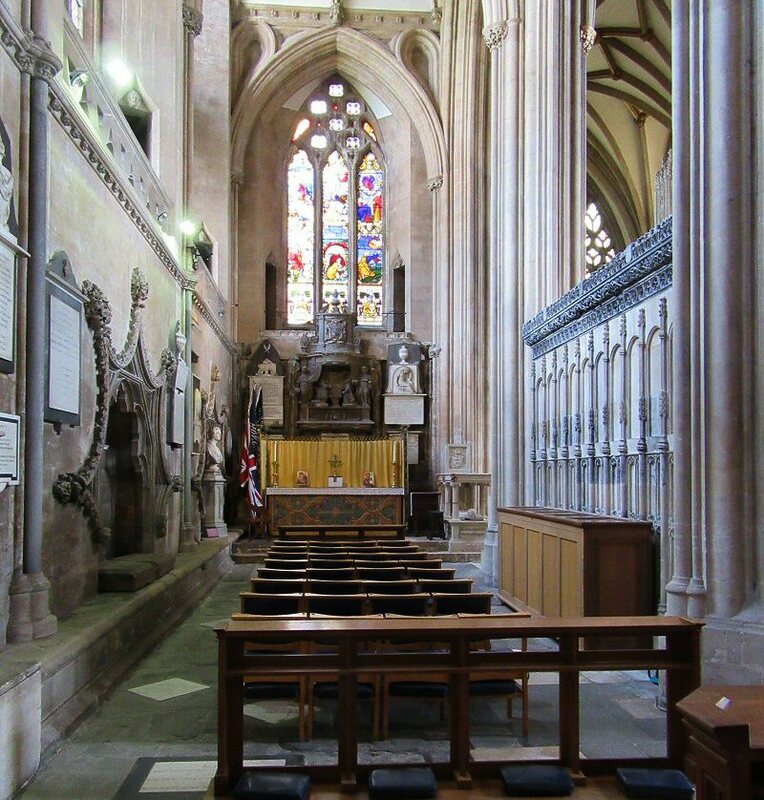 Lord in 1086: Evesham (St Mary), abbey of. 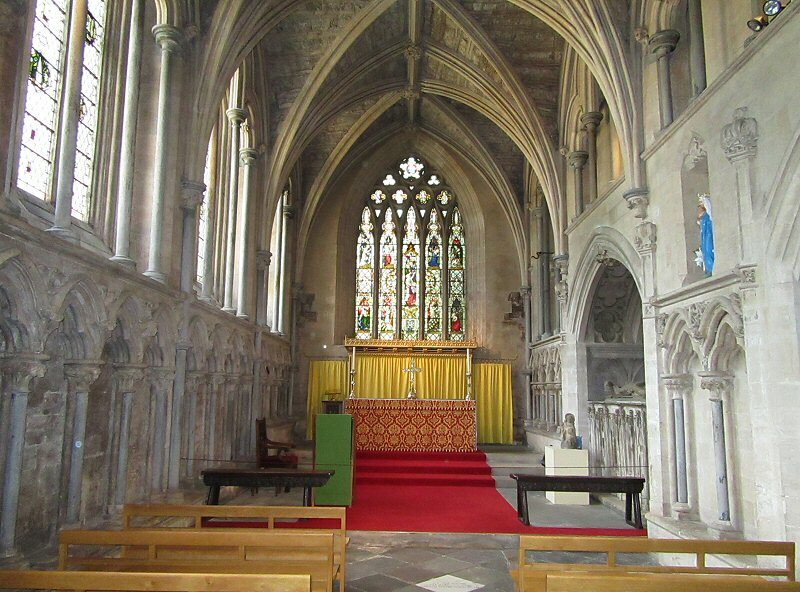 Tenant-in-chief in 1086: Evesham (St Mary), abbey of. And that was Evesham in a nutshell. 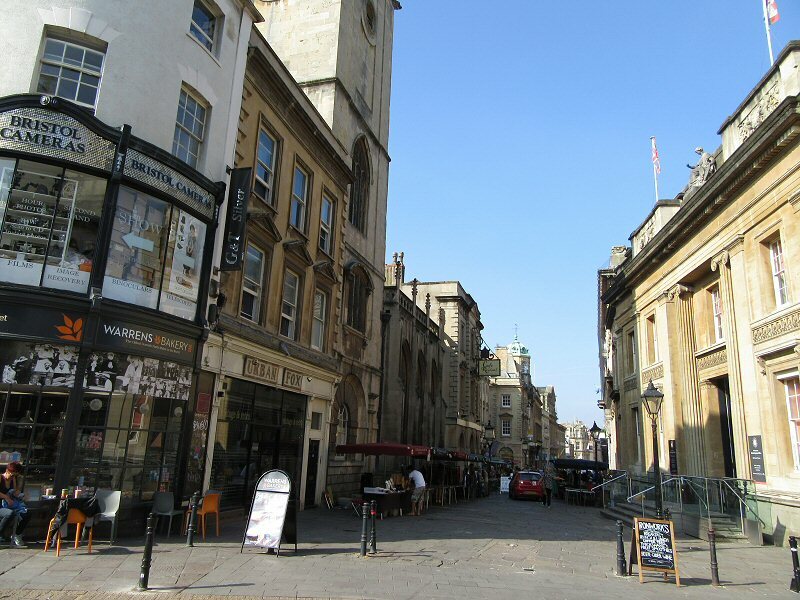 I really enjoyed my visit and it was a very pretty place with wide pavements and interesting historical artefacts. 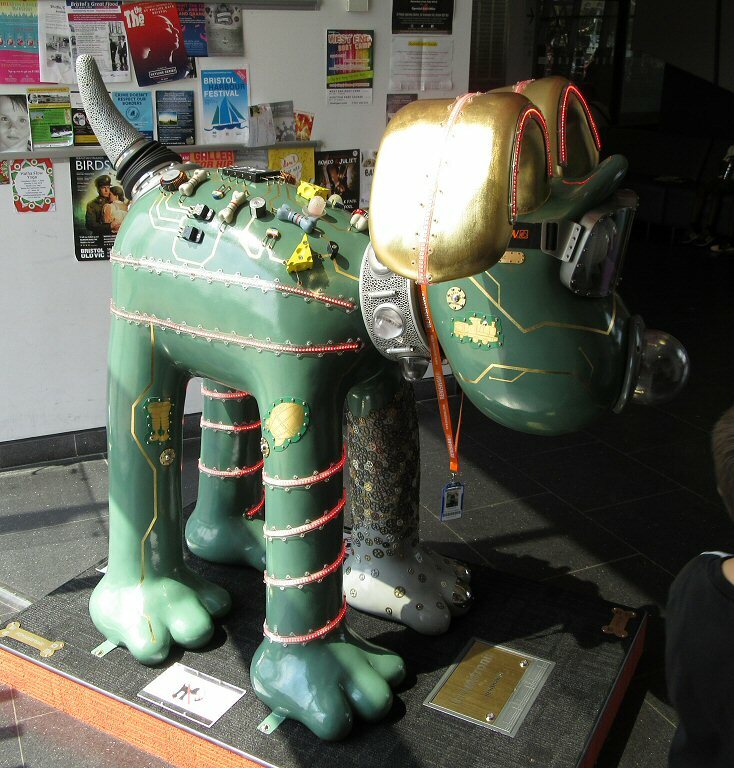 And, as such I will leave you with some random images of my visit. See you again Evesham.